On Friday we will be celebrating the end of our 'Supertato Topic'. 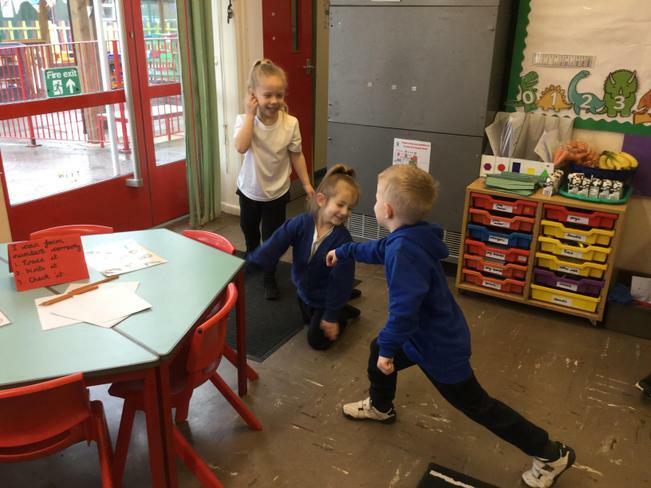 The children in Owl Class can come to school dressed as their favourite superhero! 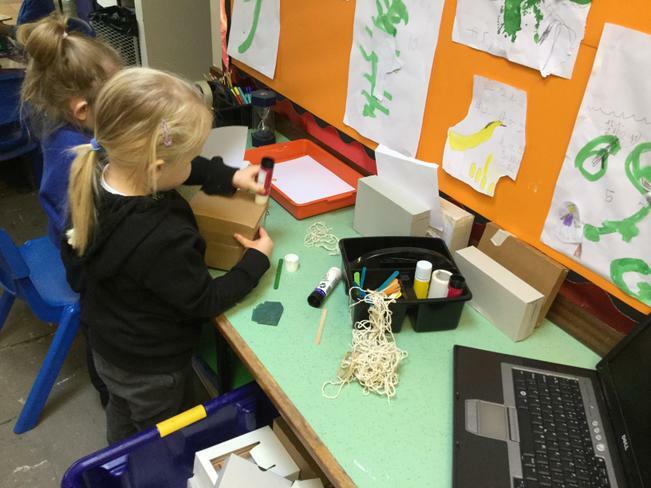 Our doors will open at 2:35pm, ready for the children to share their learning with parents and carers at 2:40pm. We hope as many of you as possible can come! 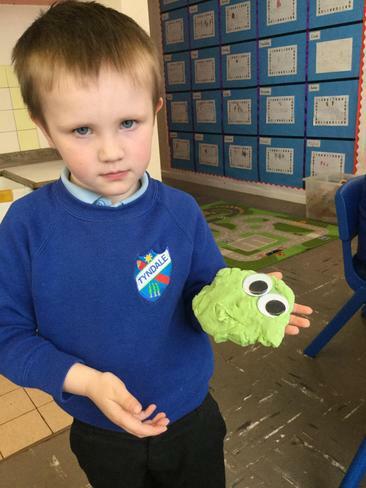 This week in Owl Class the children have been exploring our third Supertato story - 'Veggies Assemble!' They have once again thoroughly enjoyed this story - listening carefully, retelling, and sequencing events. 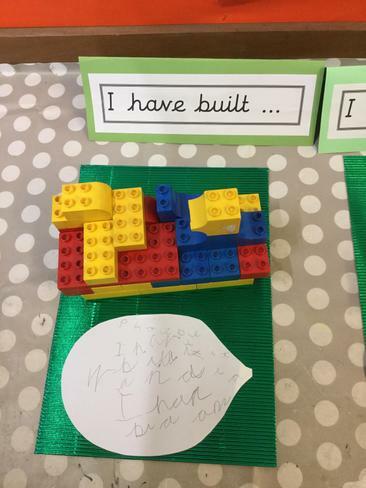 They have created story mountains, written speech bubbles for different characters and written sentences about the story too. 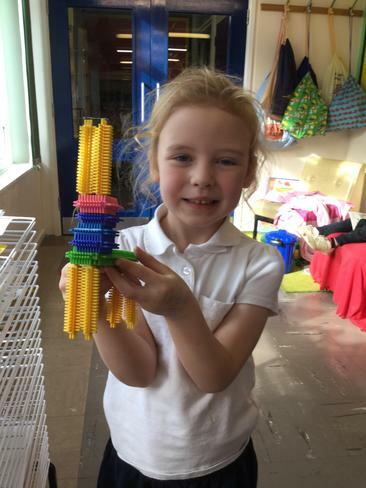 In Maths, the children have been exploring ways to make 10. 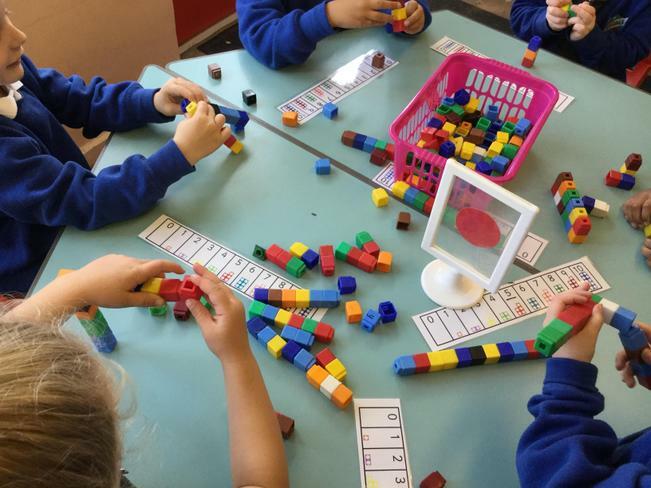 They have used bricks and numicon to help them find all the number bonds to make 10 eg, 9+1=10, 7+3=10. 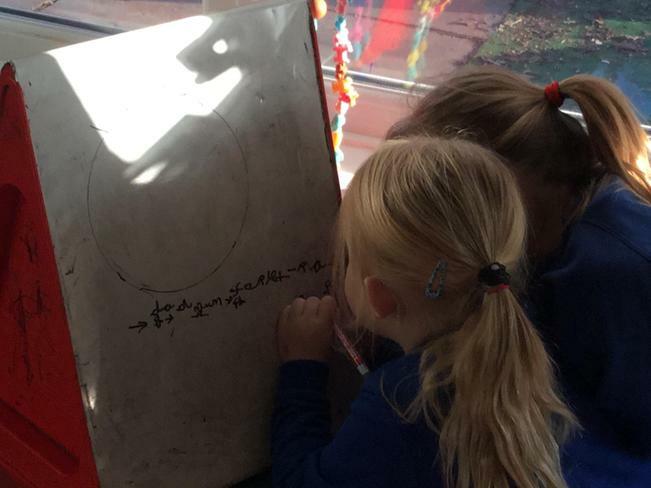 The children also explored reversing the numerals in the addition equation and found it made the same answer eg, 4+6=10 and 6+4=10. 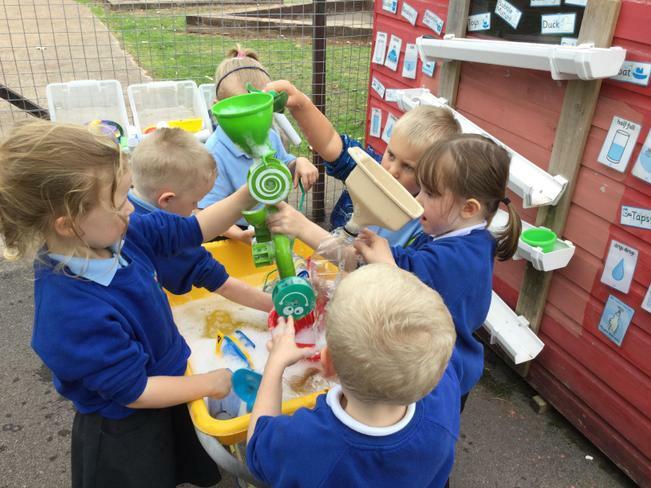 The children have been enjoying the sunny weather this week and we have had our sand pit open, also the diggers in the gravel and our new water tray out too. 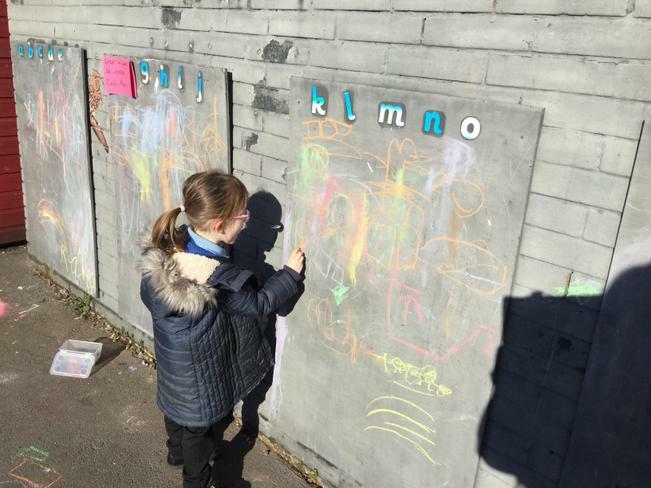 The children have shown a keen interest in the new sounds and numbers which have been displayed in our outdoor learning area this week too. 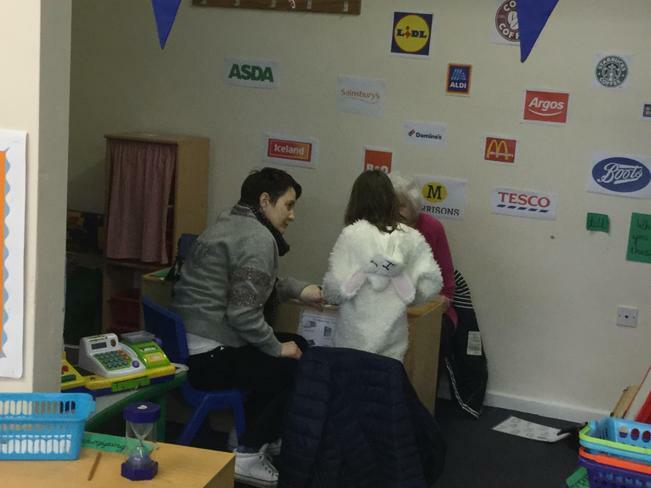 This week in Owl Class the children have been enjoying role play in our Tyndale Shoe Shop. 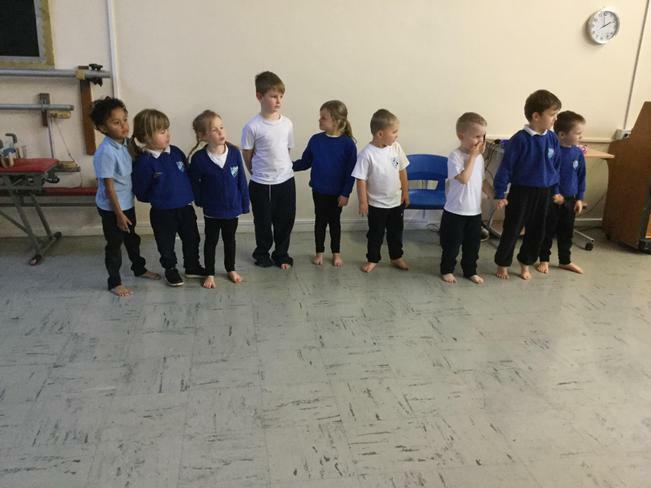 The children have taken on the role of both the shop keeper and the customer, and have been busy measuring each others feet and trying on a range of shoes. 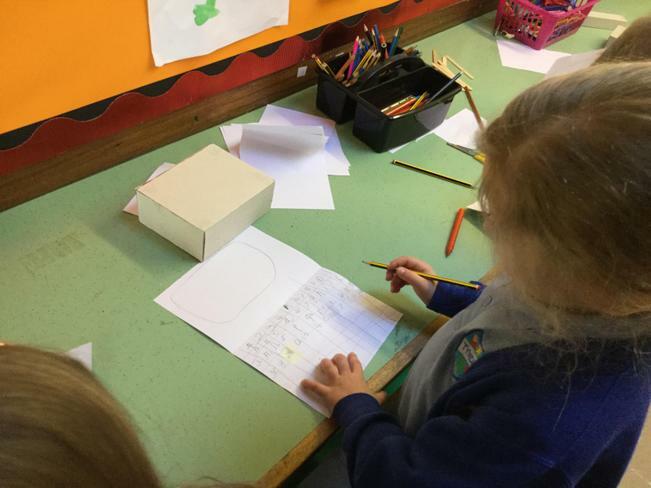 In English, the children have done shared writing for the beginning, middle and ending of a new 'Supertato' story. They thought carefully about how changing the characters and setting would alter the plot for the story. 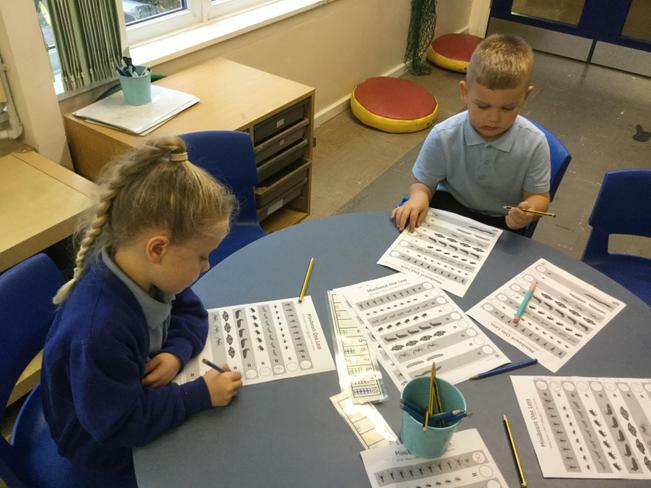 The children are also beginning to do sentence checks where they look for capital letters, finger spaces and full stops. 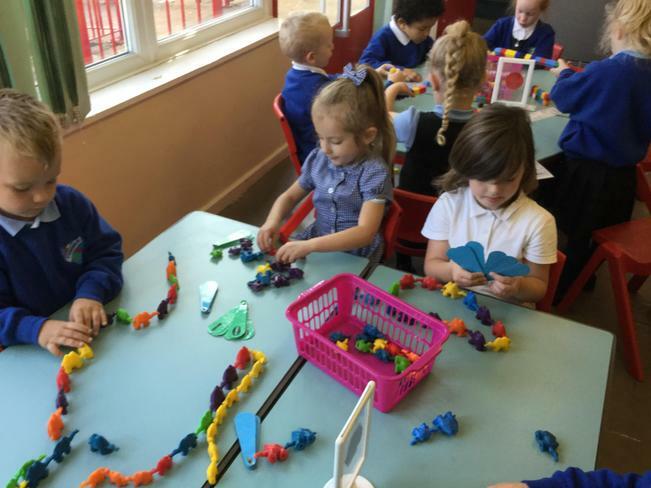 In Maths the children have been exploring the Numicon and part, part ,whole to find ways to make numbers (number bonds). 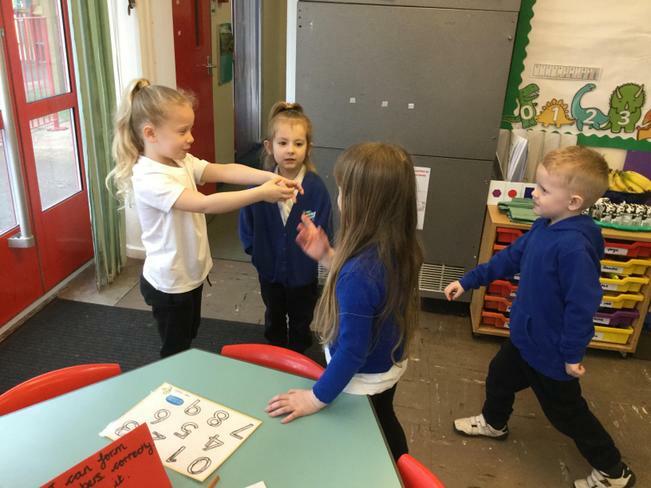 The children have also been practicing their number formation. 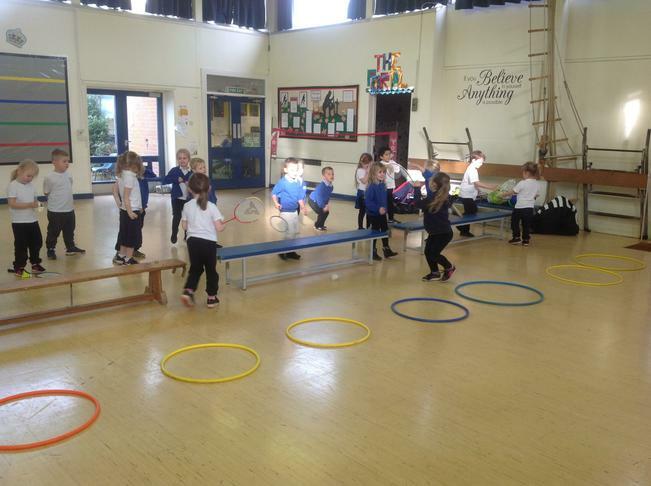 In PE, with Mrs Smith the children have been using the apparatus and learning how to move in a variety of ways. They has also learnt how to land when jumping off the equipment. 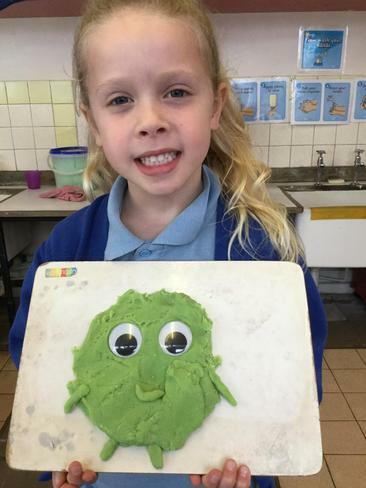 This week in Owl Class the children have been introduced to a second 'Supertato' story entitled 'Evil Pea Rules'. 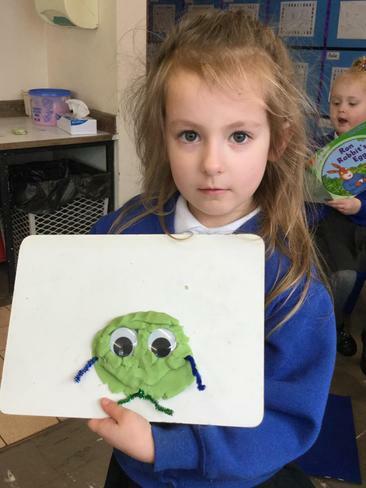 The children have thoroughly enjoyed finding out about Evil Pea's second attempt - 'Operation Freezification' to capture Supertato. 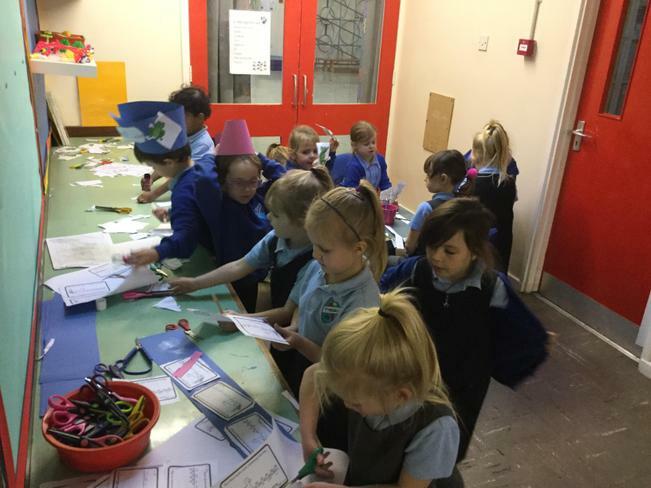 The children have listened to the text, retold the story by role playing and drawn their own story mountains to help them sequence the events. 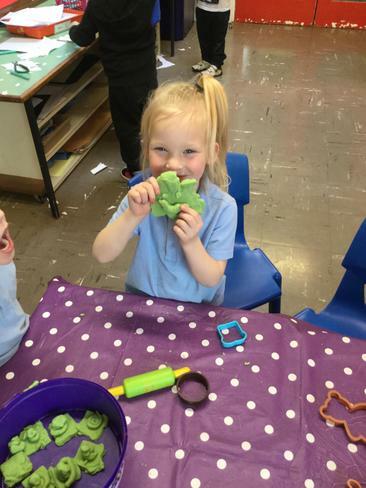 There has been green 'minty' scented play dough in our creative area this week and a variety of Evil Pea's have been created. 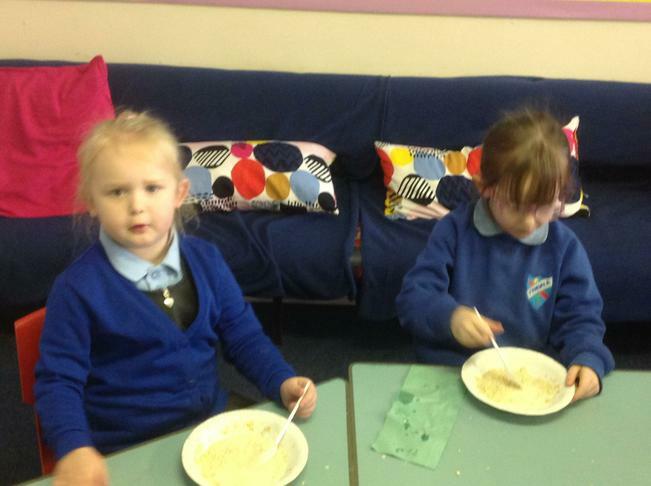 The children also used their making skills to build 'Icy thrones' for Evil Pea to sit on. 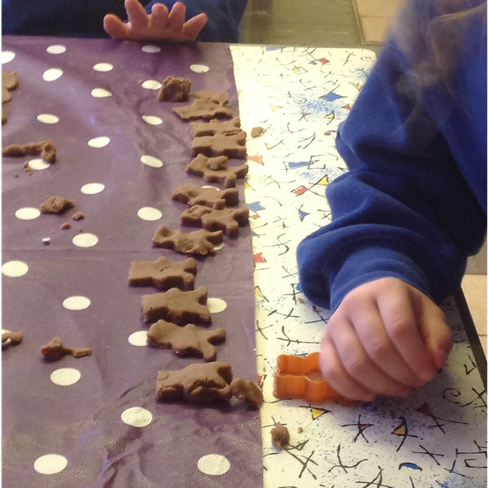 In Maths the children have been learning about subtraction. 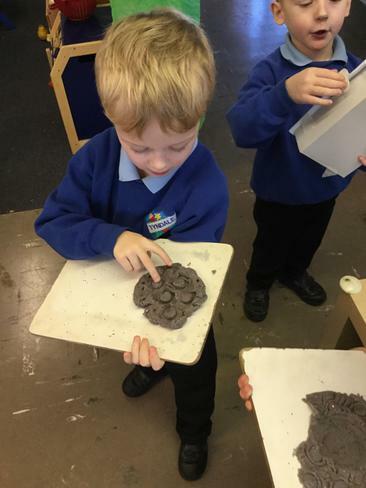 They have explored this practically by using bricks, shown this pictorially using circles and crossing out the ones being subtracted. They have even been able to solve subtraction equations by counting back on a number line. 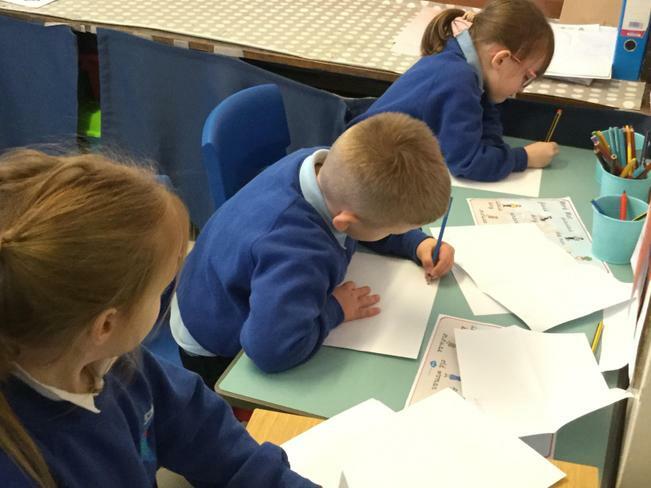 In their Maths books Owl Class have squared paper and have tried very hard to write one number in each square. 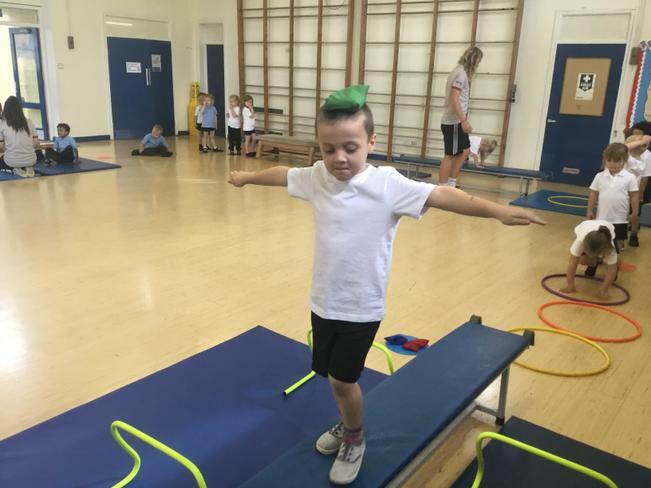 The children used the apparatus in PE with Mrs Smith and were showing good turn taking, balancing, jumping and landing skills. 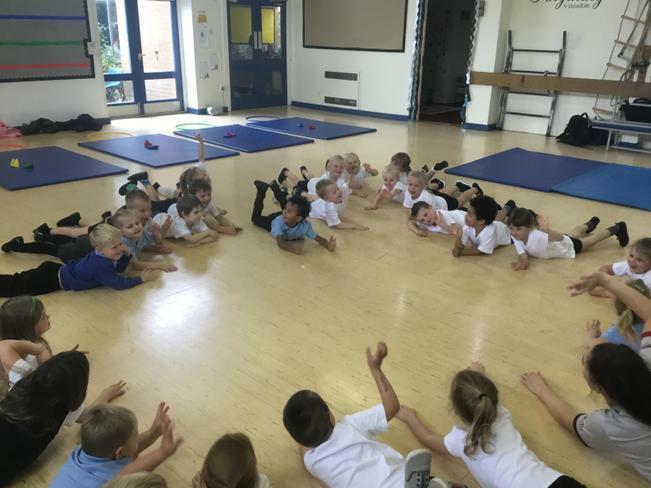 Owl class attended their first assembly in the Key Stage 2 hall and thoroughly enjoyed watching the year 6 class assembly. 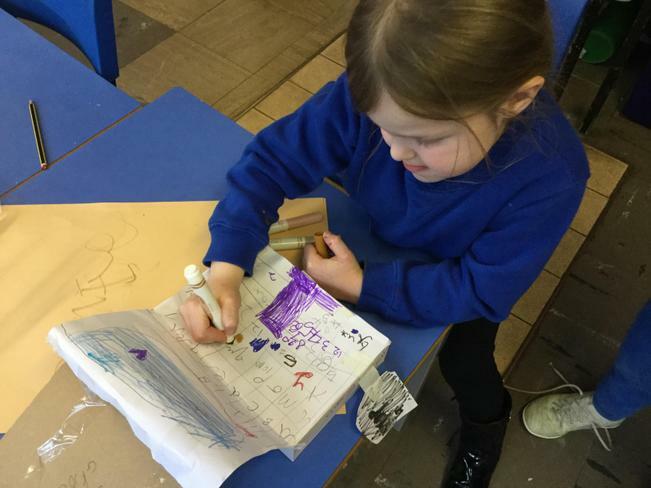 Your child will have bought home their 'Tricky Word' book this week. In this book there are 5 words that they need to learn to read - some are readable by sight and some can be blended. Your child will read these to an adult when they read during the week. 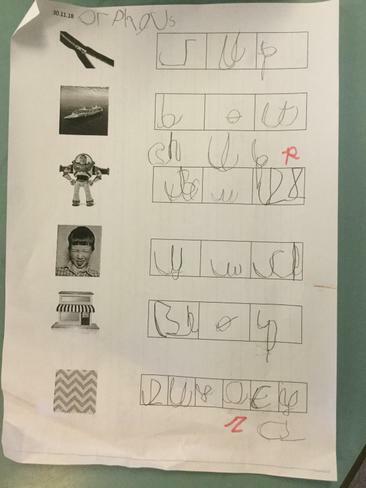 (Please note your child is not expected to learn to write these words at this stage). Once your child can read some or all of their words they will be issued with new ones to practice at home. 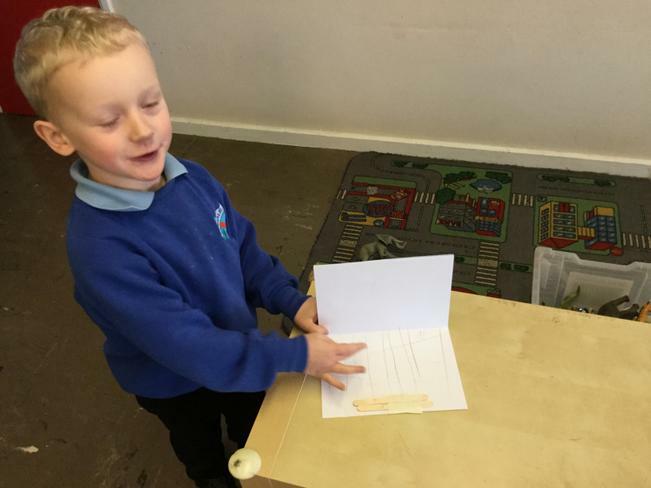 This week the children have talked about the types of shops they have visited. 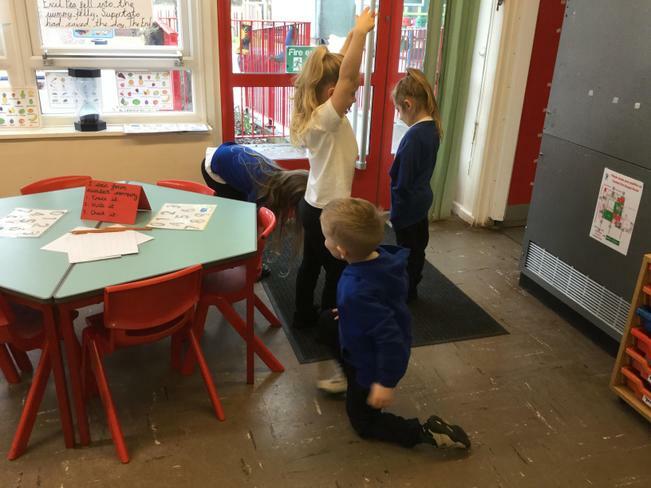 Our role play is currently a supermarket, and the class were asked what shop they would like our role play area to become next week - they chose a shoe and clothes shop! 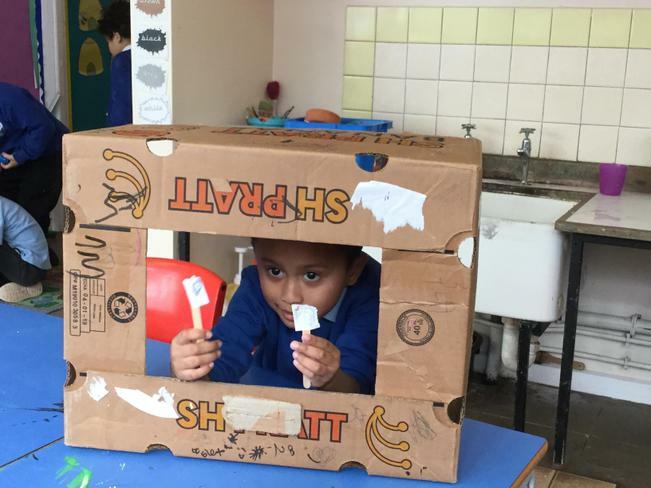 As we don't have many surplus shoes in school, we would be very grateful if you could help us support the children in their learning by bringing in any shoes, in a range of sizes that are no longer needed. Any empty shoe boxes would also be appreciated! 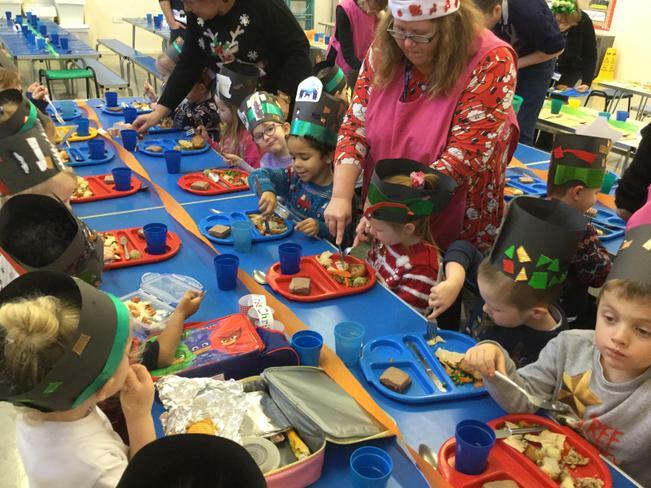 On Thursday and Friday next week both Mrs Milverton and Mrs Beazer will be out of class. 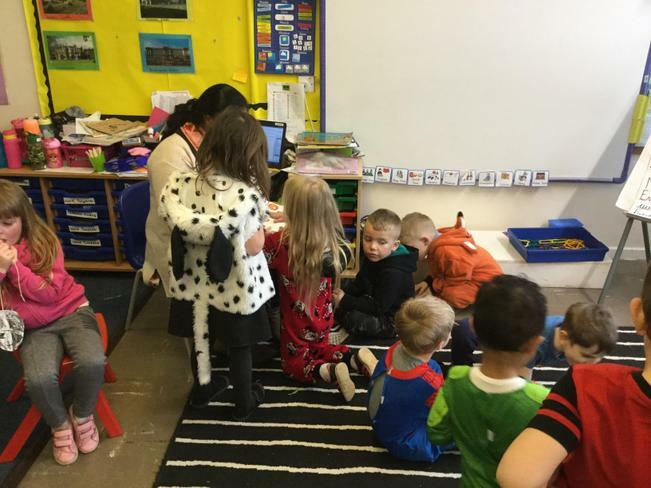 Owl class will have Mrs Smith both days as their class teacher and Mrs Shar as their teaching assistant (who they have met before on World Book Day). This week in Owl class the children have been writing about our 'Supertato' story. 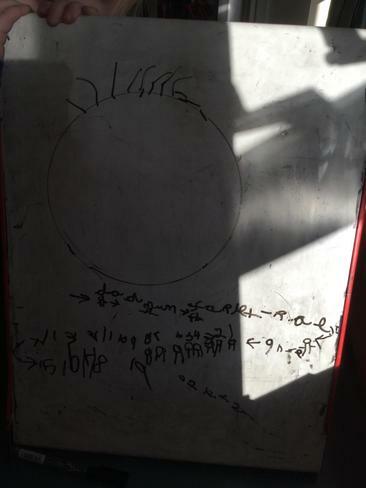 They have been learning how to structure a story with a beginning, middle and end. 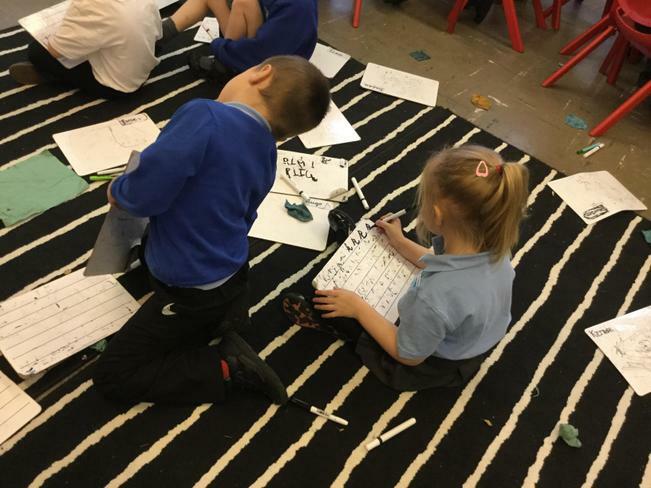 In our shared writing the children enjoy completing a a sentence check - looking for capital letters, finger spaces and full stops. 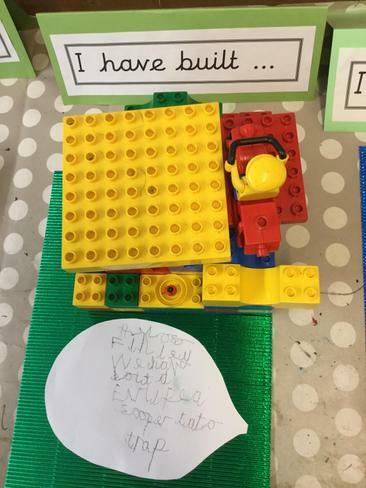 The children now have a daily challenge when they arrive at school - to write a sentence on where Evil Pea is hiding! 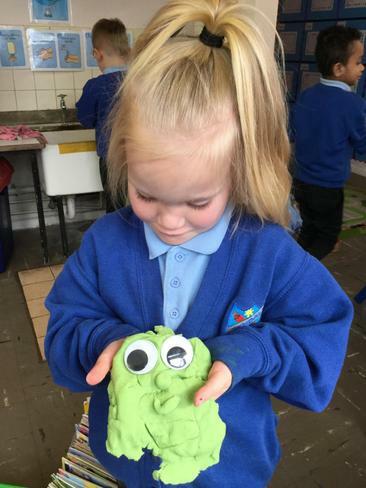 They have great fun looking for our character made by Mrs Beazer! 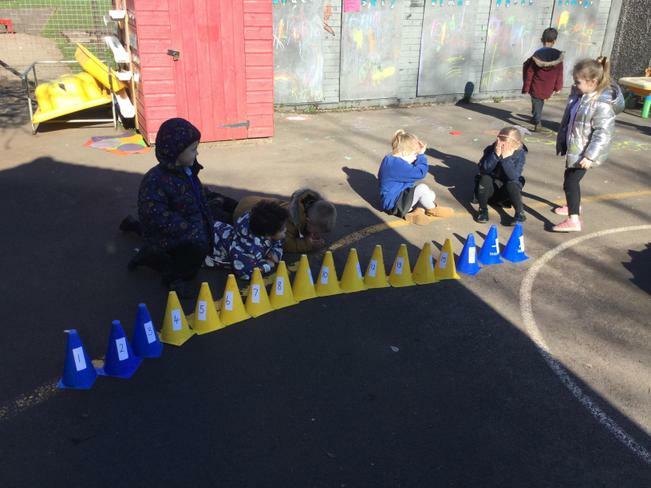 In Maths, the children have been learning about time. 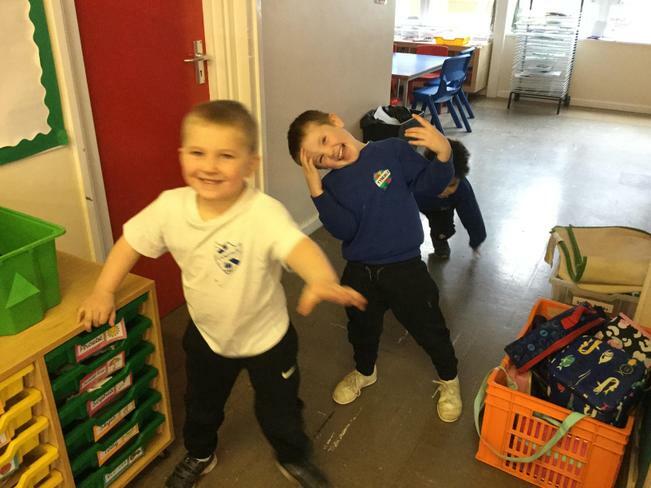 They learnt the days of the week song and have been singing it every day. They have learnt about yesterday, today and tomorrow. 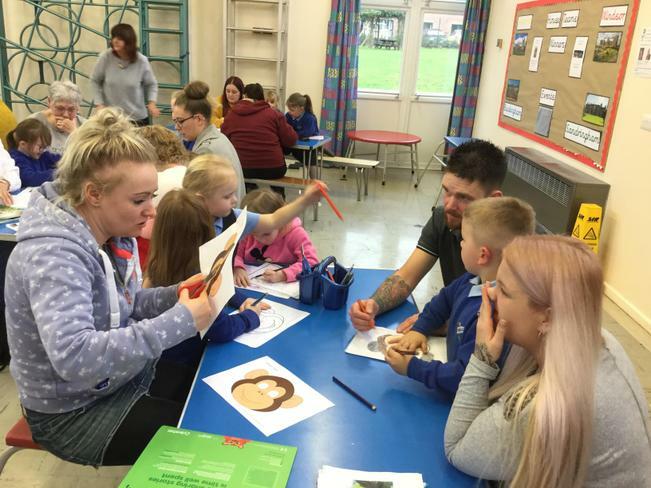 The children also talked about all the things they do in the morning before arriving at school and sequenced a set of pictures. 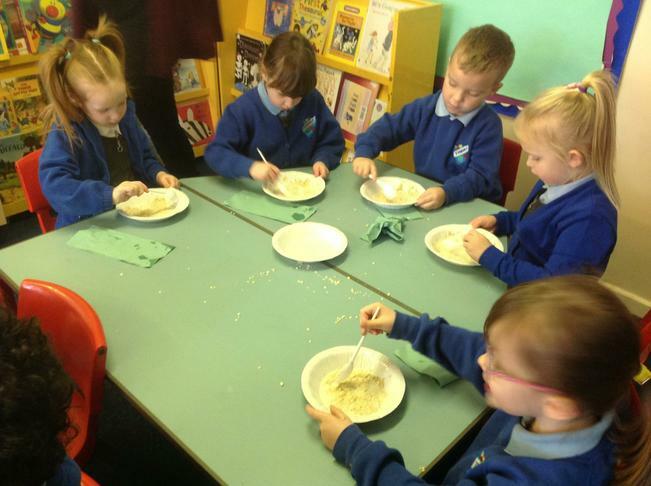 We discussed how to make a sandwich and the children used the language 'first, next, then, after that, finally'. 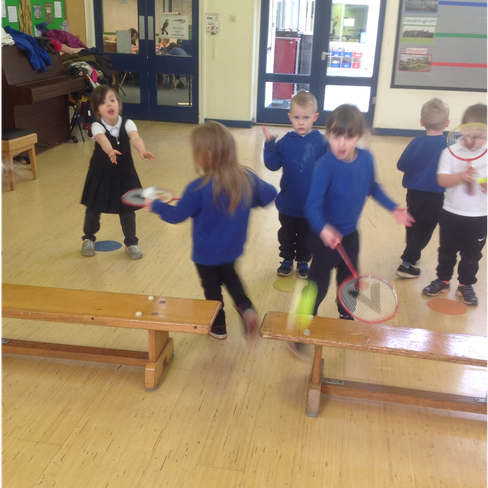 The children used clocks in their activities throughout the week and began to talk about the time using o'clock. 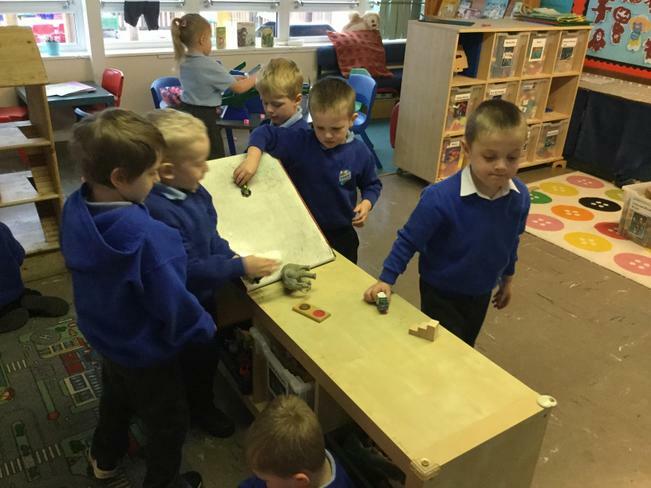 The children have continued to play cooperatively in our supermarket and have been writing their own shopping lists. 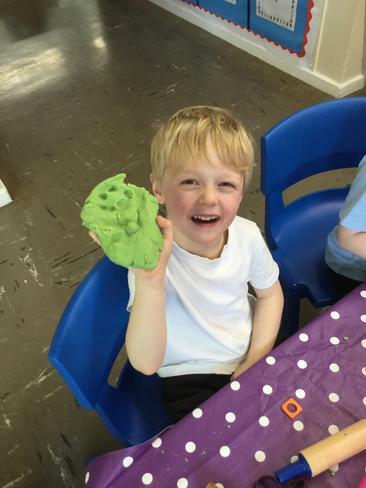 They have enjoyed the play dough and made Supertato and Evil Pea characters. 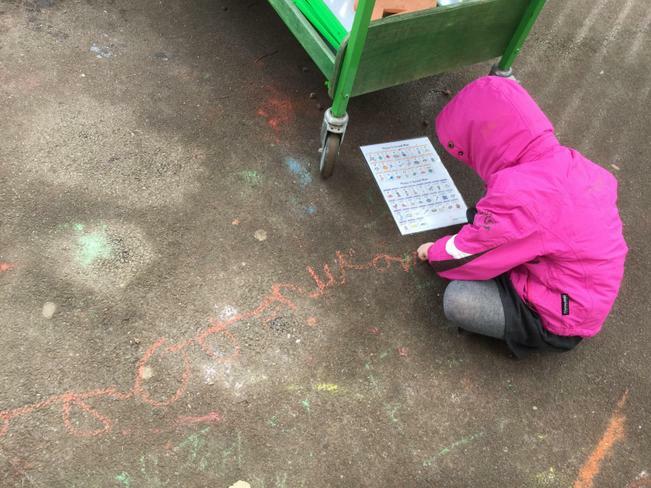 Outdoors splatting the tricky words and writing them has been a very popular activity this week as has building a trap for Evil pea too. Thank you to all our Parents and Carers who took the time to dress the children up as animals for World Book Day. 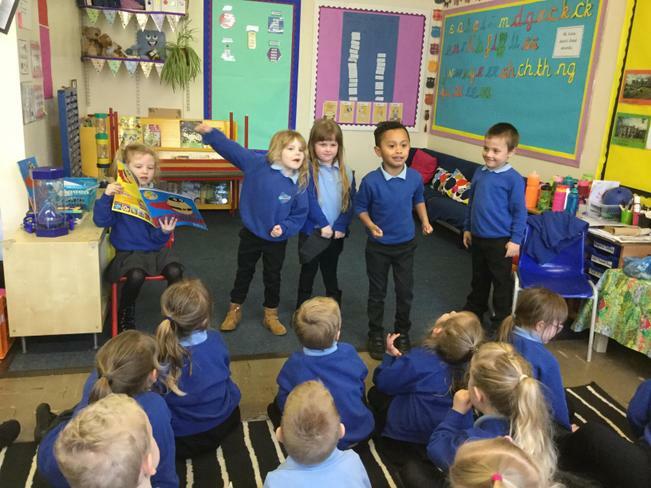 The children enjoyed telling each other what animal they were and which story they were from. 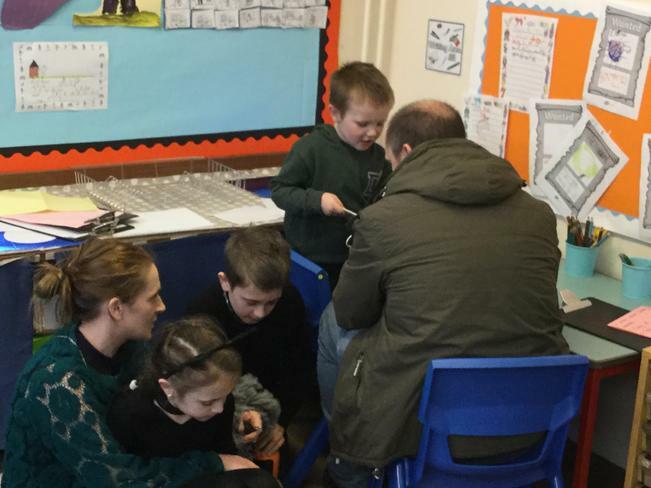 Our reading session was very popular and thank you for finding time to come and share books in our classroom - it was so lovley to see whole families together with children from different class too. This week all children will be bringing home a small red book labelled 'tricky words'. In this book there will be five words taken from the 'first 100 high frequency words', and the children will read these to an adult when they share their reading book. As an incentive to the children, they will receive the number of house points for how many they can read independently. Some of these words can be chopped and blended, others are read by sight. Please can these books be kept in book bags along with reading books and be brought to school everyday. If you have any questions please speak to Mrs Milverton. 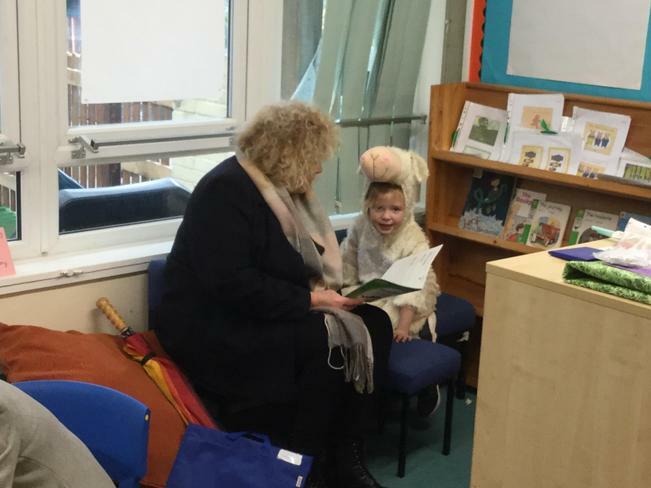 Please can your child bring their reading books to school everyday and place their book bag in their group box in the classroom.Thank you. 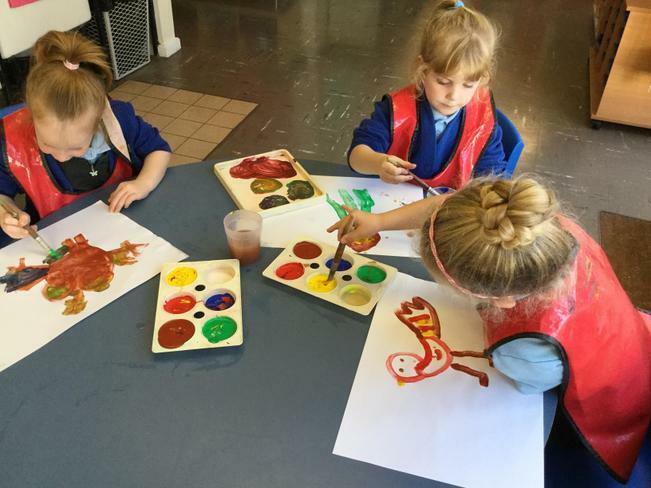 The children came back full of enthusiasm and excitement to the start of term 4. 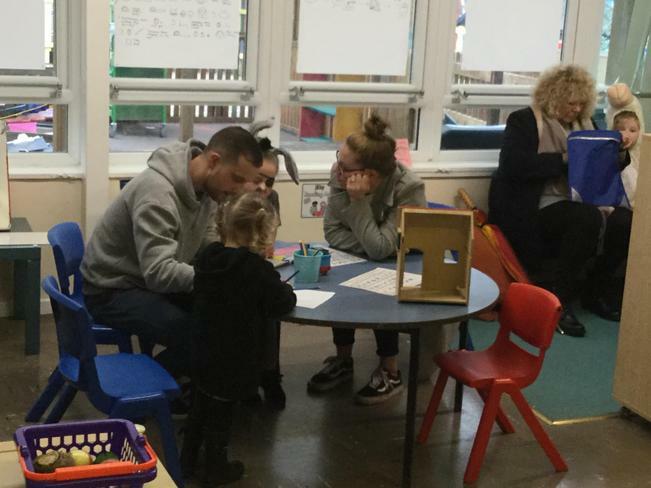 They couldn't wait to share all the lovely things they had been doing over the half-term break. 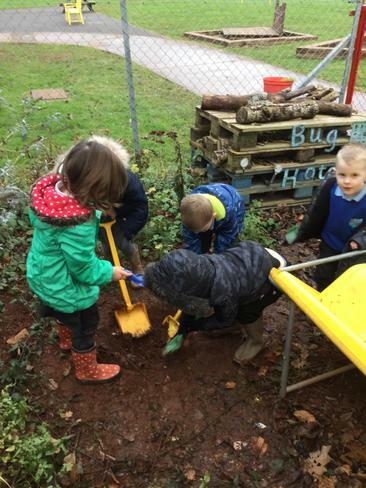 Thank you to those families who collected sticks and stones for our developing mud garden on your family walks during the holidays too. Also, many thanks for the family photos that have been sent in too. 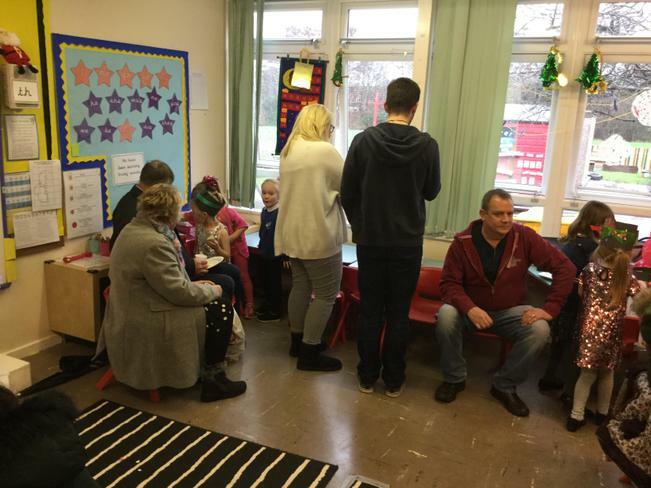 The children are really enjoying showing others and telling their friends all about the members of their family. 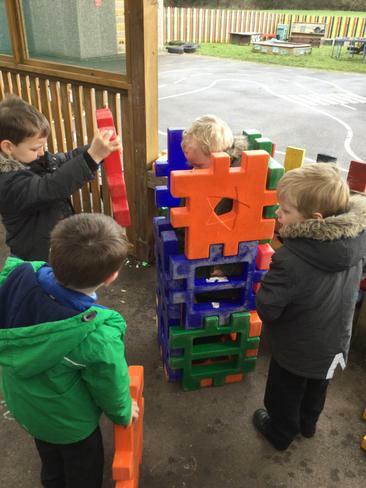 The children have returned to some changes in their learning environment, and have adapted very well to this. 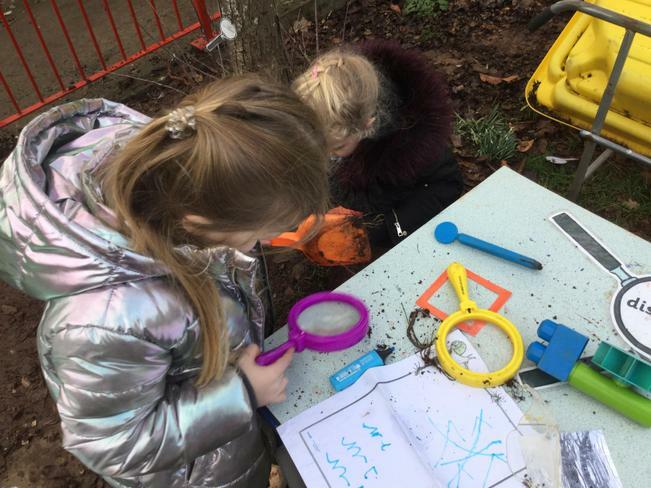 Now during English for example, the children are working with an adult either inside or outside and have a choice of four learning activities in each of these areas. 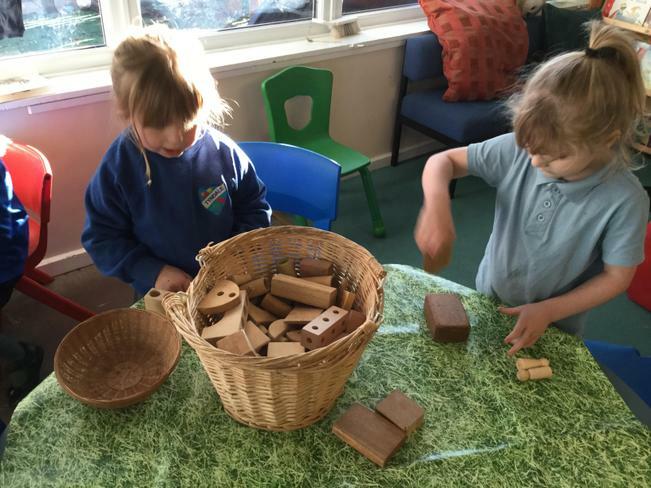 This continues with Maths and through to topic in the afternoons. 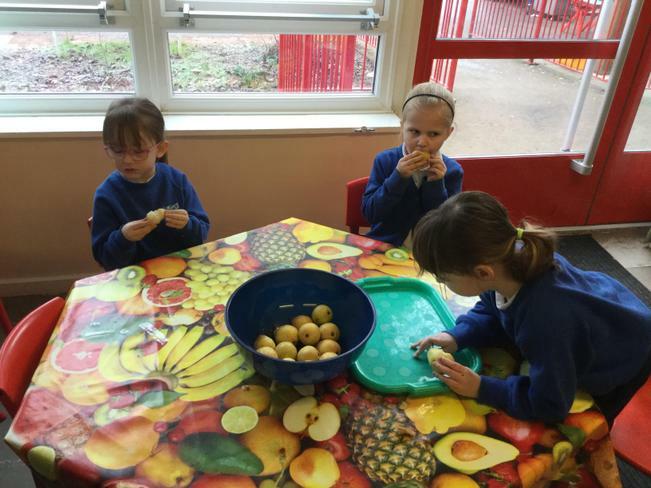 Our text for this week has been 'Supertato'. The children have thoroughly enjoyed this story and they have been immersing this story so they are secure in orally retelling it. 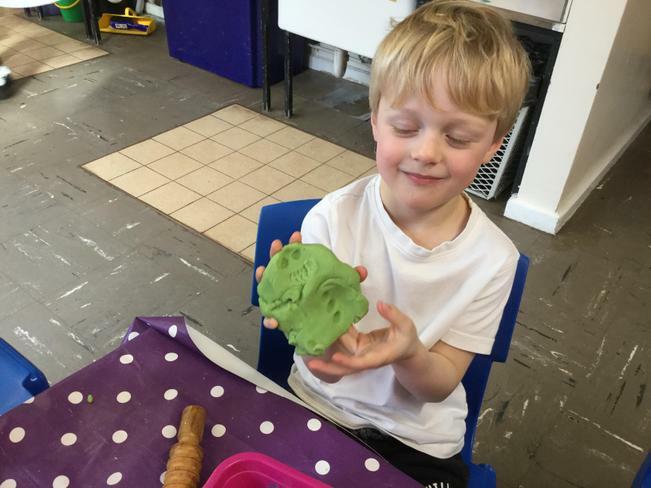 To support the immersion of the story the children have listened to the story several times, have sequenced pictures from the story, role played with stick puppets and even made playdough 'Supertato' characters. 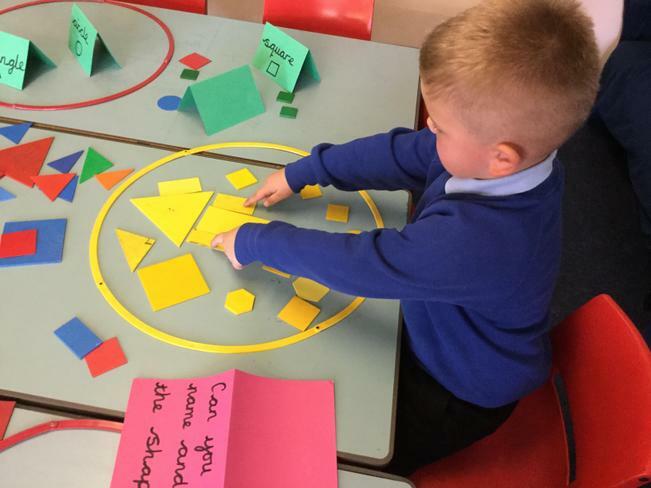 In Maths this week the children initially revised 2D shapes - circle, square, triangle, rectangle and hexagon. They were able to recall their names and describe their features. 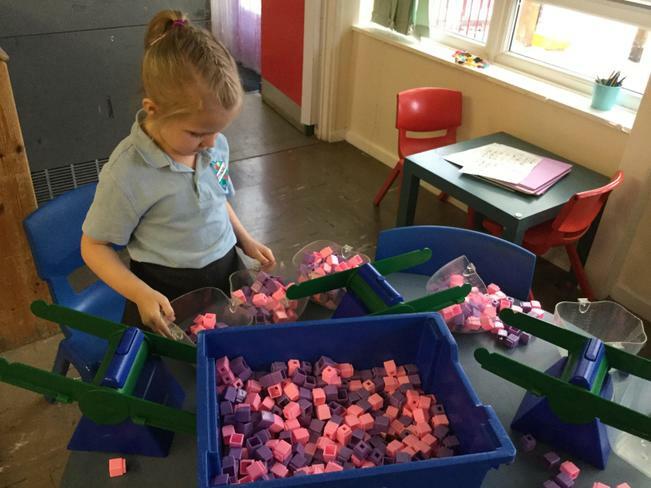 We then moved on to 3D shapes (cube, cuboid, sphere, cylinder, pyramid) and explored these through playing with blocks, sorting boxes and containers and even using polydrons to build our own 3D cubes. 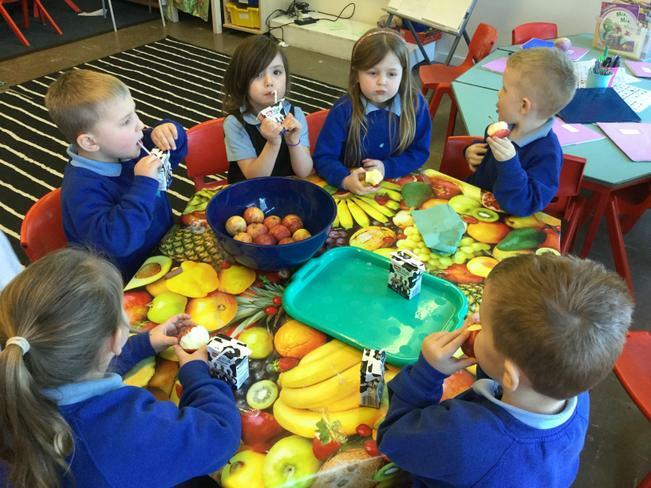 In topic this week the children enjoyed role playing in our fruit and vegetable shop. 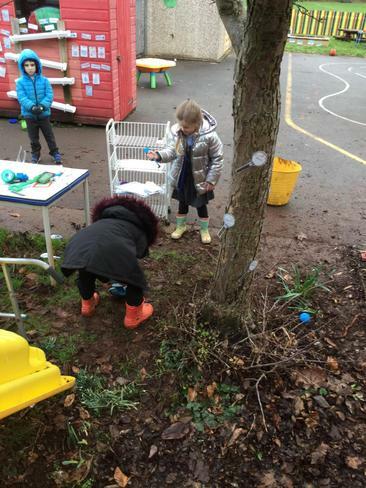 They learnt the names of the items on sale and even learnt where the products grow - on a tree or in the ground. 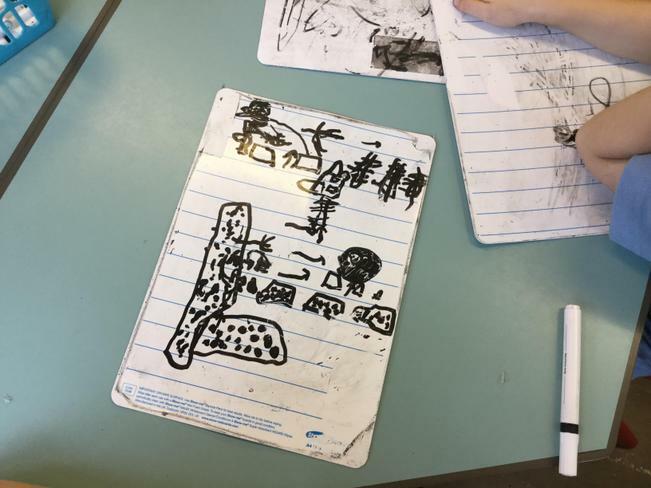 They were able to recall their learning from term 3 and explain what all the things needed to help them grow. 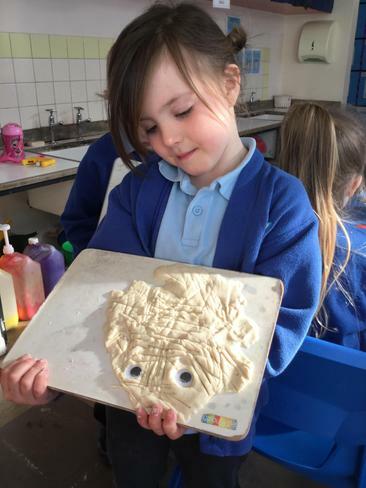 Our learning with 'Supertato' will continue next week, when the children will begin to think about the structure of the story and then begin to write their own versions. 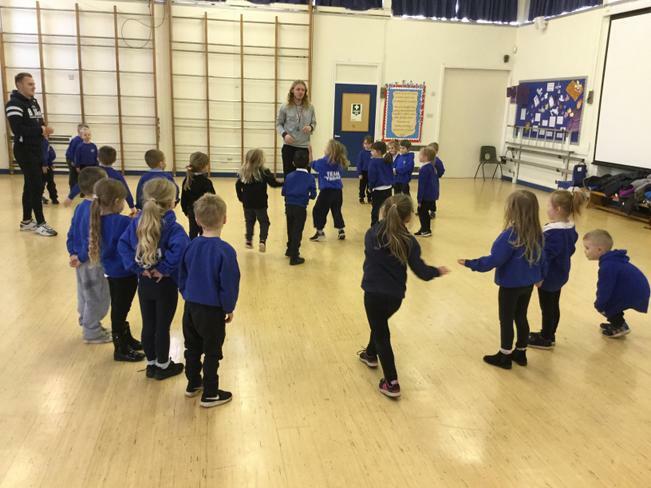 Mrs Milverton will now be in class all day on a Monday, with Thursday being the day the children will be taught by Mrs Smith and Mrs Beazer. 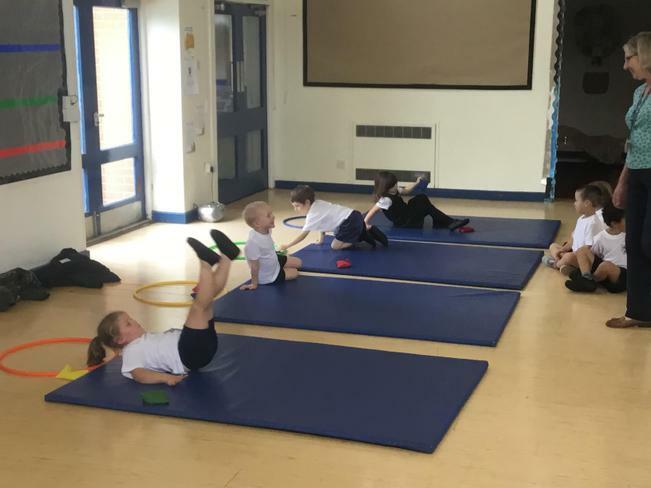 PE day for Owl Class will be on Thursdays only this half-term. This will be with Mrs Smith, please remember to send your child to school in their PE kit on this day! 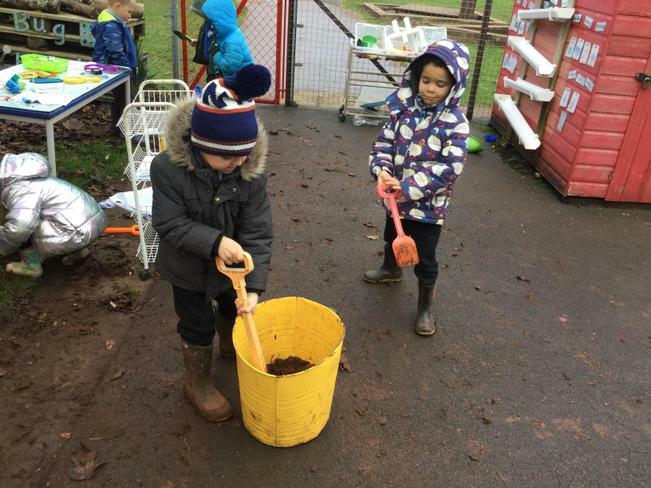 As the warmer weather approaches the children will be spending more time outdoors developing their gross motor skills with digging, riding bikes, catching and throwing and using large scale equipment. 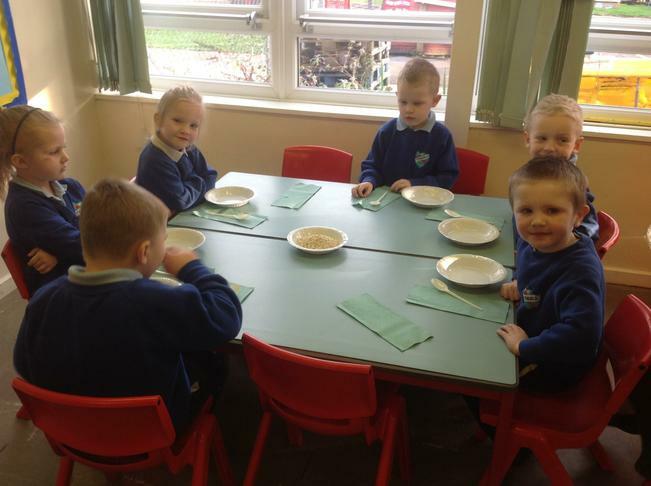 This week in Owl class the children have explored the story of 'Little Red Riding Hood'. 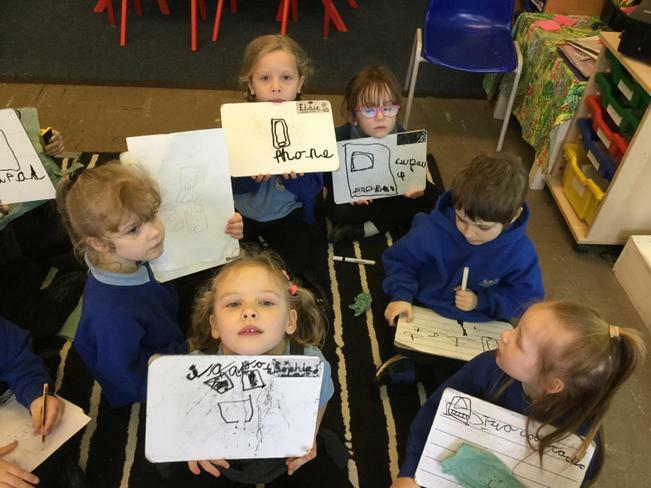 The class have created story maps and written their own sentences about the story using their phonic knowledge to help them. 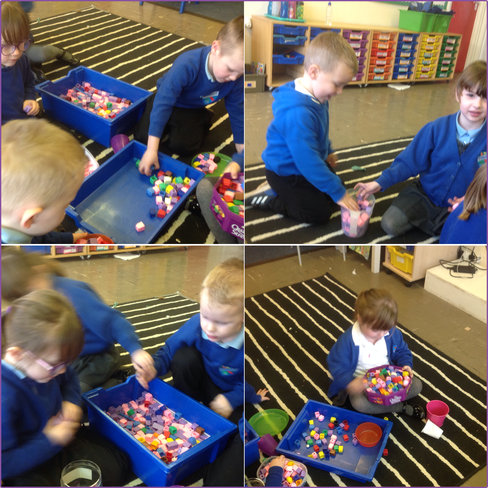 The children have been learning about addition and how the number gets bigger when you add 2 groups of objects together. 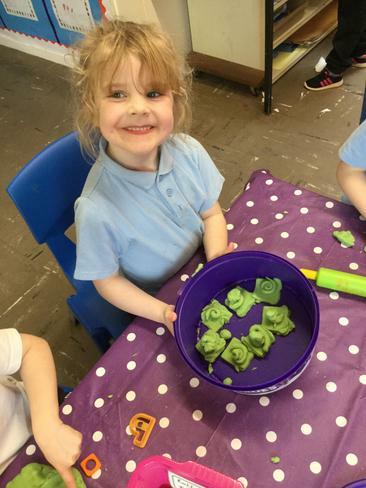 The children have continued to monitor the growth of their bean plants and are looking forward to bringing them home at half term. 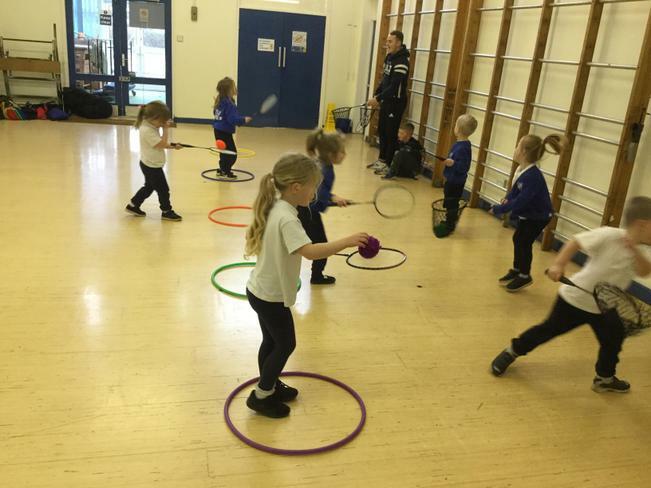 The children have had their final session learning badminton skills with the PE coaches this week too. 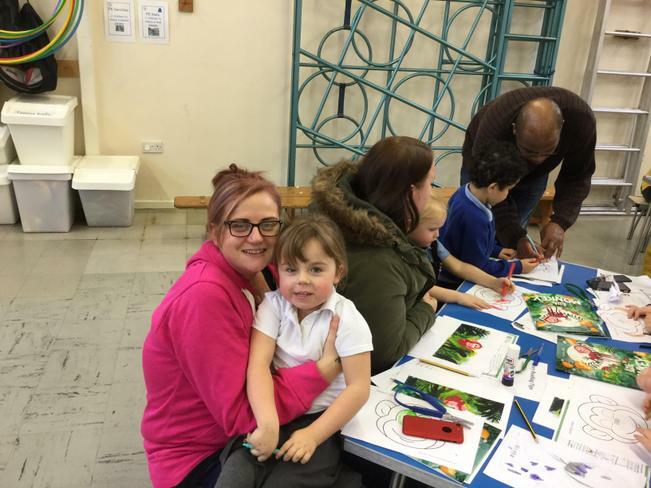 A huge thank you to the parents and carers that came to support Owl Class on the last day of term. 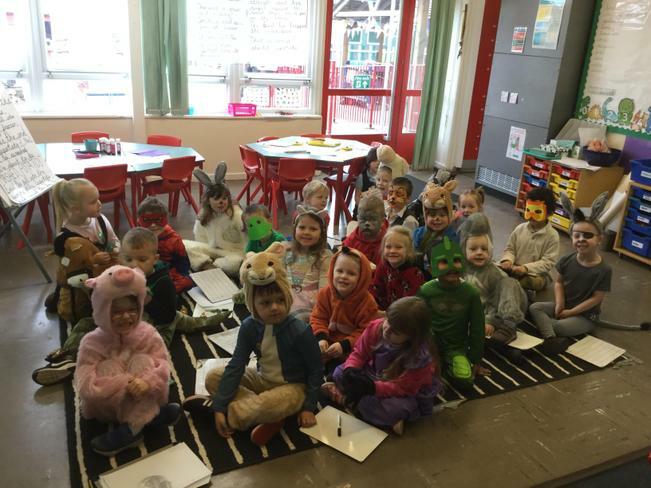 The children enjoyed sharing their learning from this half term about traditional tales and this was made even better by having the children dressed up as their favourite characters from our stories too. 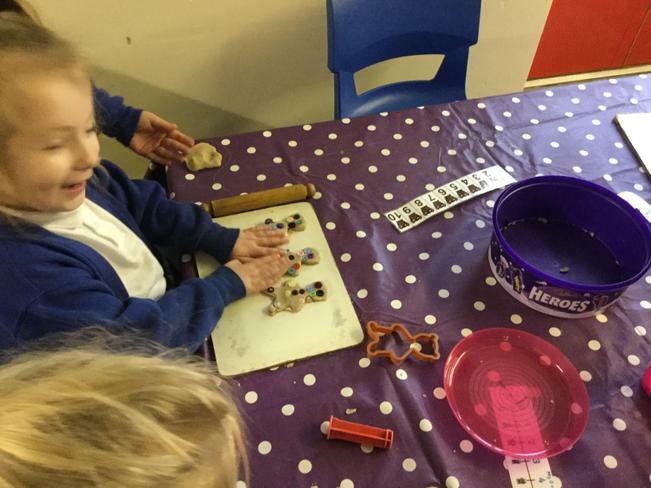 This week Owl Class have been learning about The Gingerbread Man. 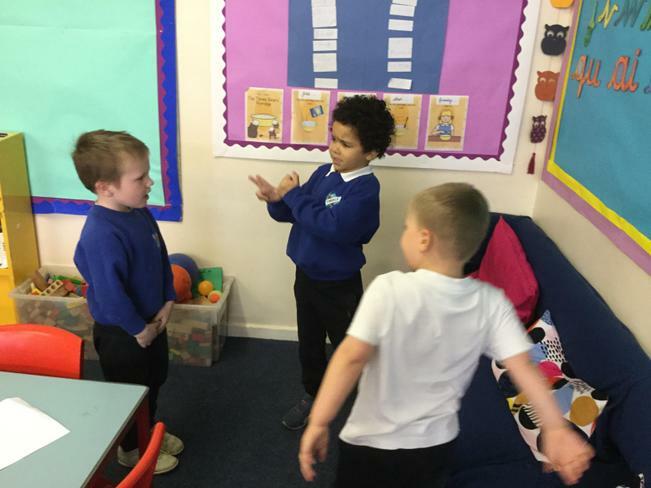 The children have been retelling the story by acting it out in small groups, sequencing the characters in order of appearance and joining in with the repeated language. 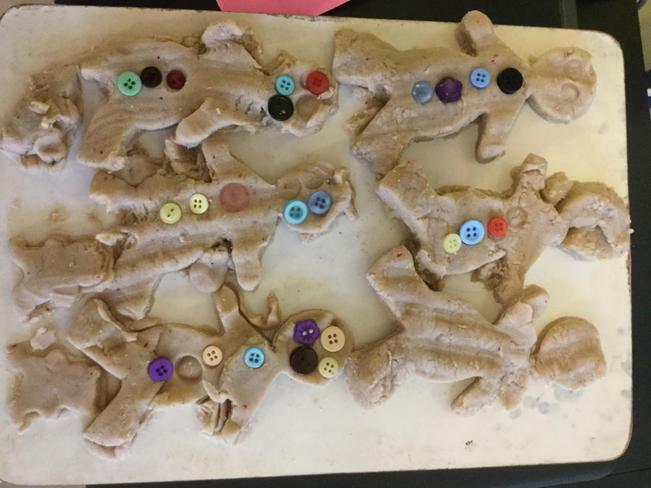 The children have been busy making their own stick puppets to use to retell the story, and they have enjoyed making their own gingerbread people with the play dough, adding buttons for decoration and counting them. 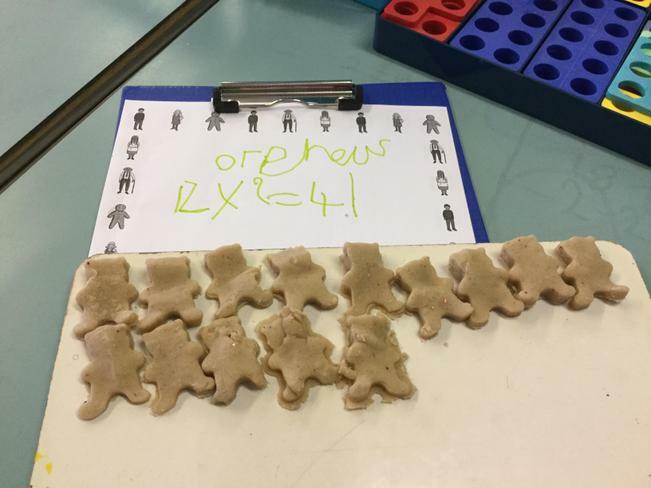 In Maths this week the children have been learning about one more and one less, and exploring addition and subtraction number sentences. 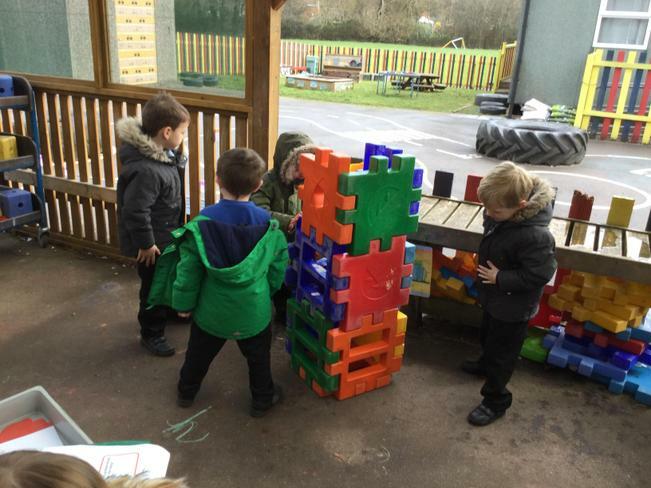 The children have also been monitoring the growth of their beanstalk and have begun to use rulers to explore how tall they are. 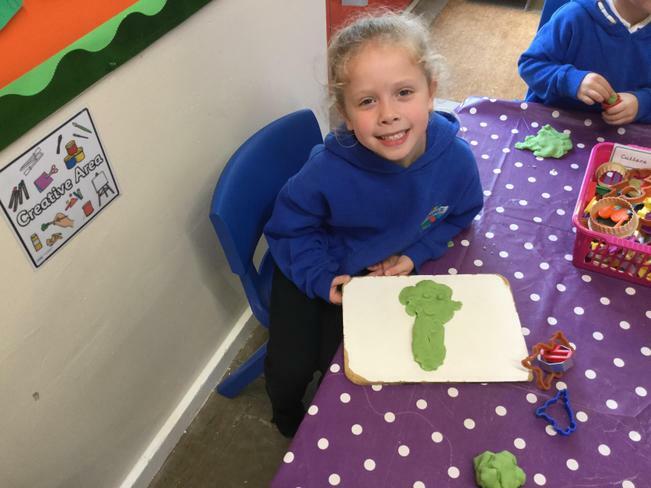 The children have painted their own gingerbread people this week, thinking carefully about the shapes they needed to paint and carefully added the eyes, mouth and buttons. 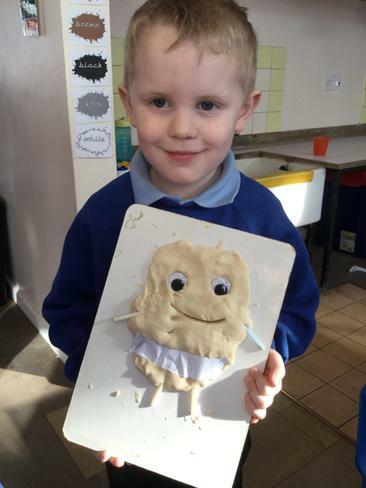 They have also learnt about symmetry when using a folded piece of paper to draw half a gingerbread person on then cutting it out to make a whole one. 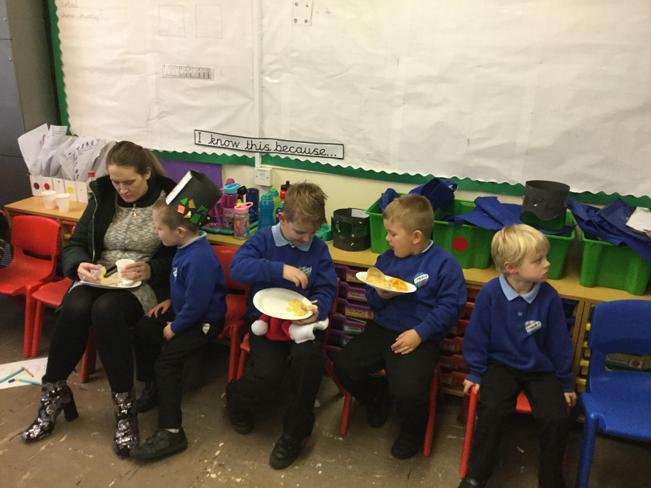 Mrs Beazer very kindly baked Gingerbread Men at home which most children tasted and ate for snack on Friday. 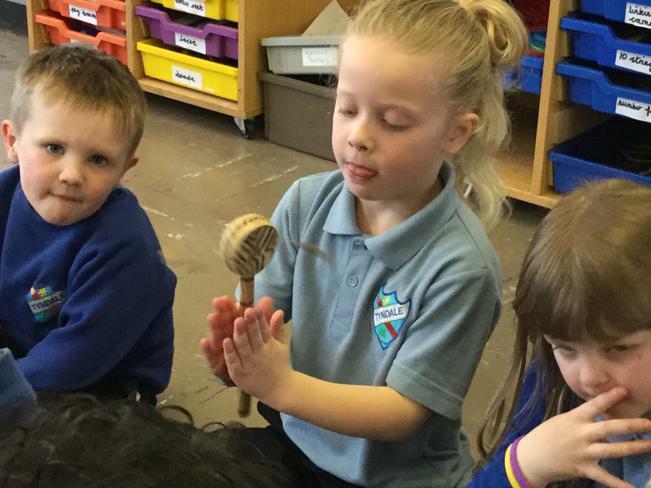 This is the last day of this half term and for our ‘Traditional Tales’ topic. 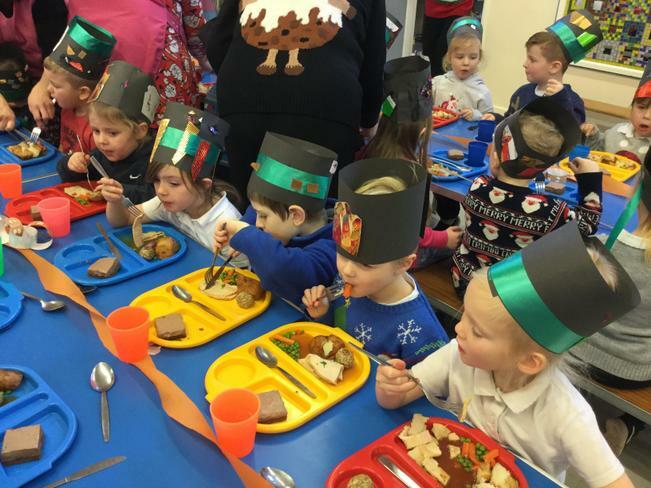 On this day we will be holding our end of term event in Owl Class (please note only our class). 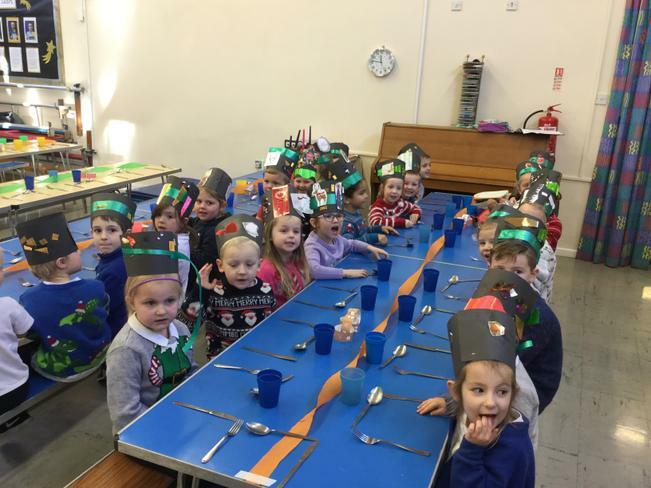 We would like the children to come to school dressed up as their favourite Traditional Tale character. Which story they are from? What they do in their story ? 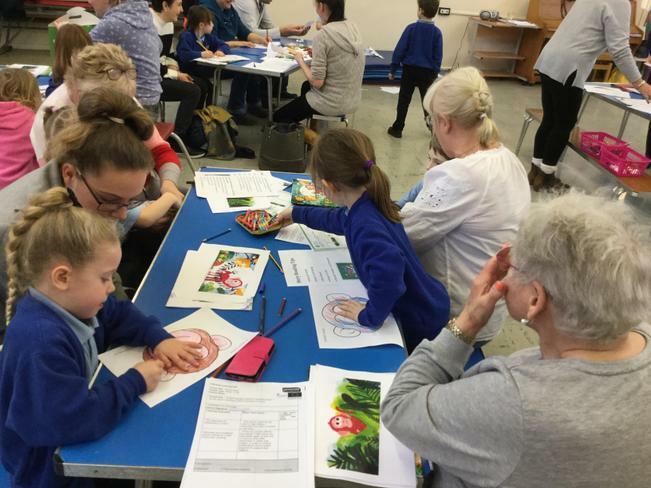 We would like to invite parents and carers in at 2:40pm on this day to celebrate our learning for this half term. We look forward to seeing you ! Please can children not wear any Superhero or Disney costumes as these are not related to our topic. There will be an opportunity later in the school year for these to be worn . 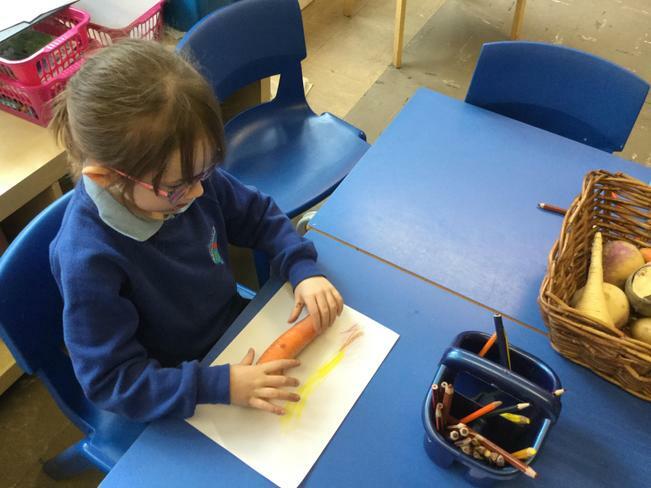 This week the children have been learning the story of ‘The Enormous Turnip’. 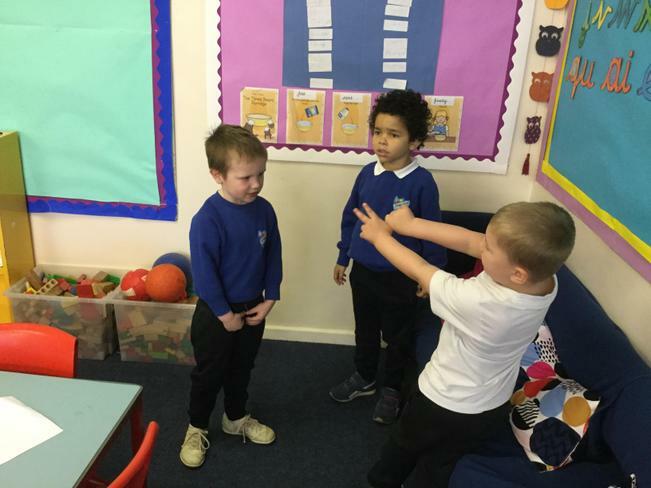 They have been using actions to help them retell story. 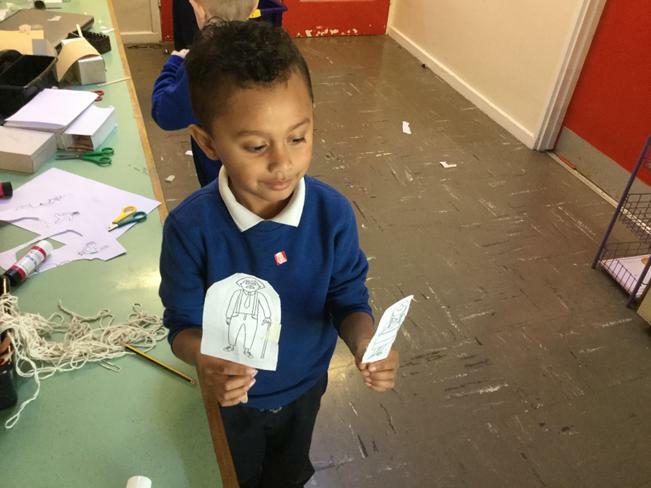 The children have been very good at remembering the order of the seven characters as they appear in the story ! 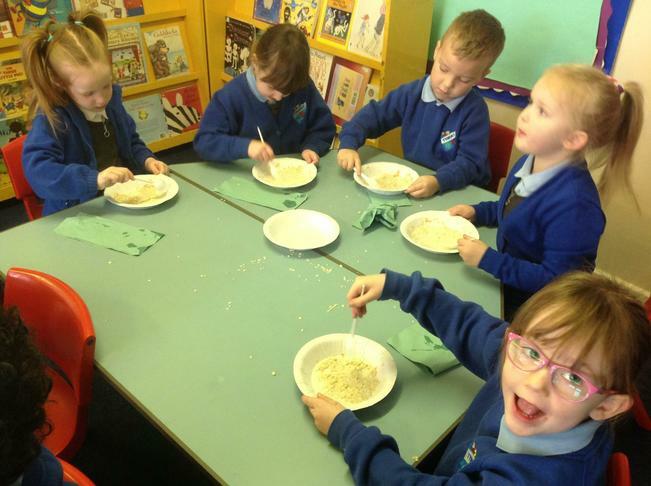 Owl Class have looked at real turnips and other root vegetables - swede, carrot, potato, parsnip and onions. 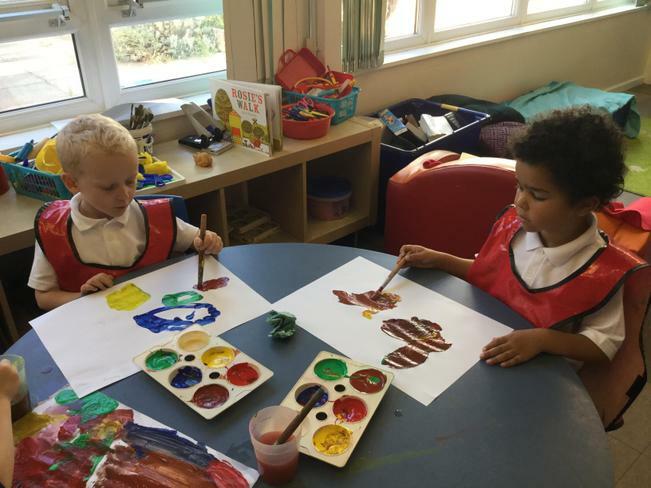 They have done some observational drawings and thought carefully about what colours to use. 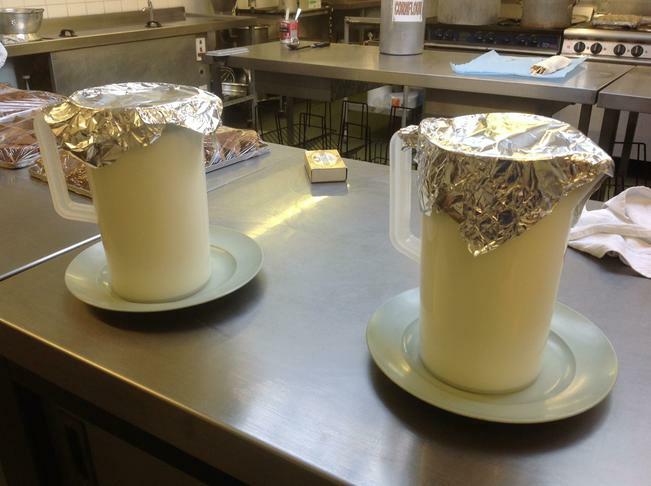 The vegetables were cut on half on Thursday for printing with too. 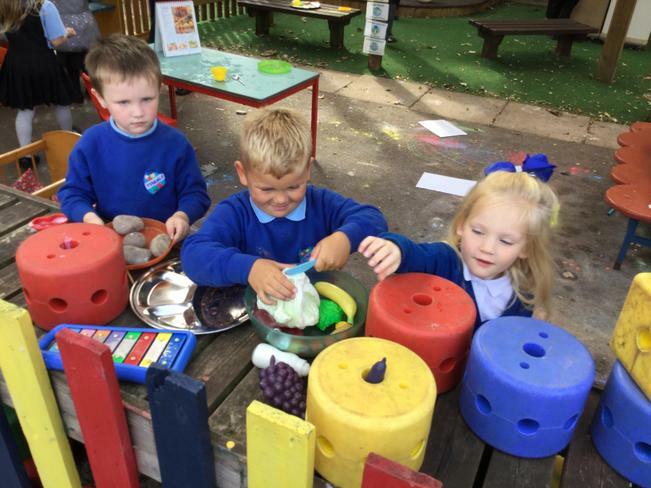 In mathematics this week the children have been exploring weight. 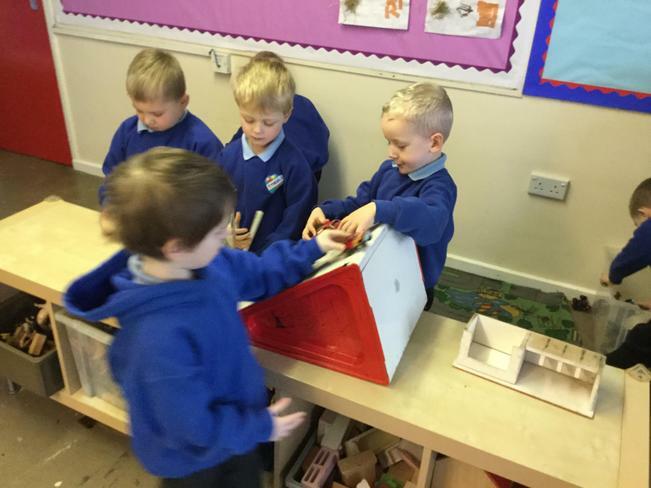 They have used the scales to explore heavy, light, heavier, lighter and balanced . 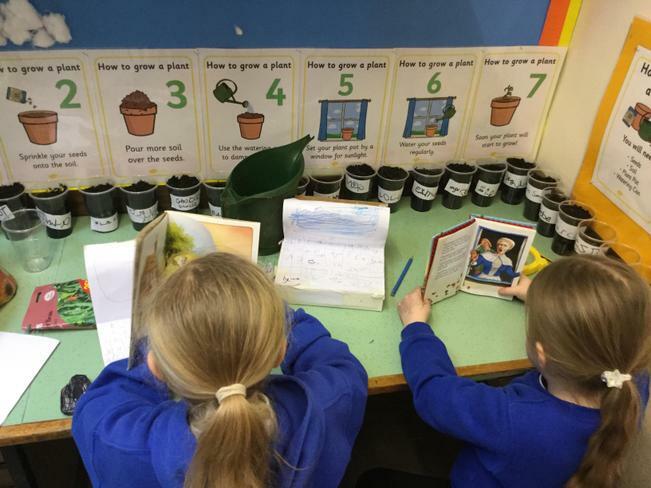 It’s been a while since the children planted their bean seeds, so they took the opportunity to observe the growth of their own and others seeds so far. Some are off to a good start and have roots growing down into the soil. 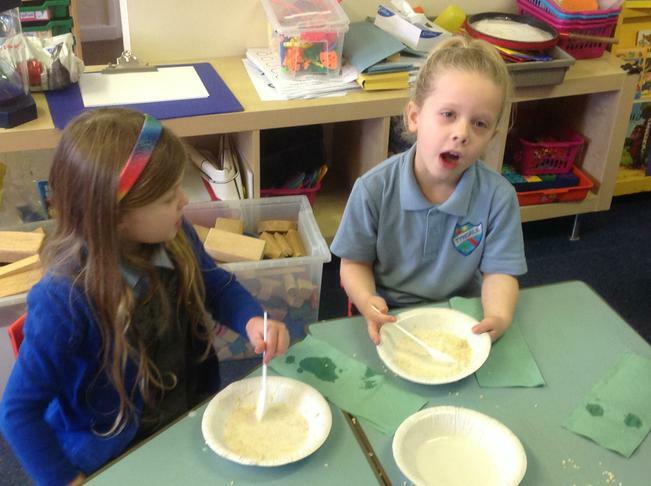 We discussed how the roots grow down and act like straws to soak up the water into the seed. 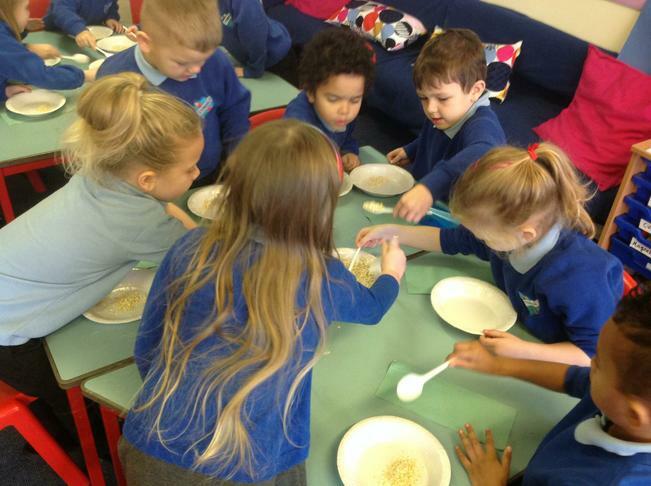 The children enjoyed watching a video clip of how a bean seed grows into a plant. 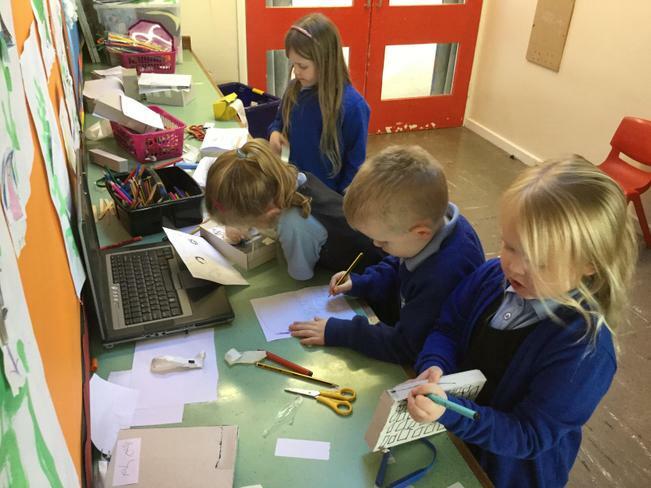 A number of children this week have been interested in making their own computers and laptops. 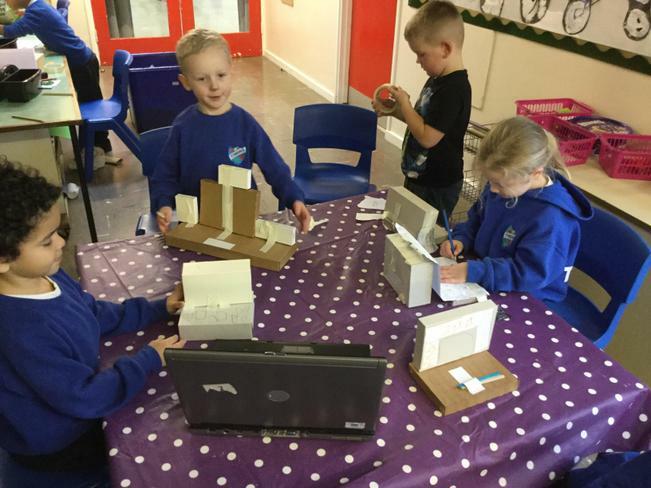 A real laptop was placed in the creative area for the children to view, and they added further details to their own models. 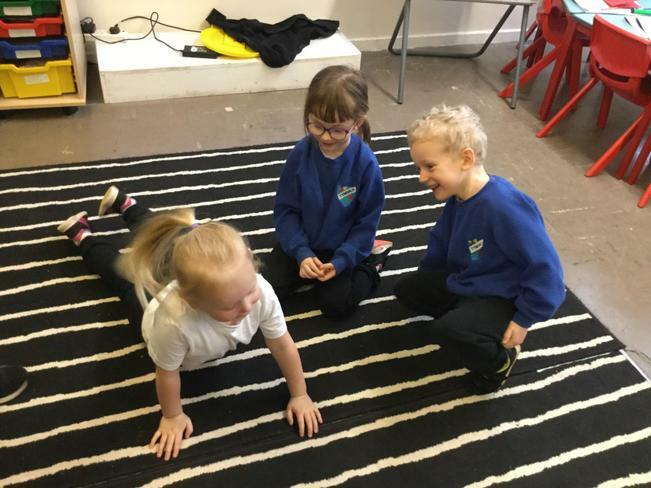 The children even used them in their play. 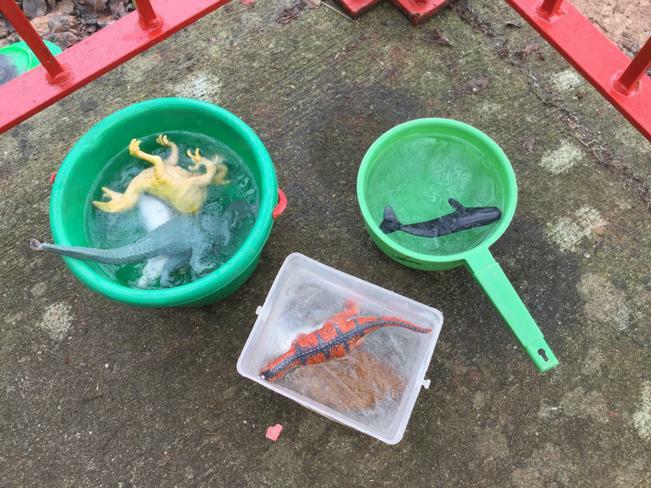 It has been very cold this week, and overnight week did an experiment of putting some of our small world toys in buckets of water . 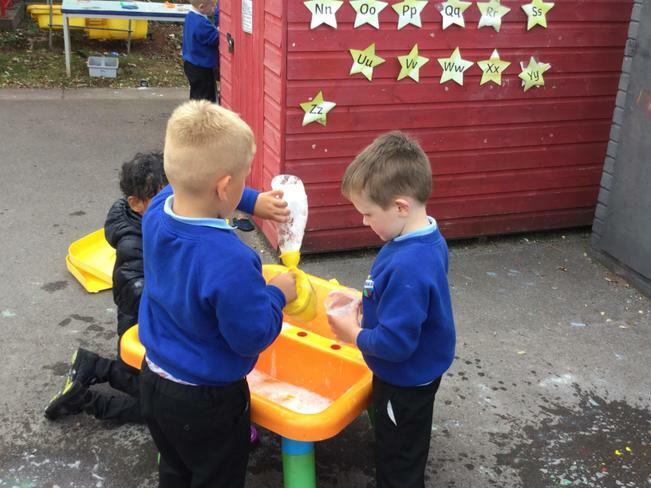 The next morning the children were delighted to find the water was frozen - we then kept them in the classroom and watched it melt throughout the day back to water again! 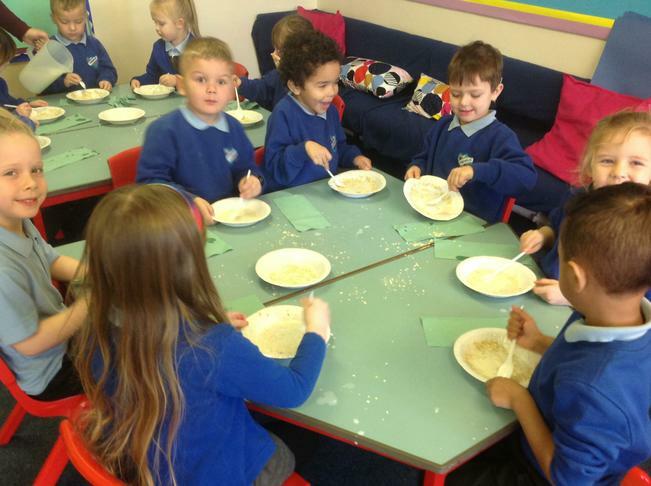 The children were very excited about the possibility of snow, so no doubt next week they will be sharing their snowman building experiences ! This week Owl Class have explored the story of 'Jack and the Beanstalk'. 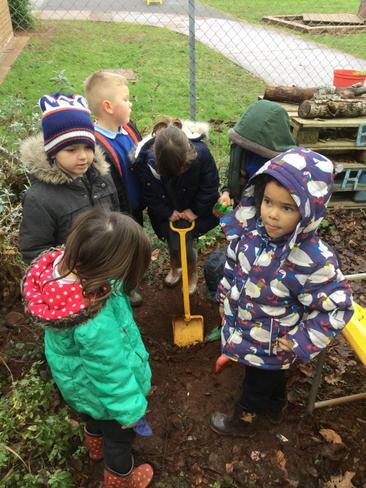 They have shared their own gardening experiences, and talked about what seeds and plants need to help them grow. They have each planted their own bean seeds and our helper of the day checks to see if they need watering. 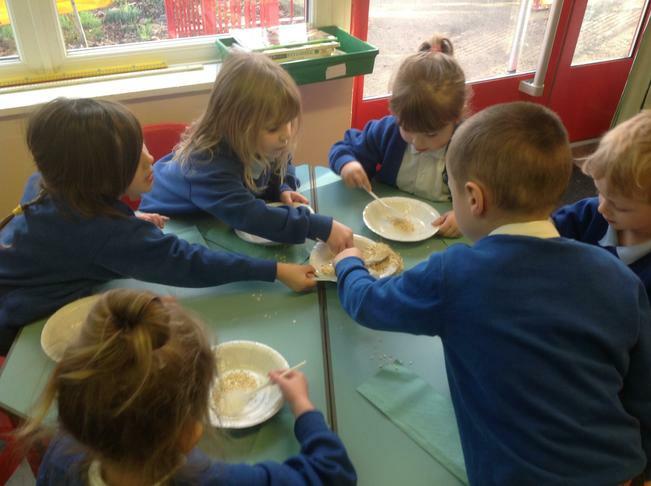 We will continue to observe our seeds over the next few weeks and talk about the things we can see happening. 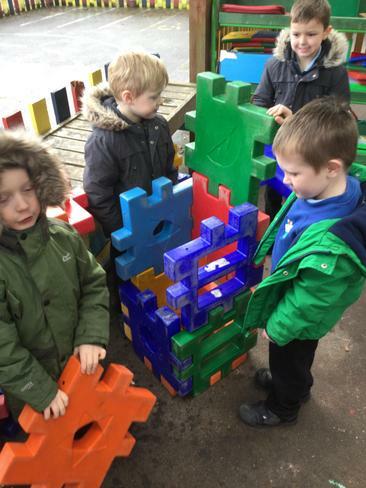 The children have created their own giant castles using recycled materials. 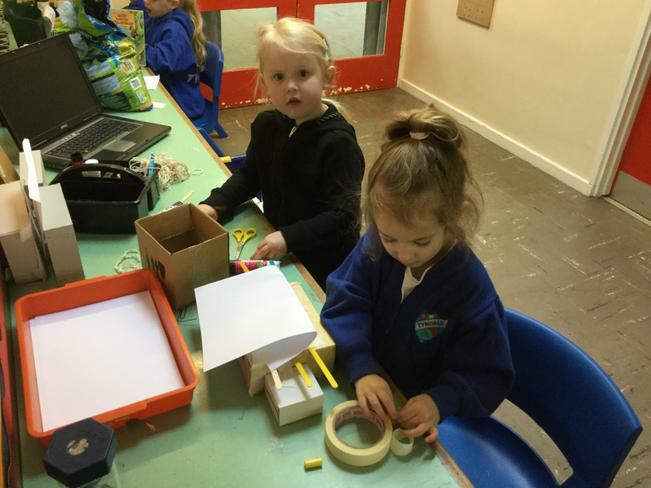 They have learnt how to use masking tape to join the parts together, and added details such as windows, doors and a beanstalk. 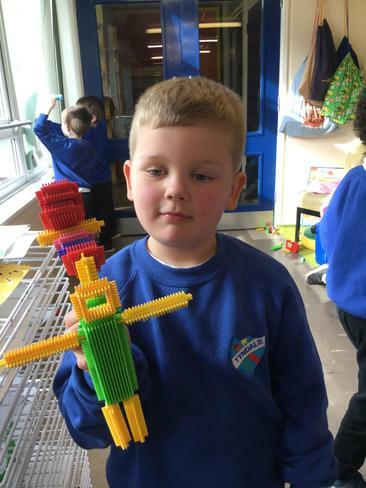 Some children even drew and cut out their own characters to add to their models. 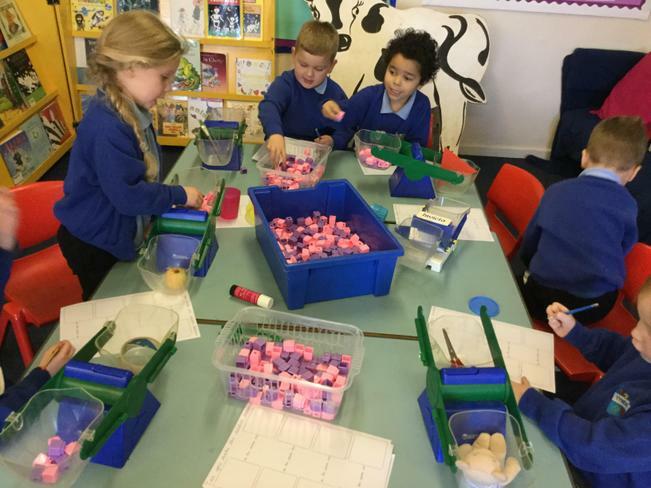 In Mathematics this week the children have used bricks to show containers that were full, half full and empty. 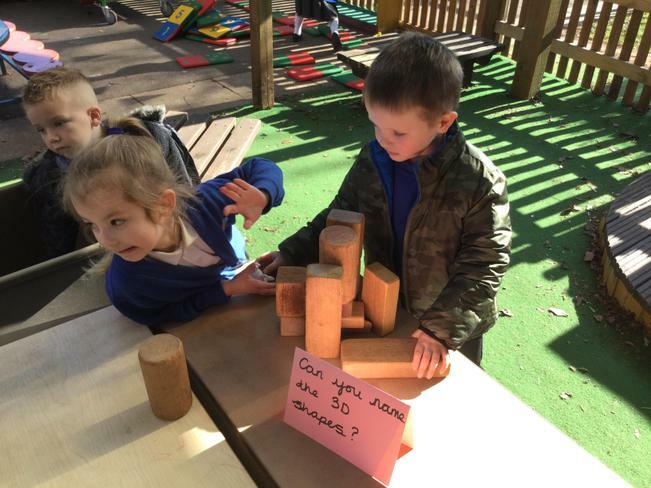 They also explored estimating how many bricks are in a pot, then checking by counting to find the total. 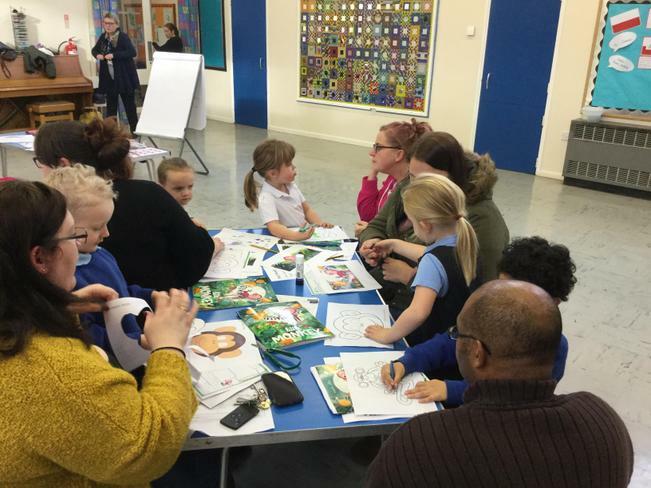 Thank you to all the parents and carers who attended our reading workshop on Friday afternoon. 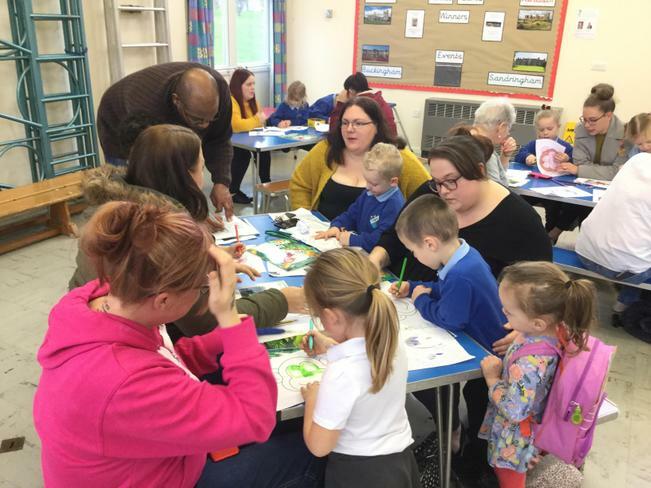 We hope you enjoyed the opportunity of finding out ways to support your child with reading, and working together. 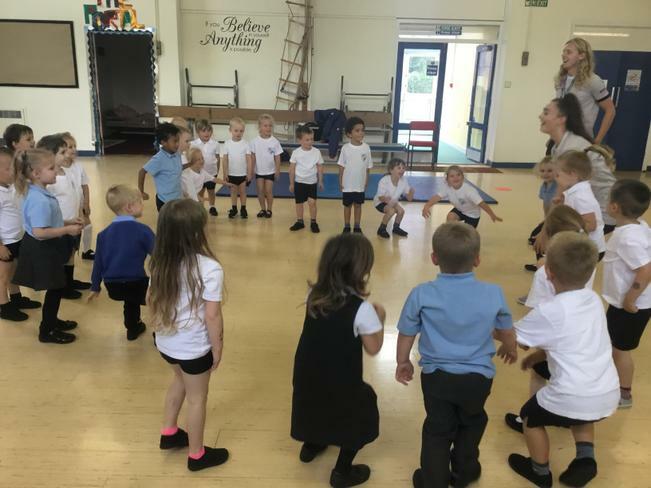 Next week, Owl Class will be taught by Mrs Smith and Mrs Ball on Monday. 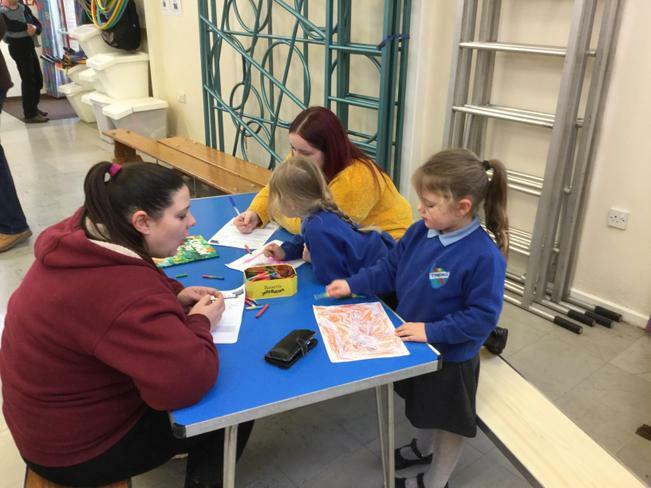 On Wednesday, both Mrs Milverton and Mrs Beazer will be out on a course (we will be learning how to help support the children with their speech and language development)and Mrs Smith will be in. 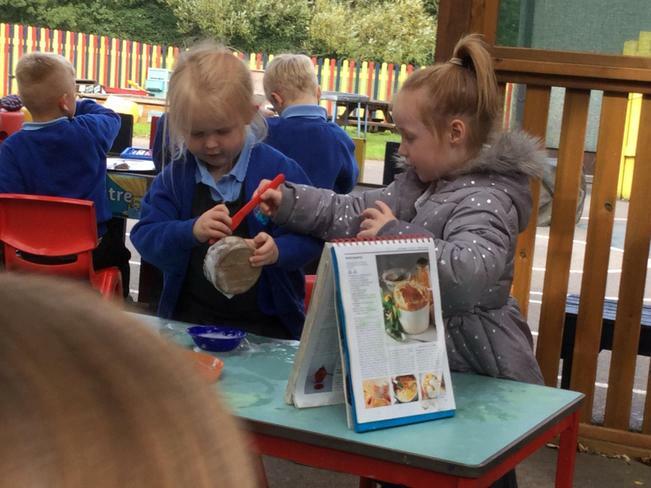 On Thursday, Mrs Milverton will be out of class in the afternoon, (learning ways to help the children develop their writing skills) and Mrs Smith will be with Owl Class. 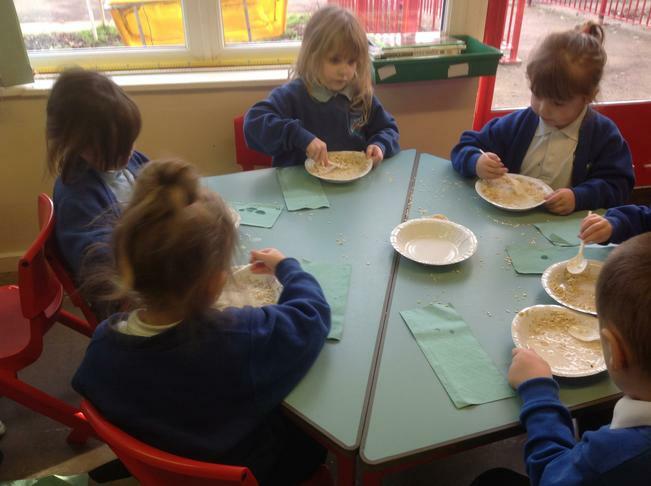 This week in Owl Class we have been exploring the story of Goldilocks and the Three Bears. 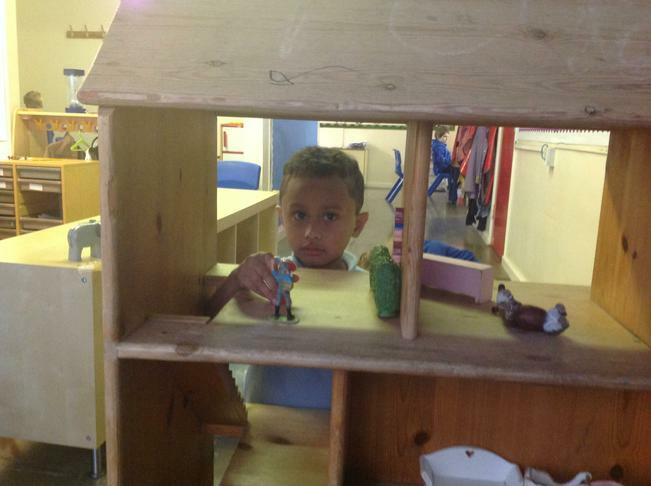 The children have been role playing in the home corner and small world areas. 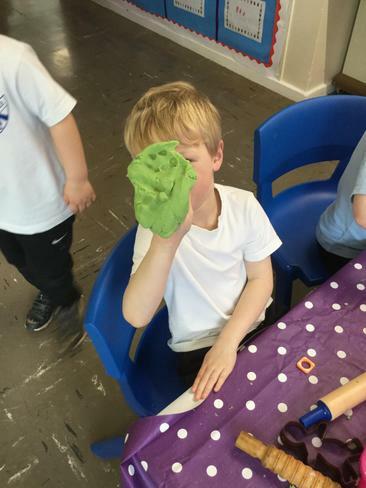 They have been making different sized bears with chocolate scented play dough, as well as painting bears. 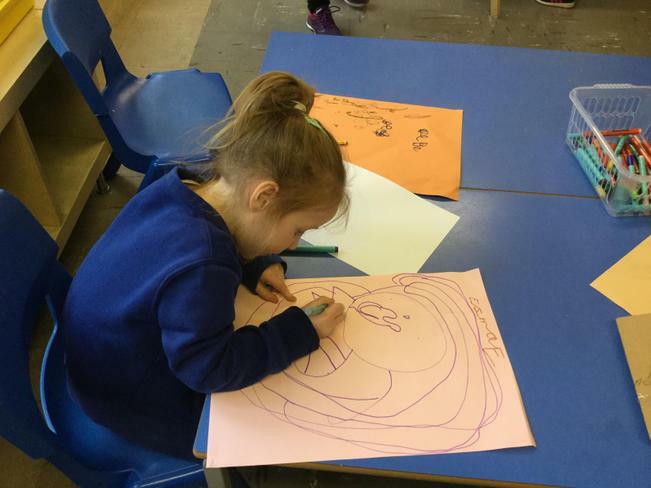 The children helped write a class 'Wanted' poster for the bears to find Goldilocks. 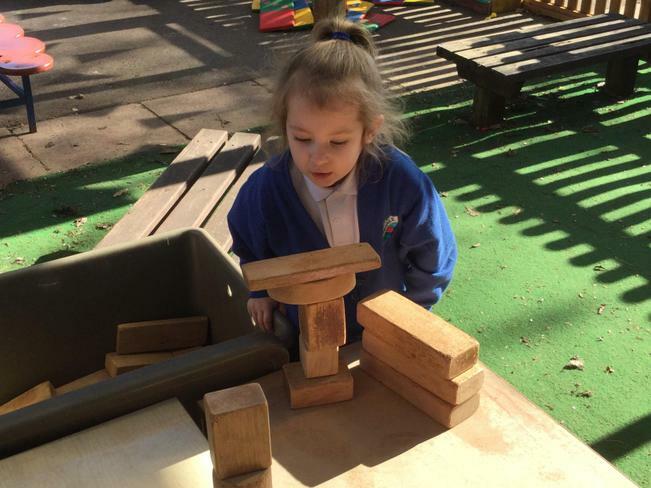 The children have learnt how to order a set of objects from biggest to smallest, and tallest to shortest. 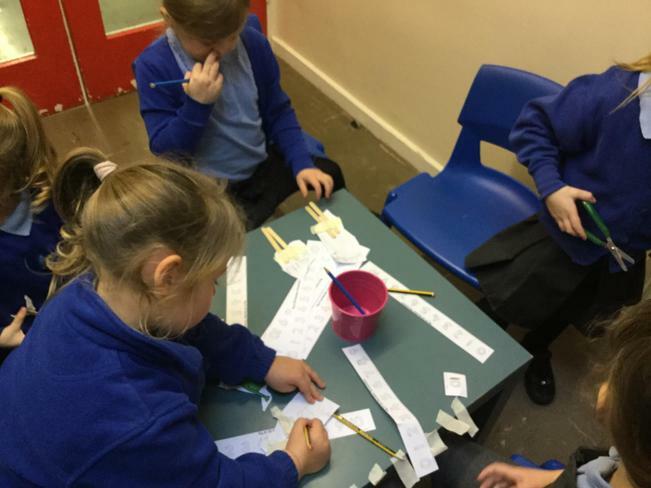 The children have been working in their new phonics groups this week and have continued to consolidate sounds and learn new ones too. 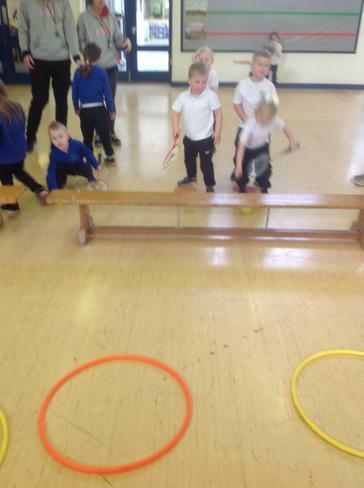 On Thursday, the children had PE with Nicola and Sam the Coaches and continued to develop their badminton skills. 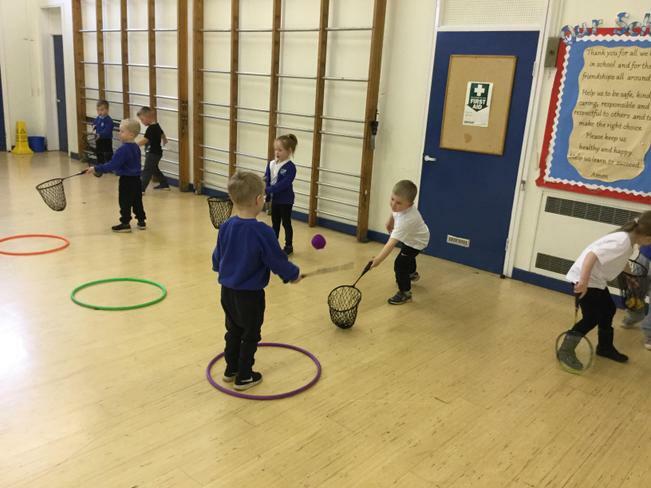 This week they worked in groups of 4 to practice hitting and catching the shuttlecock. 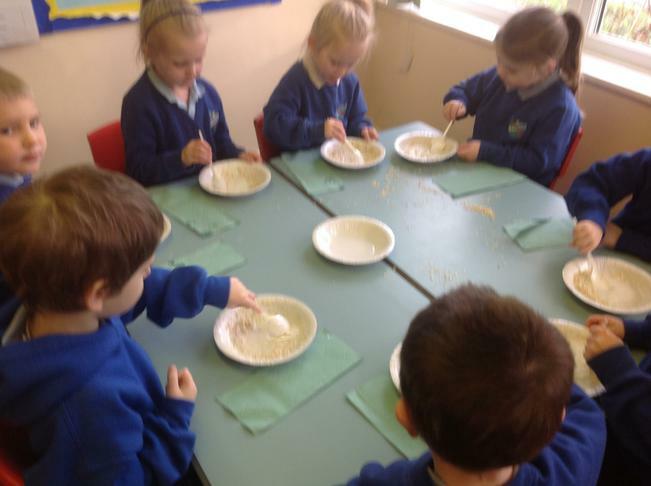 On Friday the children followed instructions to make porridge, and then tasted it. 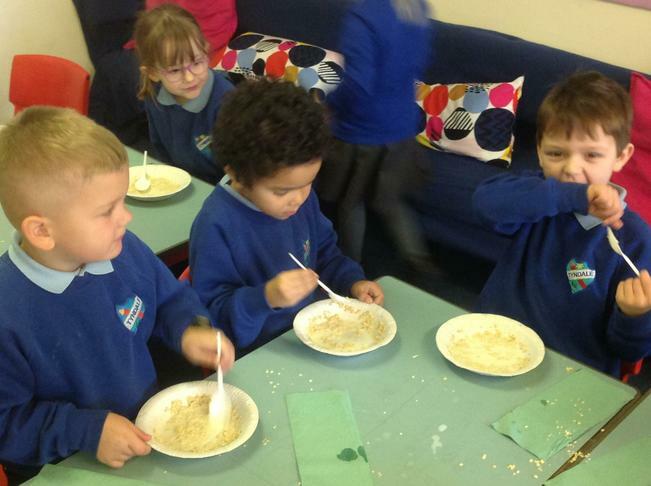 A class tally was created of who did or did not like porridge. 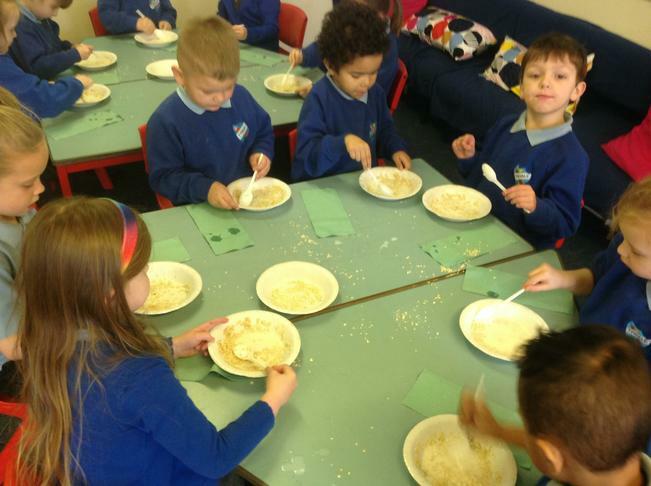 16 children liked porridge, and 10 did not like it. 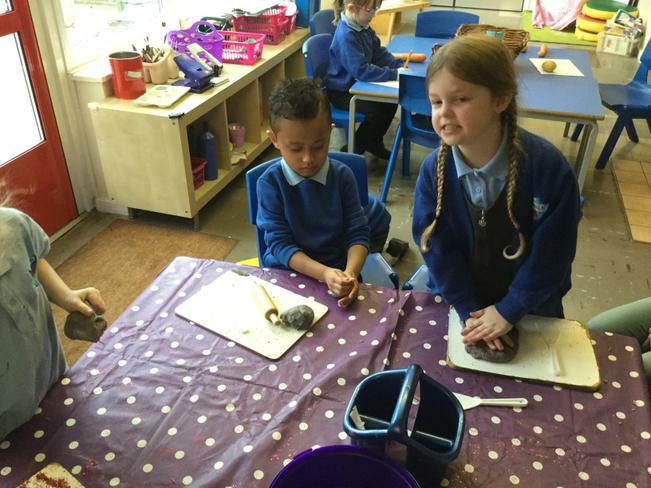 We would like the children to talk about their families next week. If your child could bring in a photograph of them with their family this would be really helpful. We would like to display these photographs in our home corner. If you would like us to photocopy a picture we can do this so you can keep the original. We will return all photos later in the year. 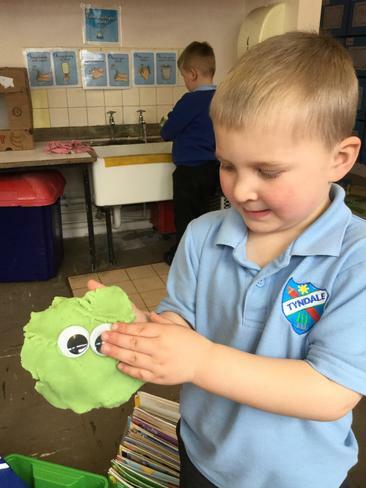 This week Owl Class have been exploring the story of The Three little Pigs. 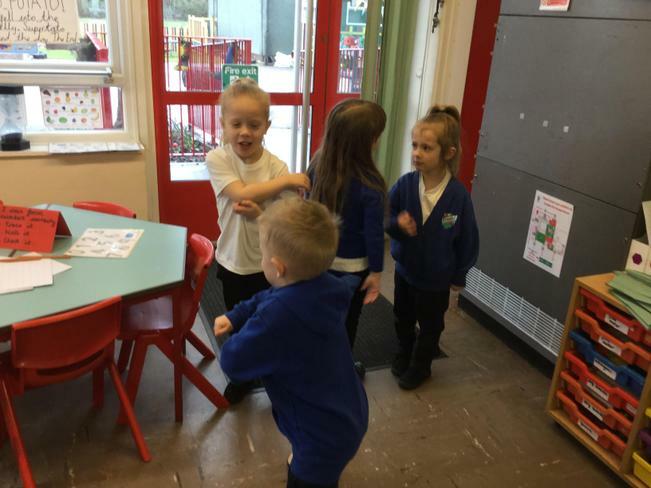 They have retold the story in both the role play area and small world. 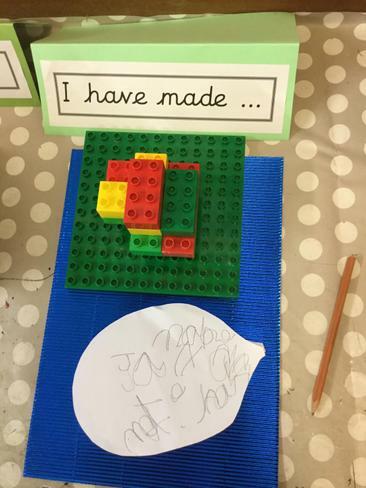 The children have made lots of houses for the pigs using Duplo and even written their own labels. 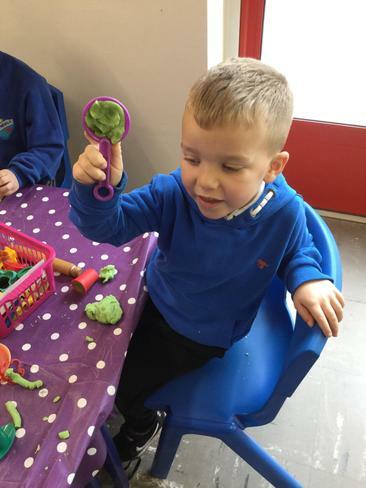 They have created their own little pigs using playdough, and have carefully used the scissors to cut out their pictures of the little pigs and the big bad wolf. 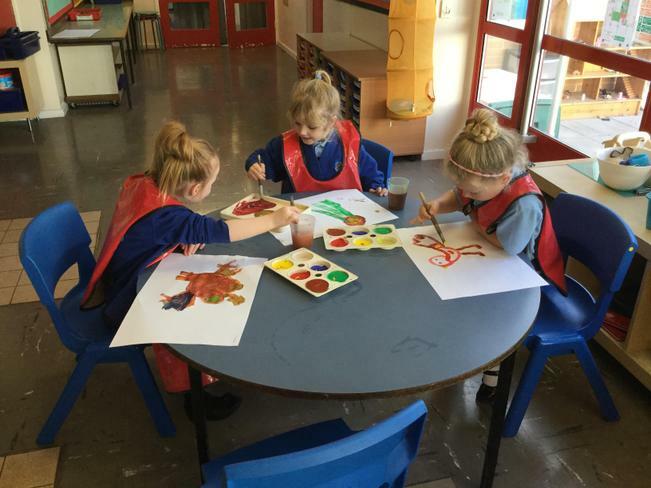 The children have used paint to produce their own pigs paintings too. 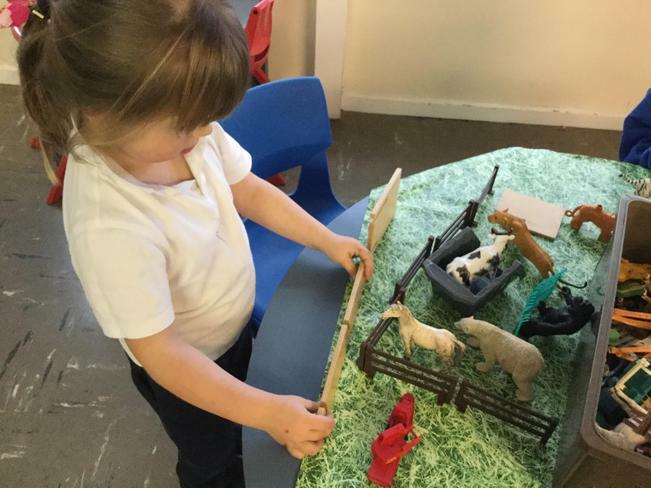 The children have learnt about the materials the little pigs used to build their houses - straw, sticks and bricks. 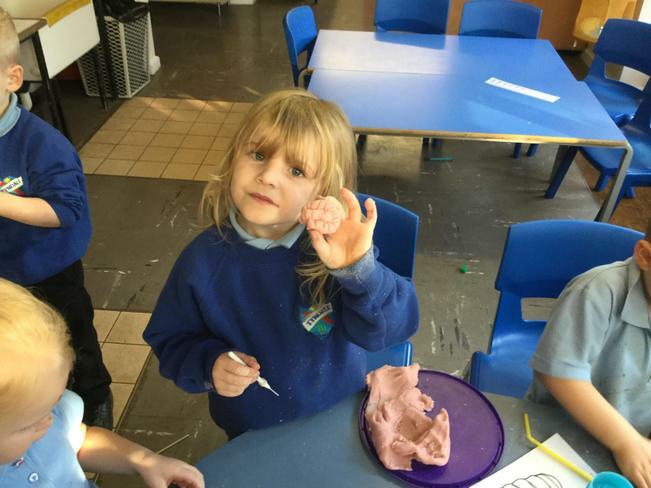 They also described and sorted soft and hard materials. 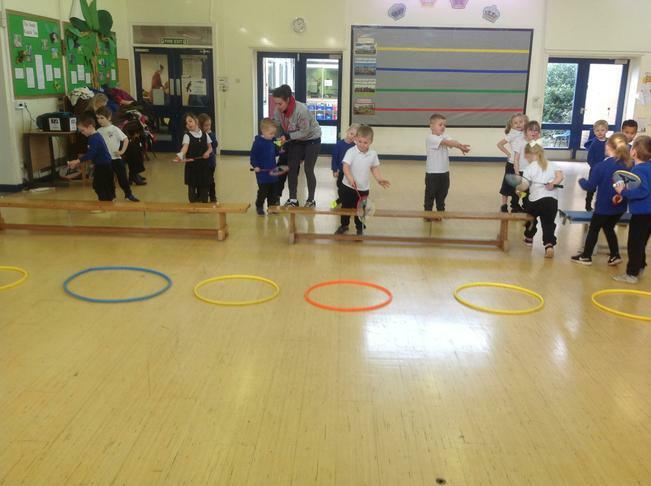 This term Owl Class will be doing PE on Mondays with Mrs Smith, and Thursdays with the PE coaches. 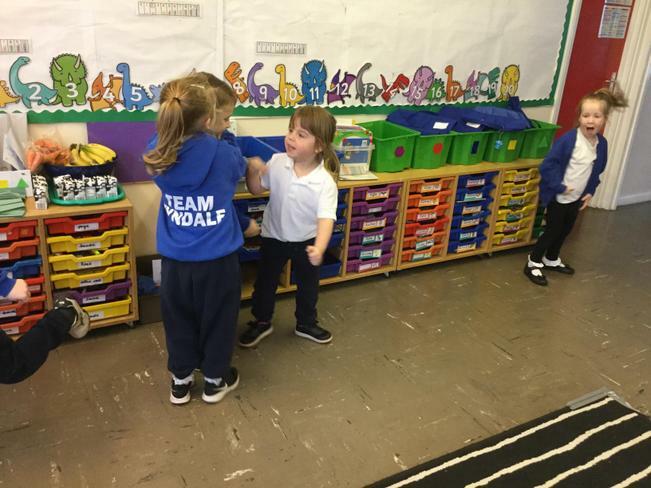 Please make sure your child wears their PE kit to school on these days. 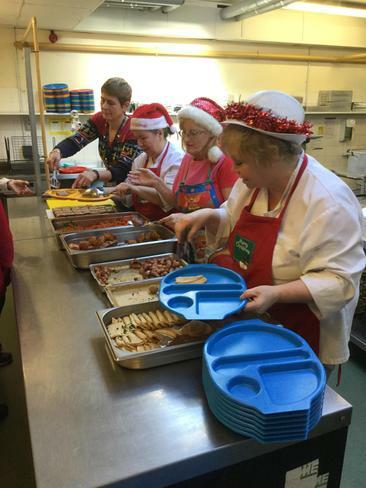 We hope everyone has had a wonderful Christmas, and we would like to wish you a happy and healthy New Year! If you would like to see what the children will be learning in Owl Class this half-term please have a look at the Traditional Tales topic plan below. 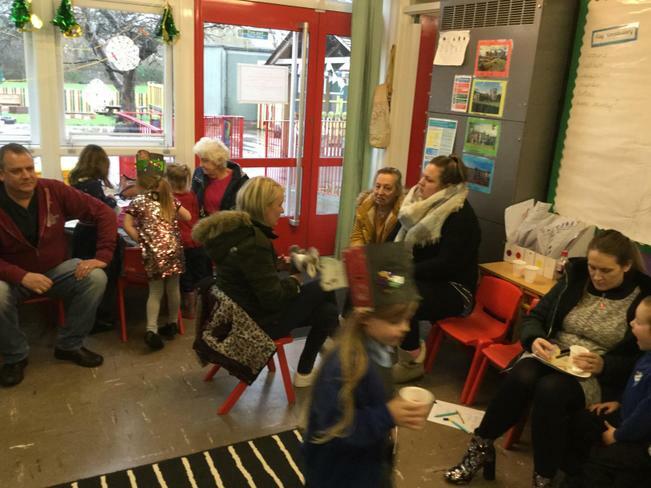 Thank you to all the parents and carers that attended our Christmas sing-a-long session. 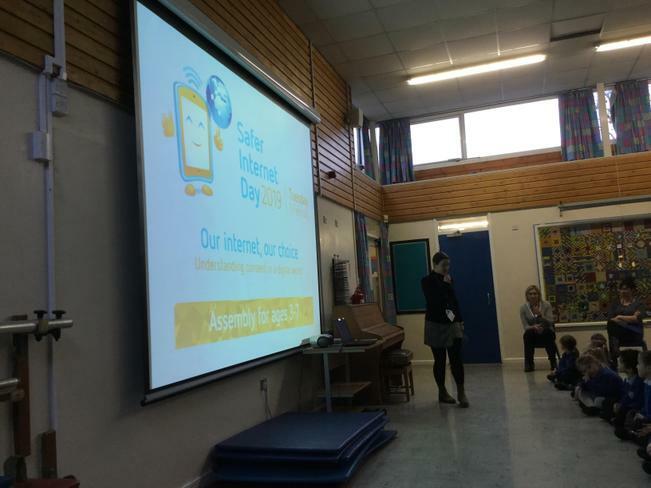 It was fantastic to have so many of you attend! 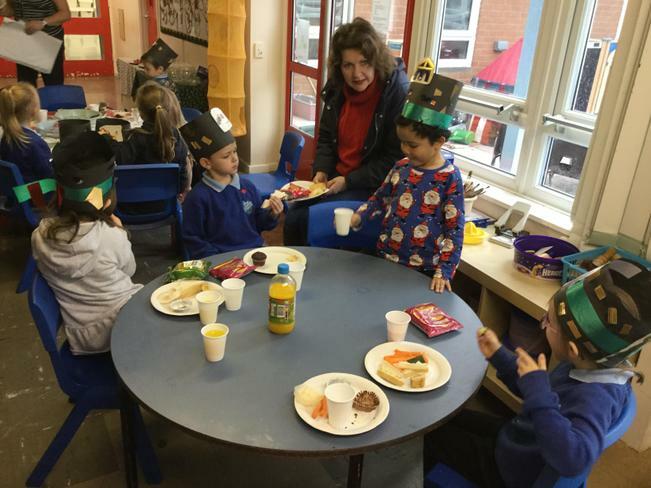 The children thoroughly enjoyed their buffet of food afterwards, so again thank you very much for your generous contributions. 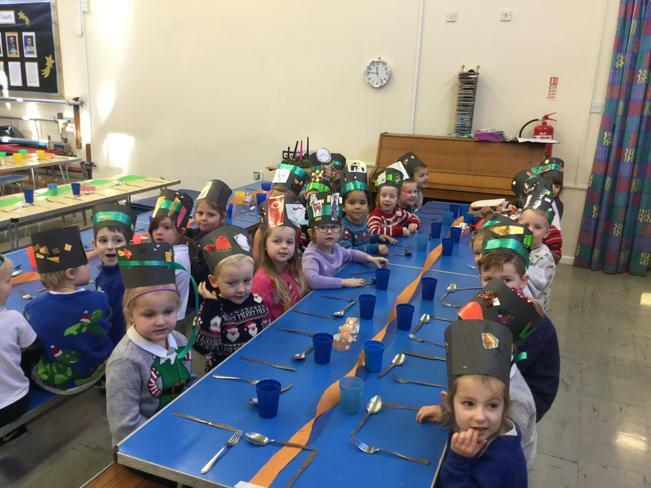 Owl Class had their very first Christmas Lunch at Tyndale. 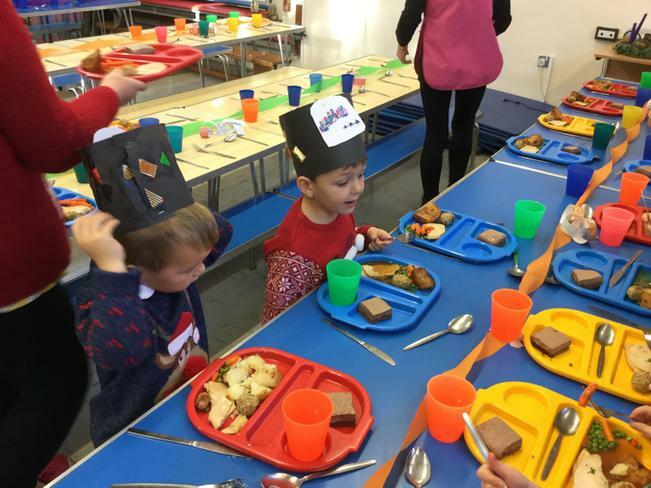 The children wore their party hats they had made especially for the event, and waited very patiently to be served their food by the adults. 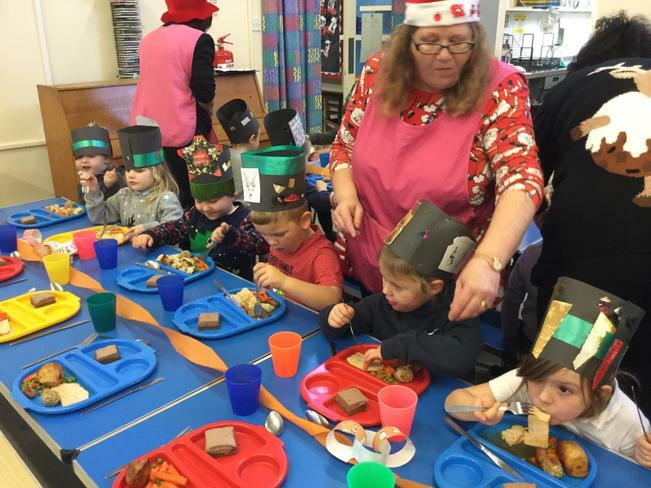 There we lots of empty plates and happy faces too! 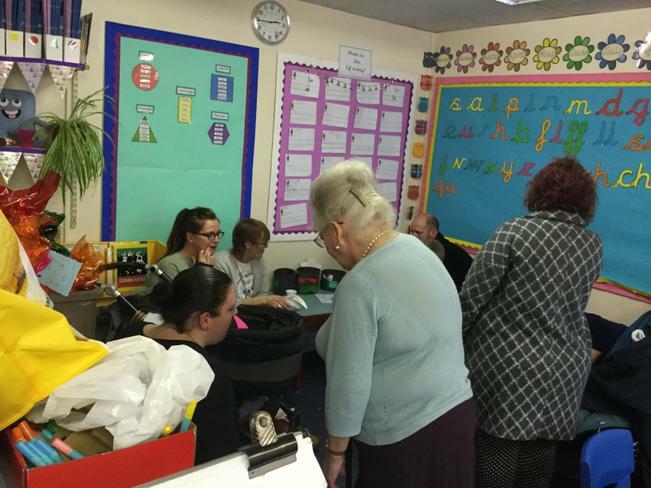 On Thursday at 2pm we will opening our doors to our parents and carers. 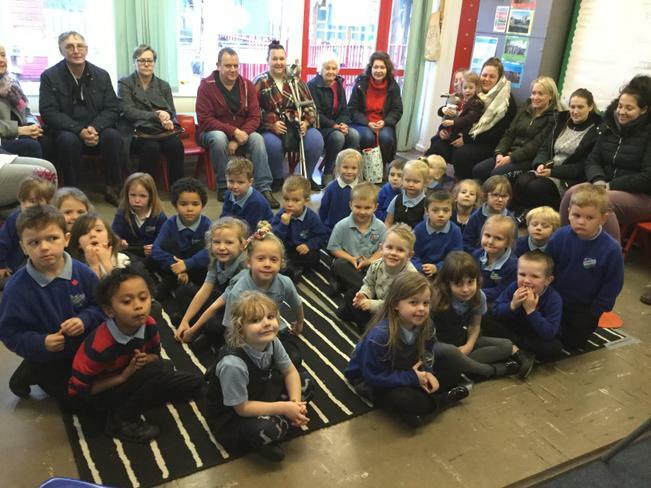 The children in owl class would like to tell you the Christmas Story and sing you some festive songs- some you may know and will sing-a-long to ! 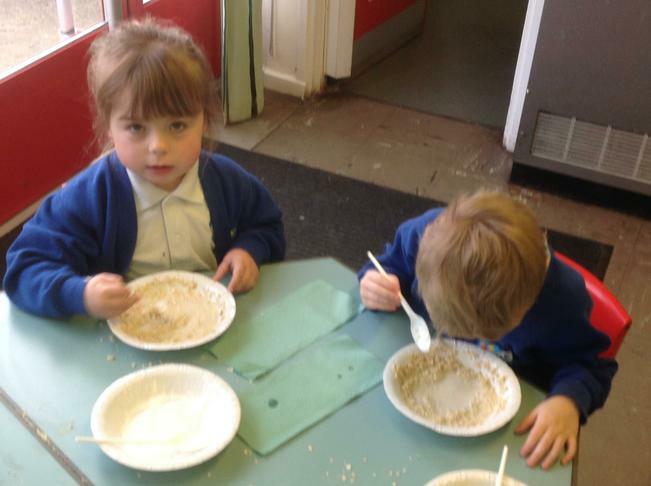 Following on from the singing we would like to hold a buffet for the children (we have 27 in Owl Class). 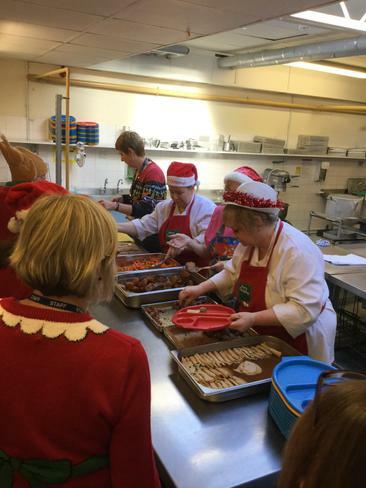 We would be grateful for food donations - please can the boys could bring something ‘savoury’ and the girls something ‘sweet’. 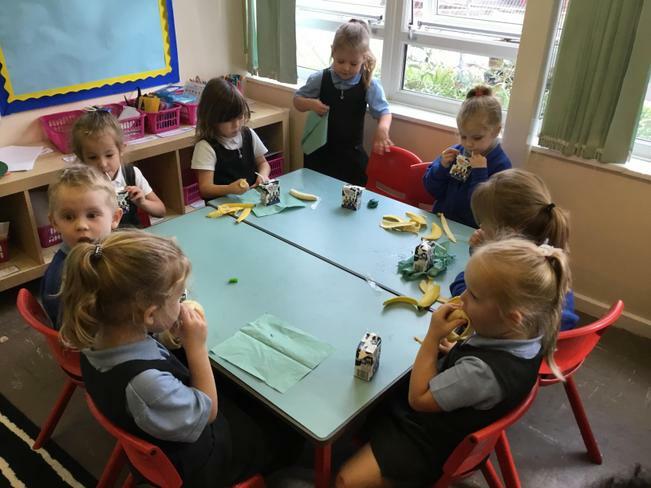 Please note we are a ‘nut free’ school due to someone on site having a nut allergy. If you are joining us at 2pm then you are very welcome to bring your child’s party clothes to change them into. We hope you will be able to join us for this festive event, if you have any questions please speak to Mrs Milverton or Mrs Beazer. 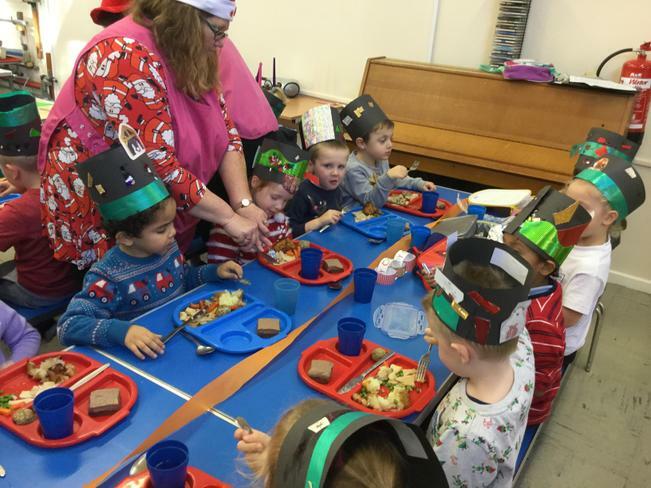 On Monday’s until Christmas Mrs Smith and Mrs Ball will be in Owl Class all day. 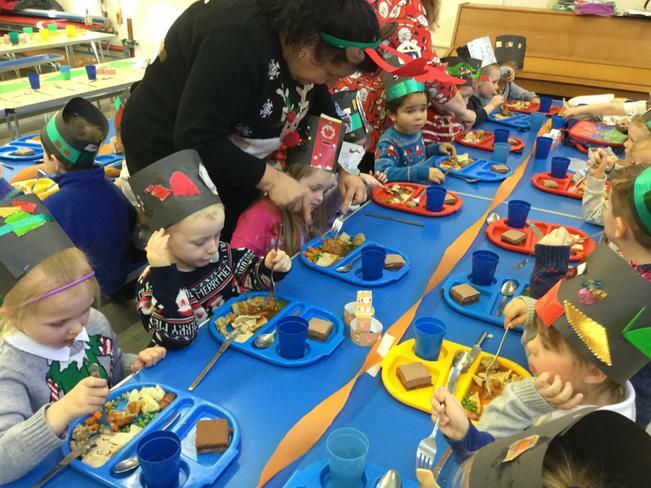 The rest of the week will be Mrs Milverton and Mrs Beazer. 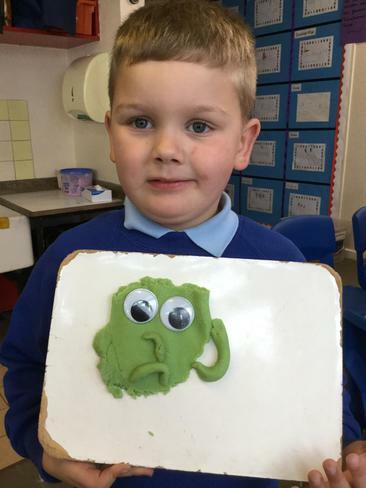 This week in phonics Owl class have been learning the phase three digraphs - sh, th and ch. they have also been introduced to the tricky words - was and are. 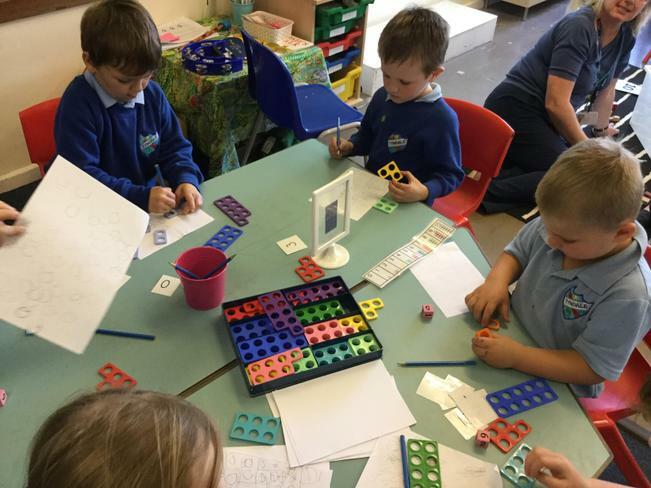 This week in Maths, Owl Class have revisited the Numberblocks. 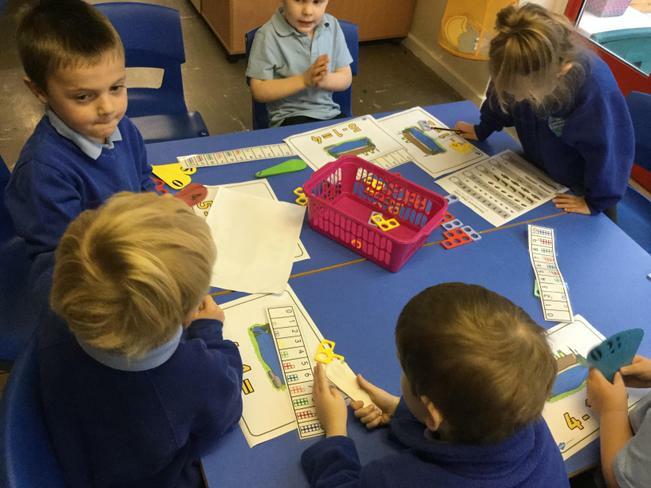 They have now met all the numbers from one up to 10. 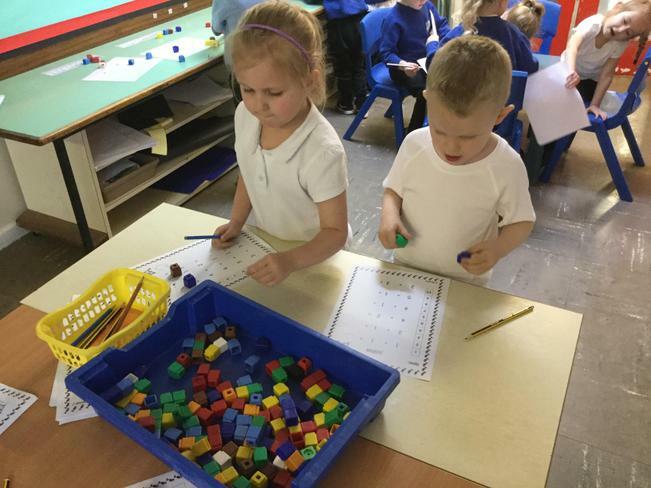 The children have been learning how to count sets of objects and how to record the numbers. 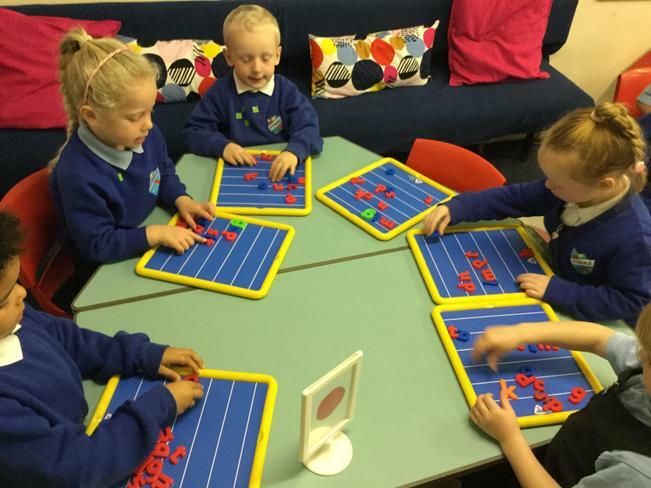 They were introduced to a ten frame and gave been able to recreate the numicon shapes in the frame using buttons, bricks and pom-poms . 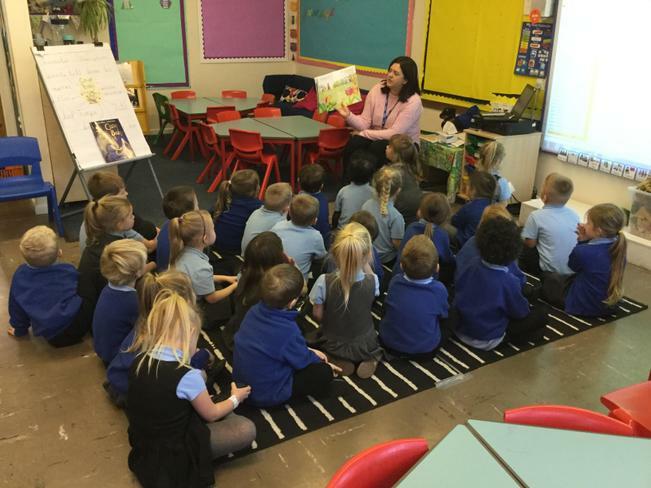 This week in Iwl Class the children have been looking at the Grufalo’s Child - another text by Julia Donaldson. 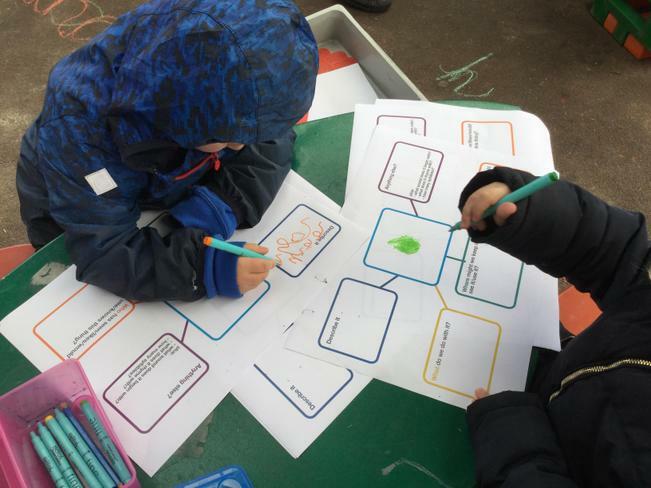 The children have created their own story maps and written their own labels. 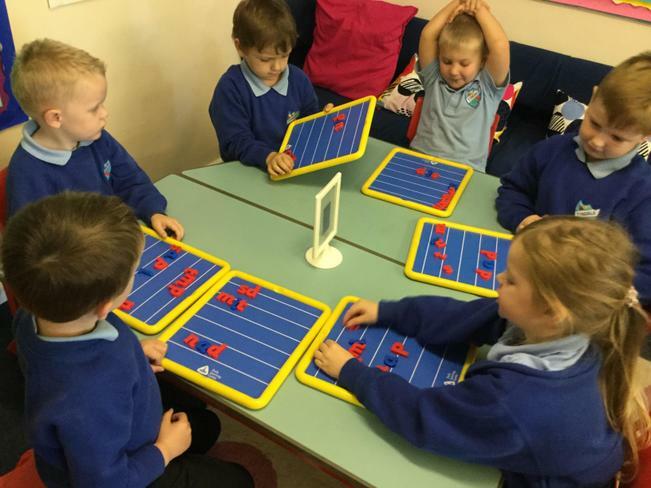 The children have been using the sound mats in the classroom to help them with their writing. 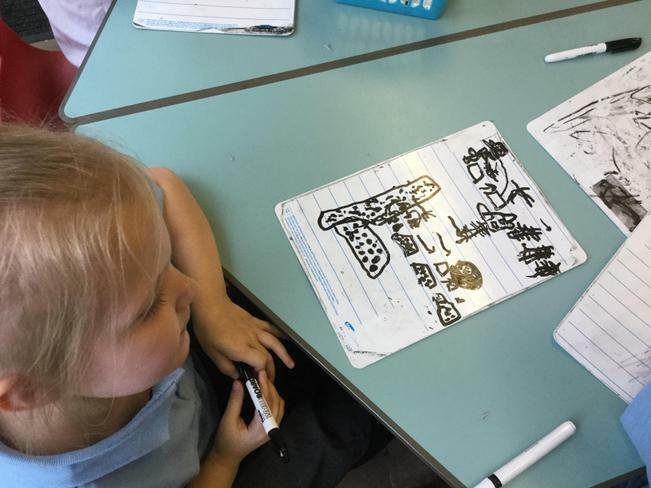 They have been trying hard to include a capital letter, finger spaces and a full stop in their sentence writing. 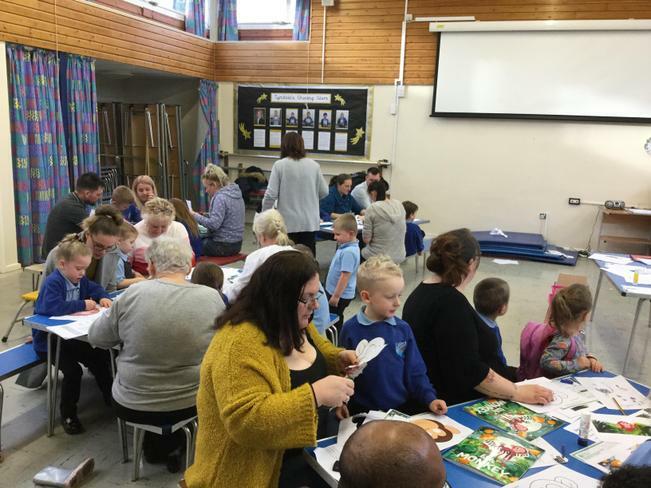 A great big thank you to all our parents and carers who have encouraged their children to come into class by themselves. 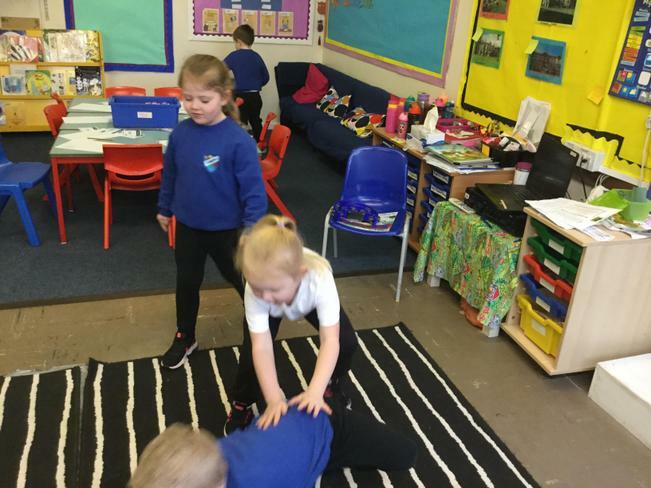 The children have been showing you how they have grown in independence and settle down to their morning activities much quicker now. If you have any messages please tell Mrs Ball or Mrs Beazer. Thank you. 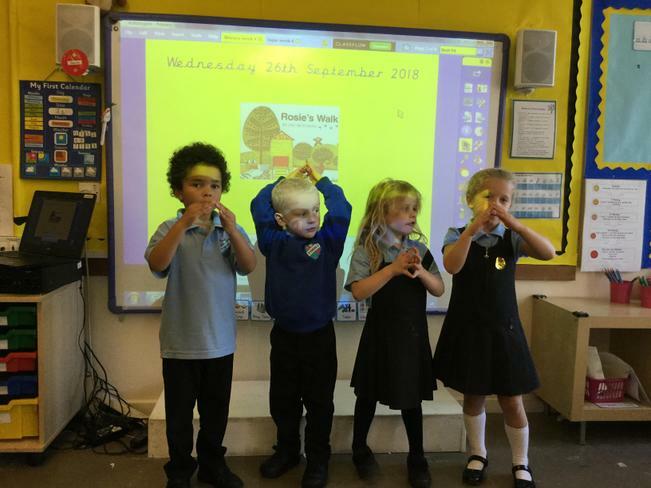 This week in phonics Owl Class have learnt the phase 3 sounds - 'y, z, zz,and sh'. 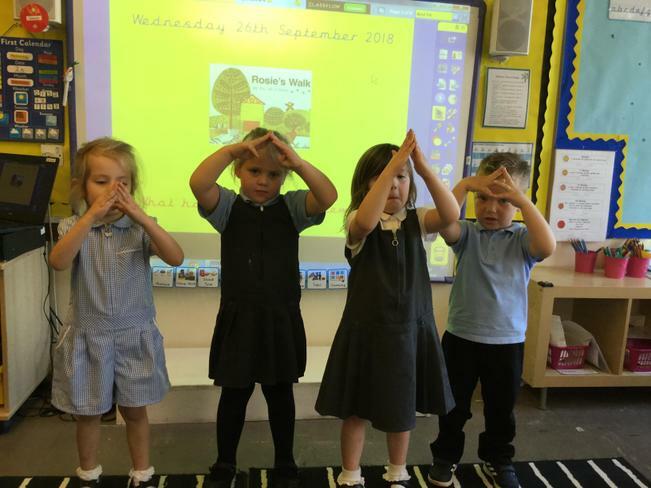 In Maths this week Owl Class have been learning about 'one less'. 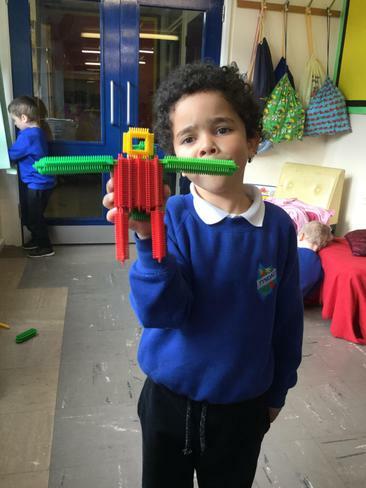 Firstly, they learnt how to do this practically with a range of objects, then how to record this pictorially. 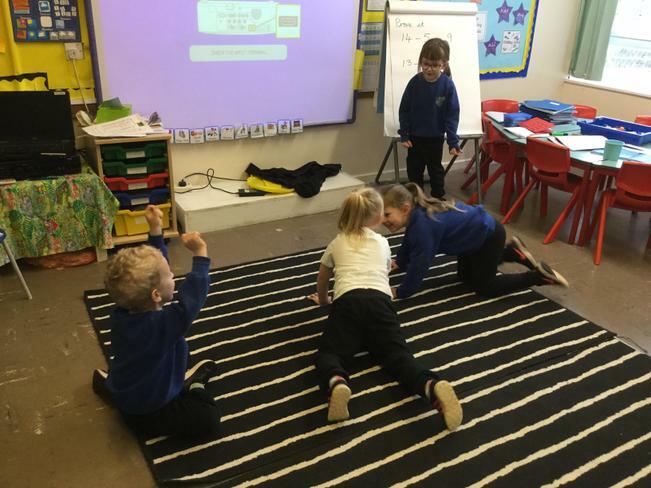 By the end of the week the children had been introduced to 'take-away' and were beginning to work out subtraction number sentences by themselves. 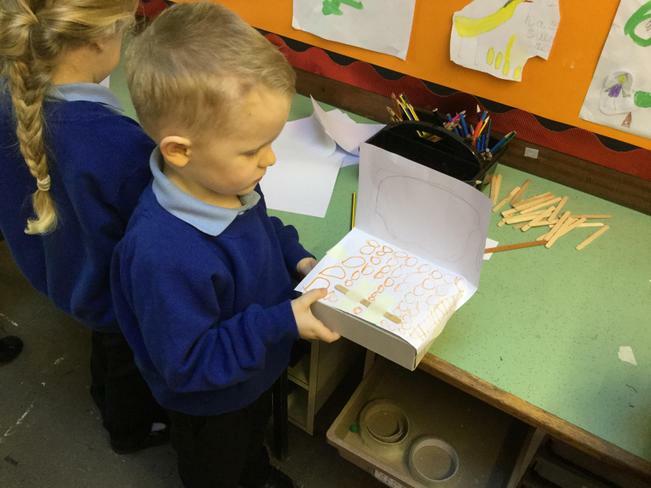 This week in English the children have been completing work based on another Julia Donaldson book - 'Cave Baby'. 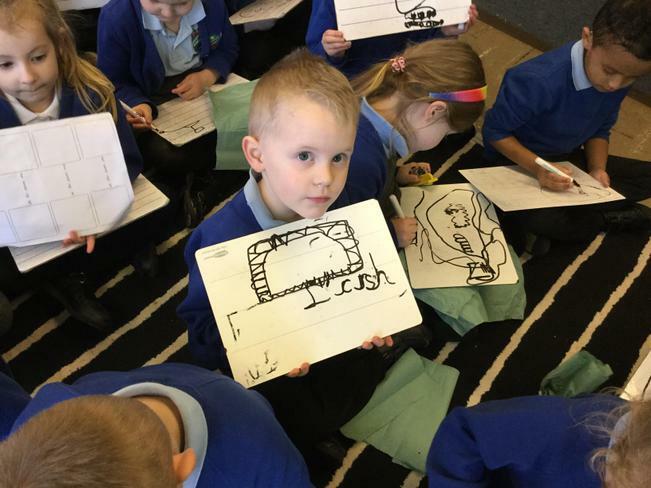 The children have written about their favourite part in the story, drawn a story map, wrote a character description and labels, and finally a sentence from the story. 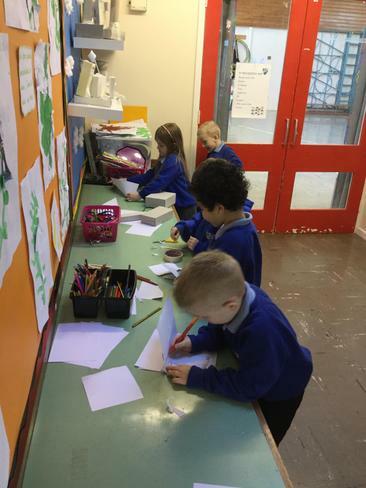 The children used their phonic knowledge whilst doing their activities this week and are beginning to show that they know how to write a sentence. 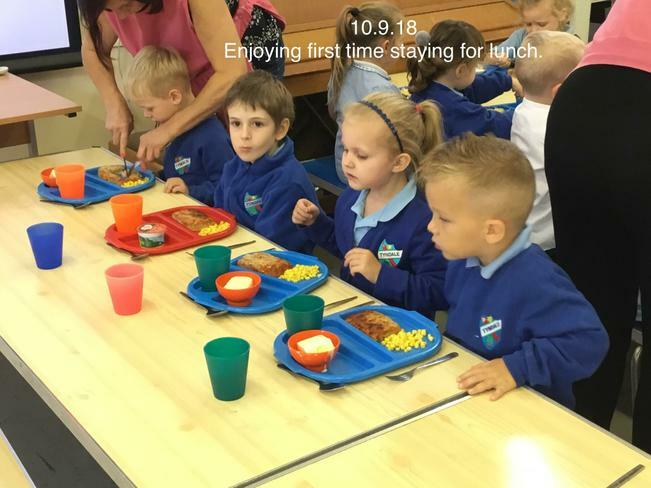 At Tyndale Primary School the children's attendance is monitored weekly. 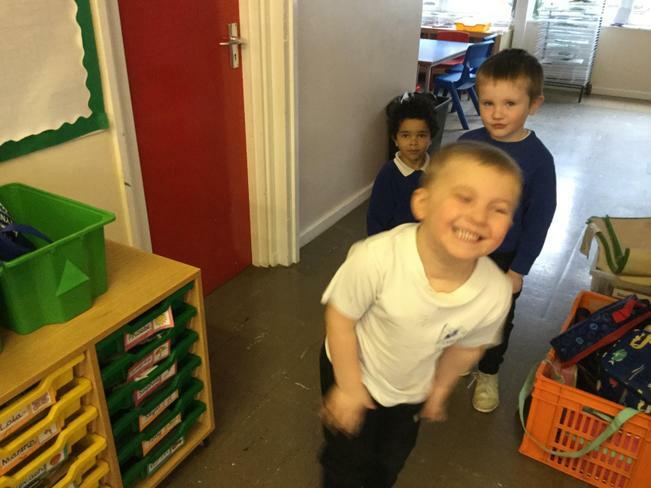 On Friday in assembly the class with the highest attendance is rewarded by looking after 'Sam the Dog' for the following week. 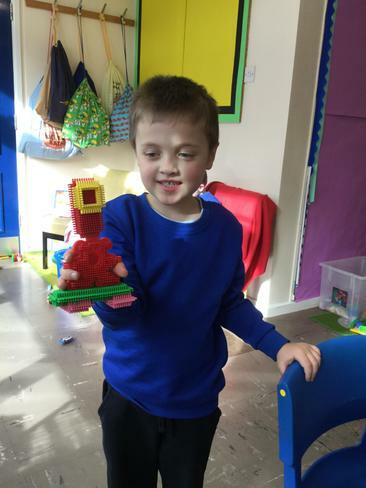 Owl Class have received Sam many times since starting in September, and he returned to Owl Class again on Friday! 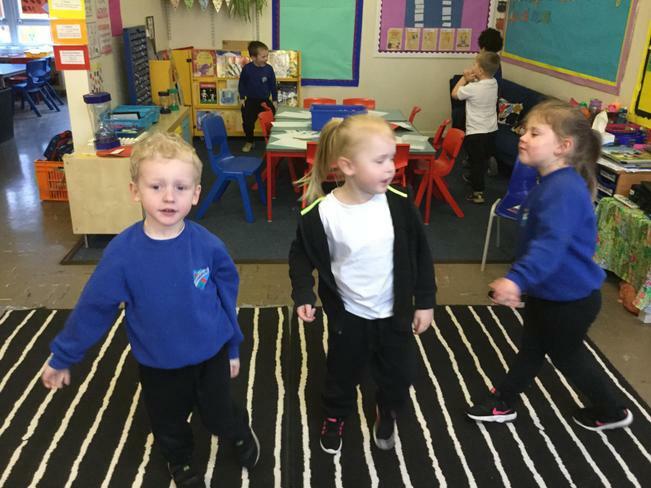 The children have been coming to school for almost a whole term now and are confident in their routines and the expectations. 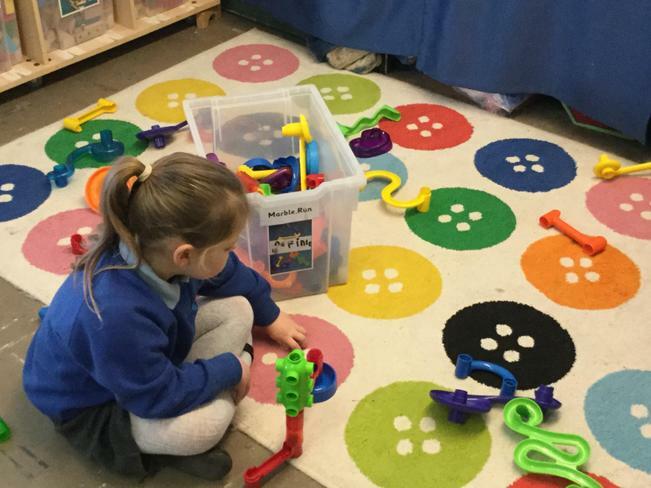 They are very independent now and able to find their own pegs, coats etc..Some mornings the cloakroom and classroom can be very busy with parents and carers and the children take longer than needed to settle down to their morning activity. 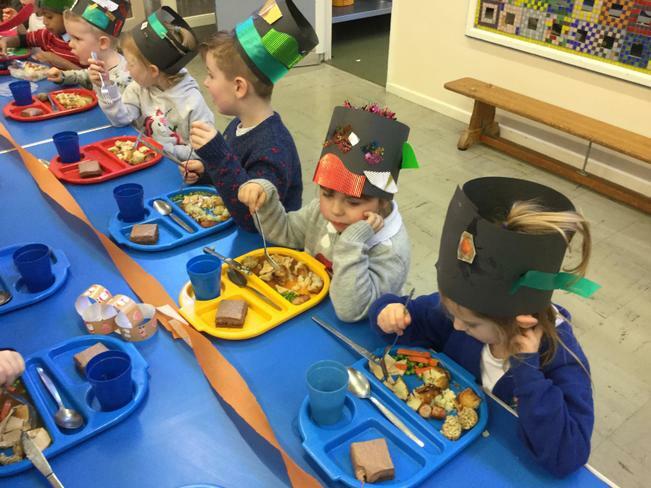 As from Monday 3rd December we would like you to encourage your child to come into class on their own and to watch and wave to them through the classroom windows. 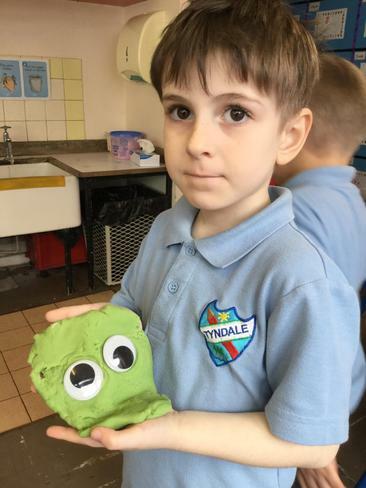 We discussed this together in Owl Class last week so the children would be prepared for this to happen. If you have any messages please speak to either Mrs Beazer or Mrs Ball as usual on the door. Thank you for your support! 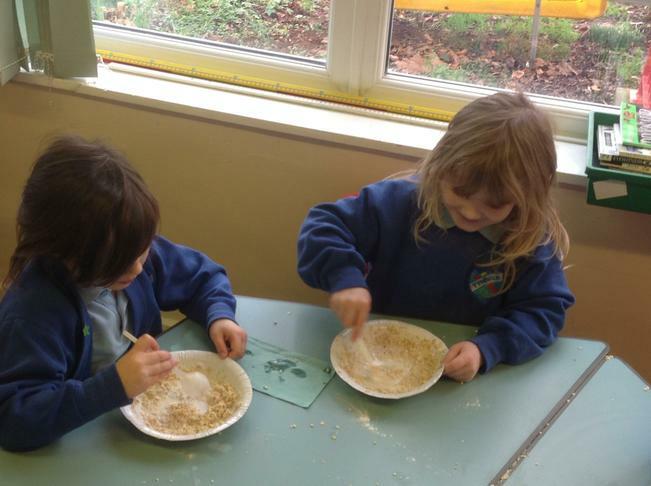 This week in phonics Owl Class have started learning phase 3 of ‘Letters and Sounds’. 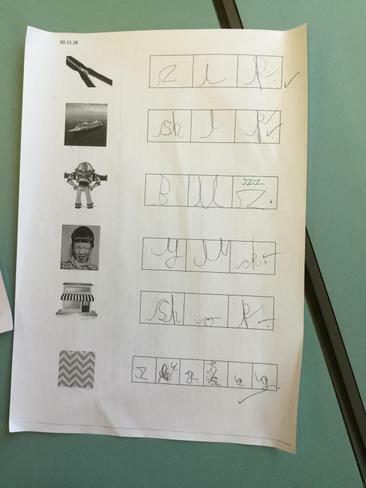 They have learnt to hear, say and write the sounds j, v, w and x. 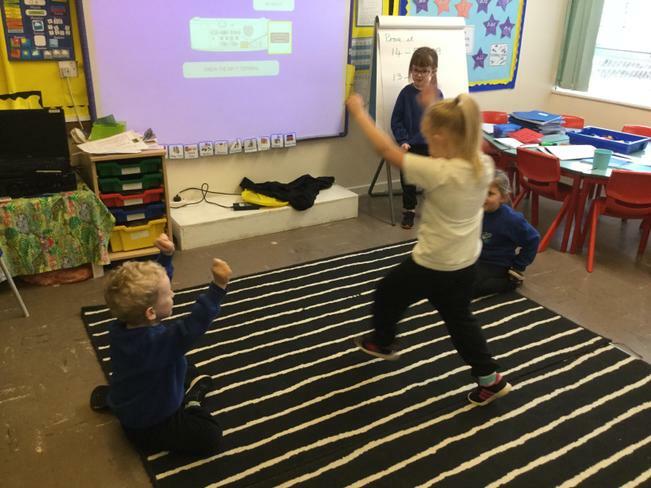 The children had also been introduced to the tricky words - he, me, we and be. 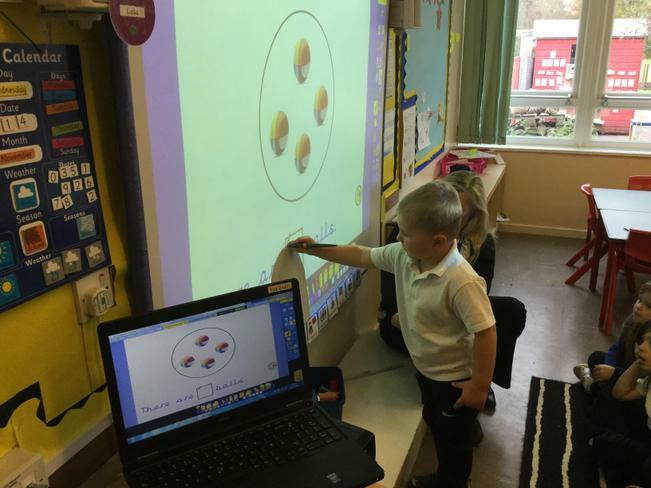 This week in Maths, Owl Class have been exploring addition. 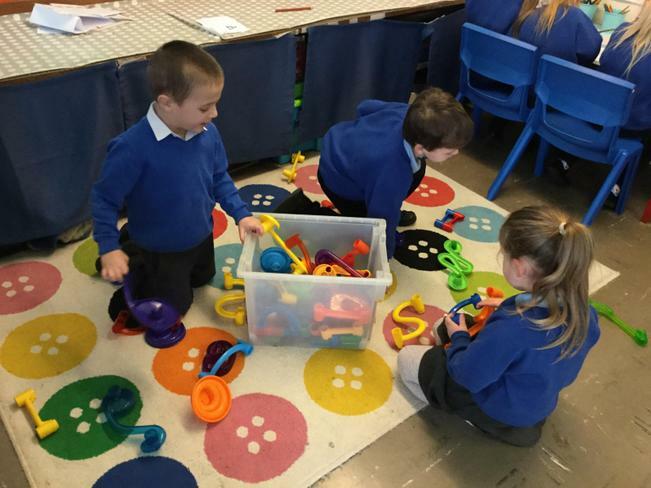 They have learnt that you can join together two groups of objects to find a total. 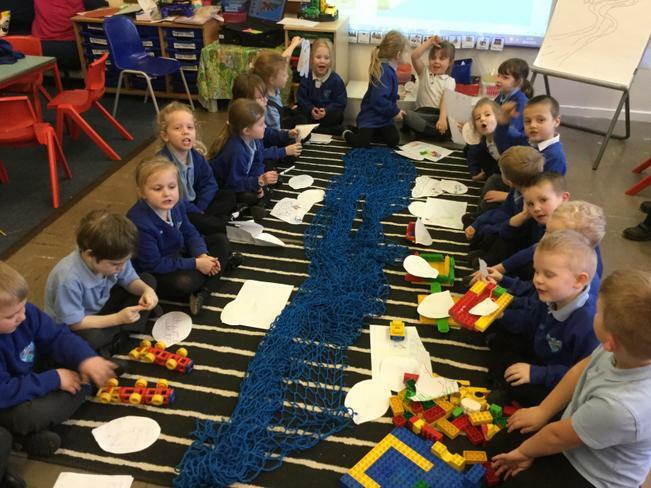 They have used lots of resources to do this practically including - bricks, buttons, Pom poms and compare bears. 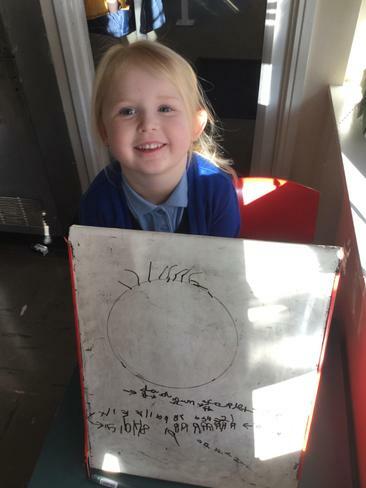 They have learnt how to use the ‘part part whole’ method to record addition pictorially, as well as drawing groups of circles. 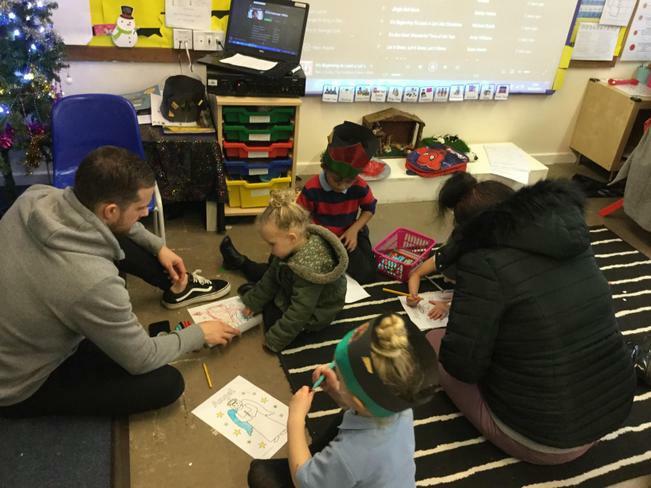 Towards the end of the week the children were introduced to the ‘+’ and ‘=‘ symbols and practiced reading number sentences and working out their answers. Our text for this week was ‘Tyrannosaurus Drip’ another story written by Julia Donaldson. 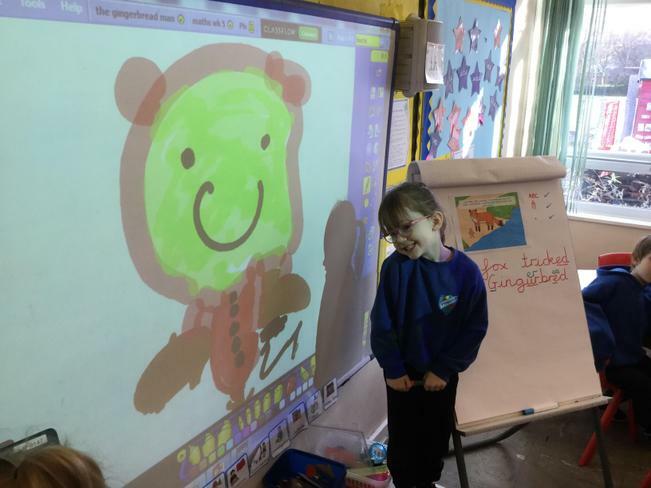 The children enjoyed the story and drew story maps and wrote character descriptions. 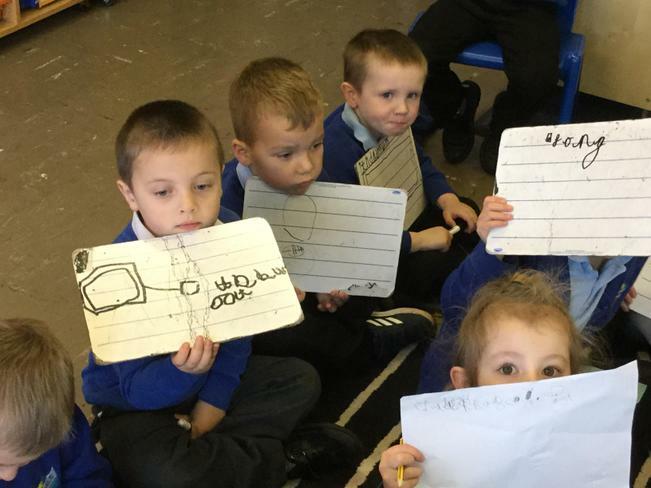 They used their phonic knowledge to help write sentences during our whole class session. 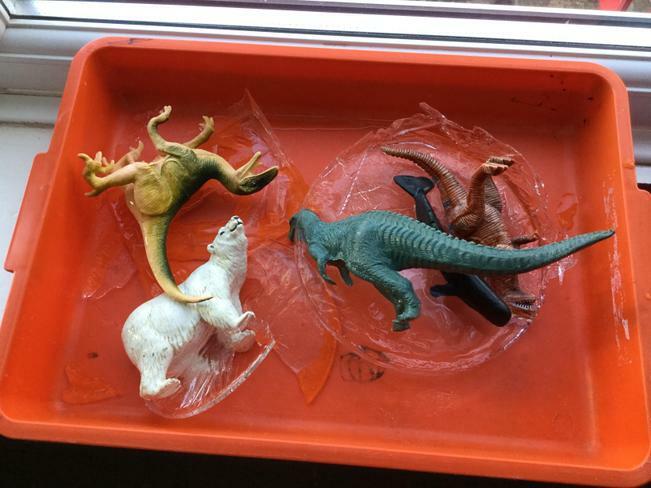 The text ‘ Tyrannosaurus Drip’ sparked an interest this week in dinosaurs and fossils. 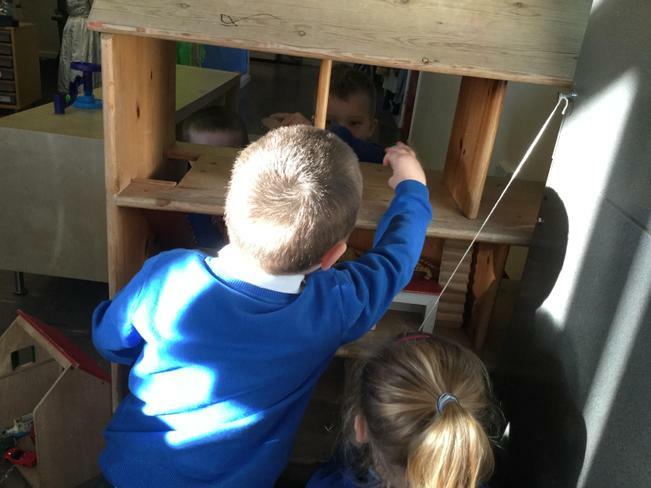 We converted our role play area into a dinosaur cave, and created dinosaur worlds with the wooden bricks. 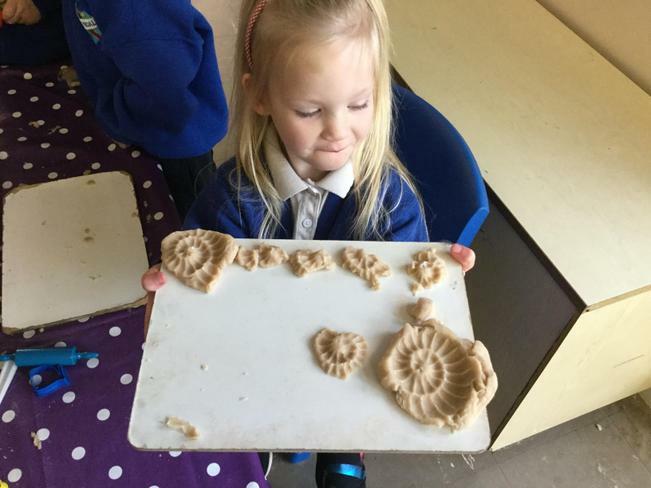 The children enjoyed looking at fossils with magnifying glasses and even had a go at drawing their own , and creating a fossil in playdough too. 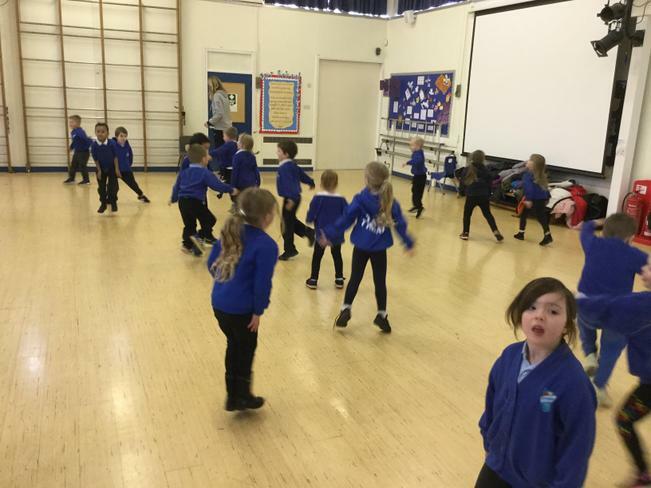 Owl Class have started rehearsing for their part in the Christmas play as well as learning lots of new songs too. 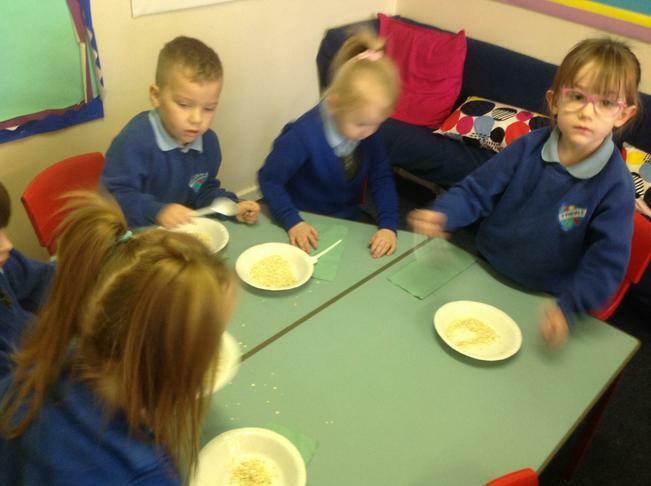 This week in phonics Owl Class have been practising the sounds they have learnt in phase 2 of Letters and Sounds. They have learnt to make sure when they say ‘n’ and ‘m’ they are pronounced differently. They have also practiced ‘c’, ‘k’ and ‘ck’ and where to usually find them in words. 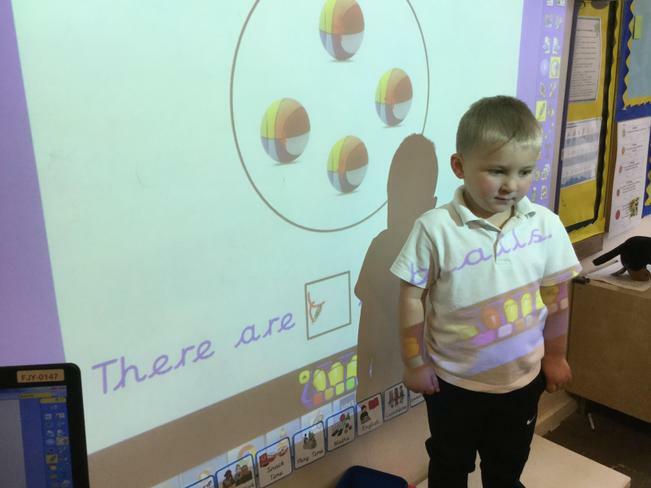 Owl Class have also learnt that ‘a, e, i, o and u’ are the vowels. 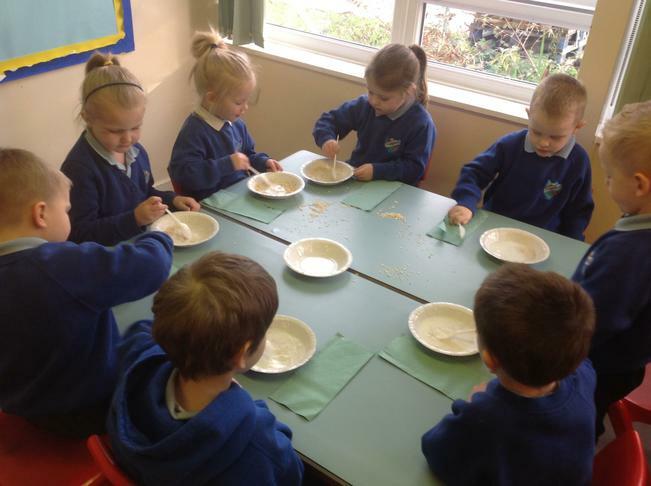 This week in maths, Owl Class have been learning about ‘more’ and ‘fewer’. 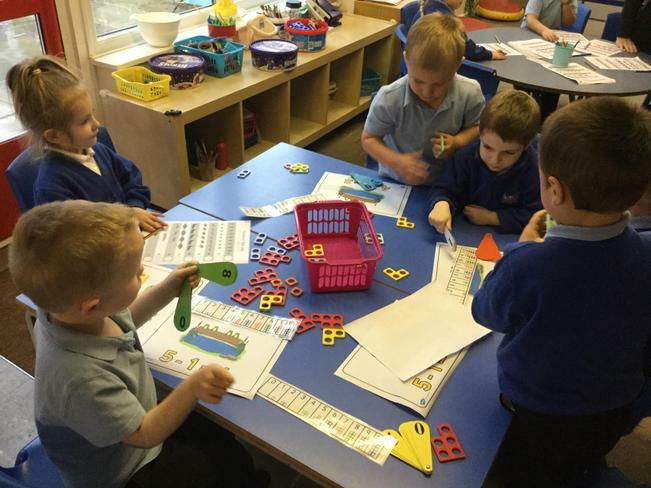 They have also learnt about how to count a set of objects accurately and find the number on a number line. 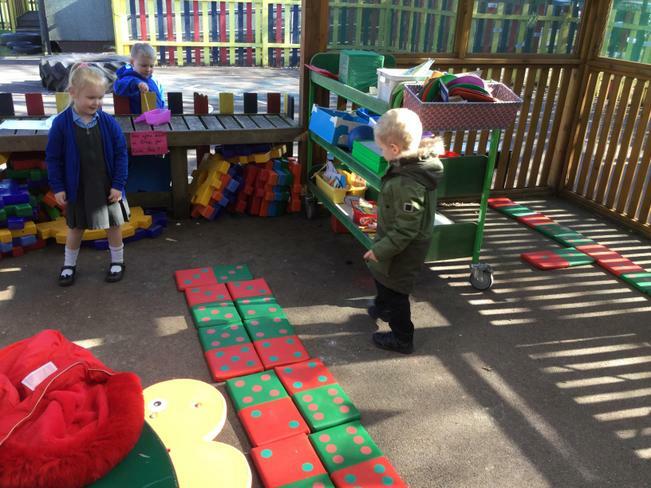 The children explored ‘one more’ and learnt that one more is the number that comes next on the number line. 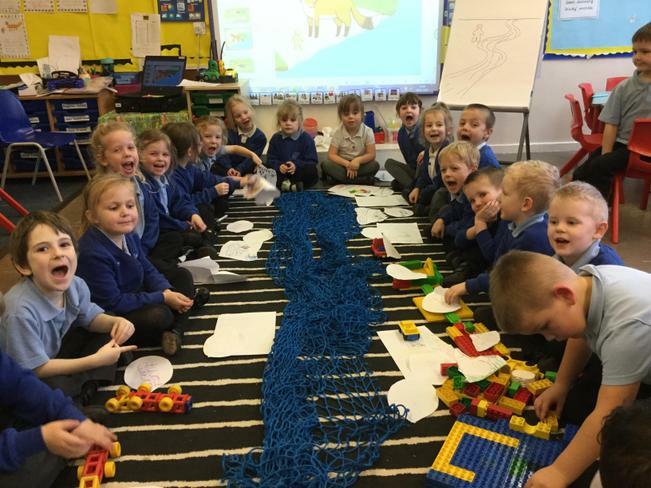 The children were introduced to ‘part, part, whole’ to show how 2 parts together make a whole number . 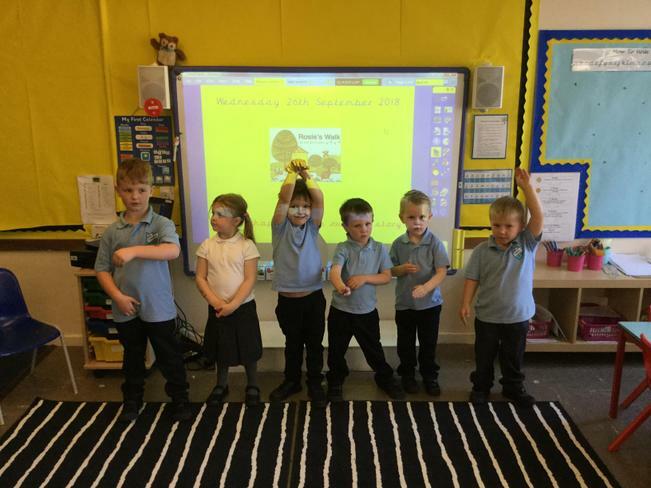 In English this week the children have explored the text ‘A squash and a squeeze’- another story written by Julia Donaldson. 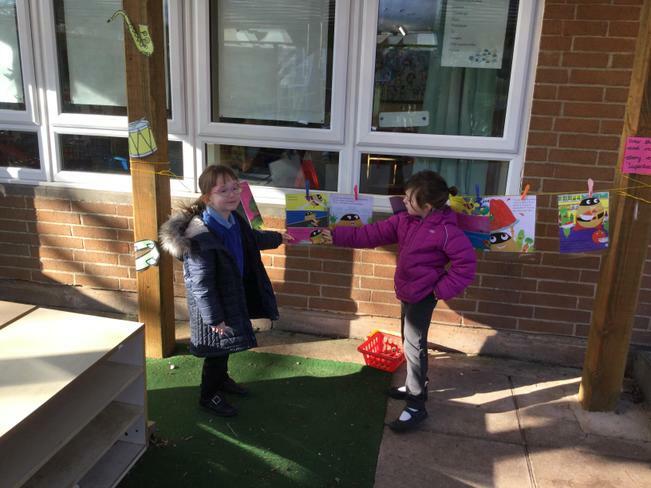 The children have enjoyed retelling the story using a story map. They discovered new words that they can use as an alternative to big and small. 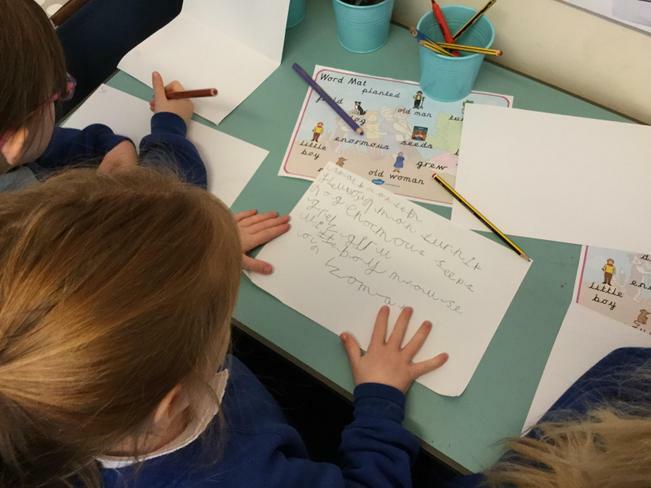 They used their phonic knowledge to help write sentences about the story, and a character description. 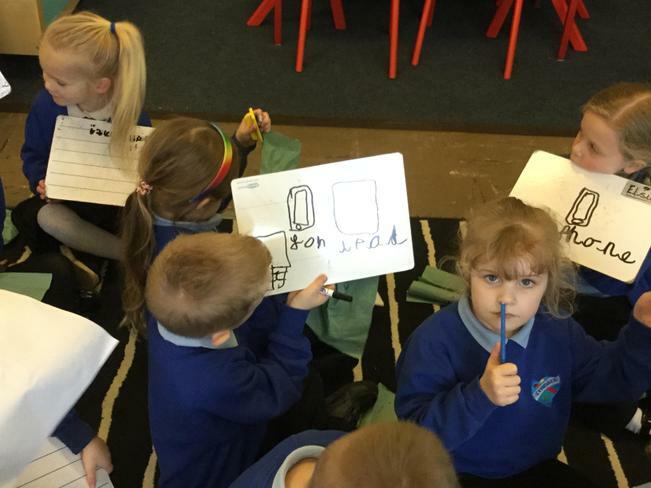 This week in phonics Owl Class have learnt the digraphs ‘ff, ll and ss’. 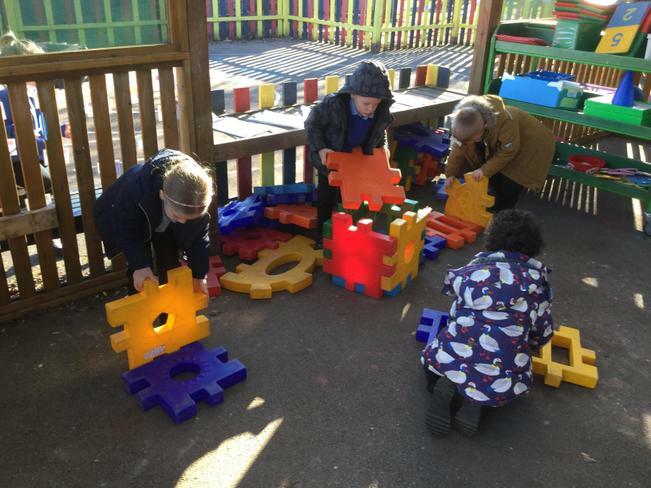 The children have now come to the end of Phase 2 in Letters and Sounds. 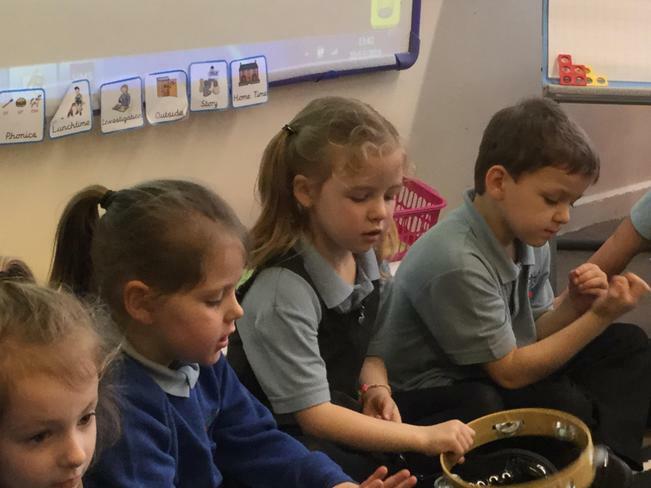 They will continue to practice the sounds they have learnt and how to ‘say and chop’ the sounds in words to be able to read and write them. 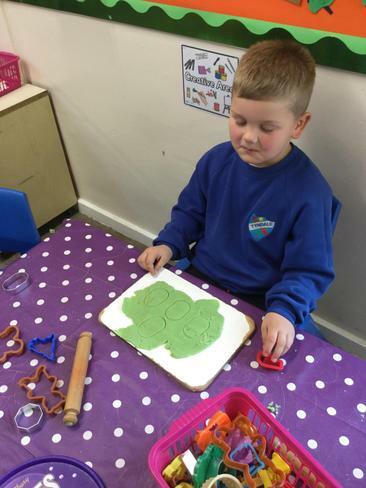 This week in Maths Owl Class have been learning about money. 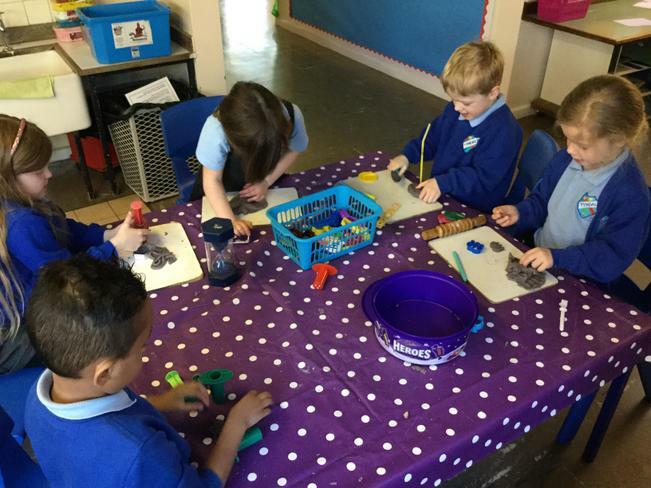 They have been introduced to 1p, 2p, 5p and 10p coins. 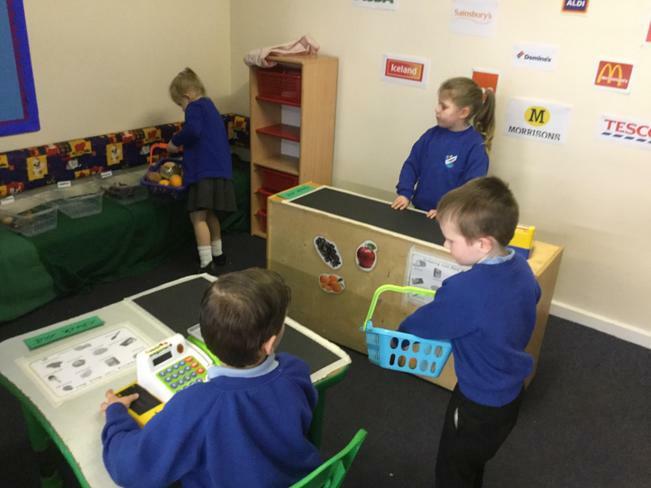 The children have experienced role playing in our class shop - and used money to buy items. 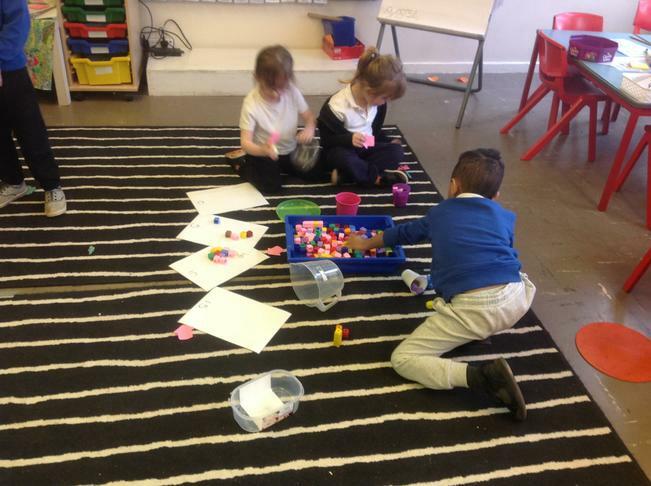 They have printed coins into purse and piggy bank shapes and counted how much money they had . 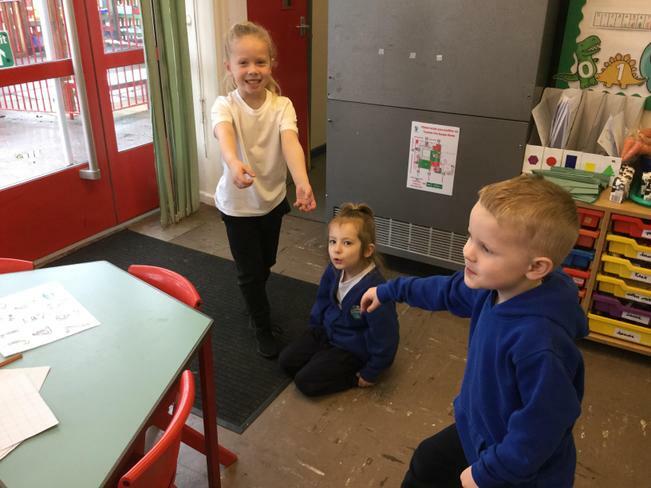 In English this week we have explored the text ‘Room on the Broom’. The children have shared their ideas to create a character description of the witch. 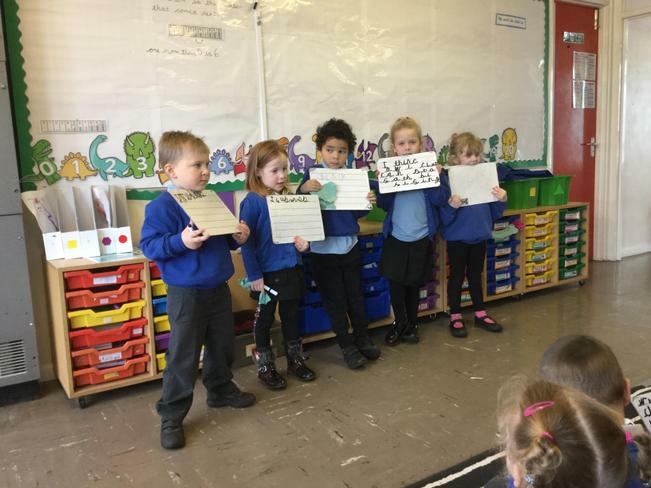 They have recalled the events in the story to create a class story map and used their phonic knowledge to add labels. 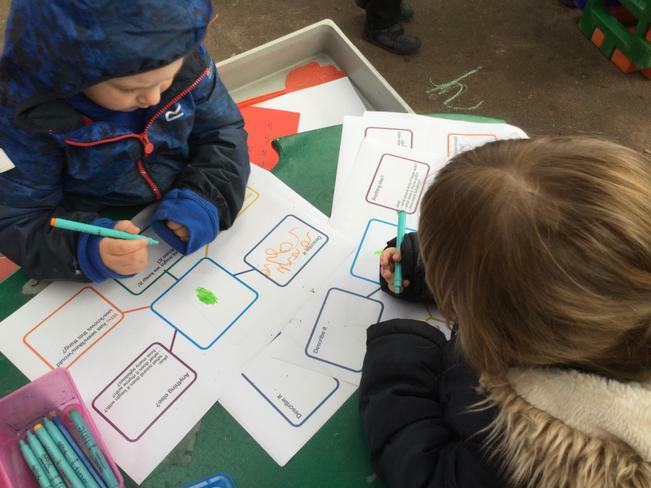 The children also helped compose sentences about the key events in the story . 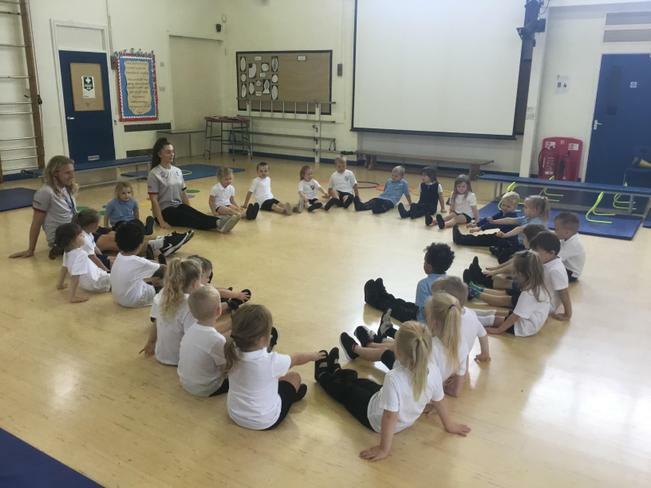 The children shared their half-term news in circle time and listened carefully to each other. 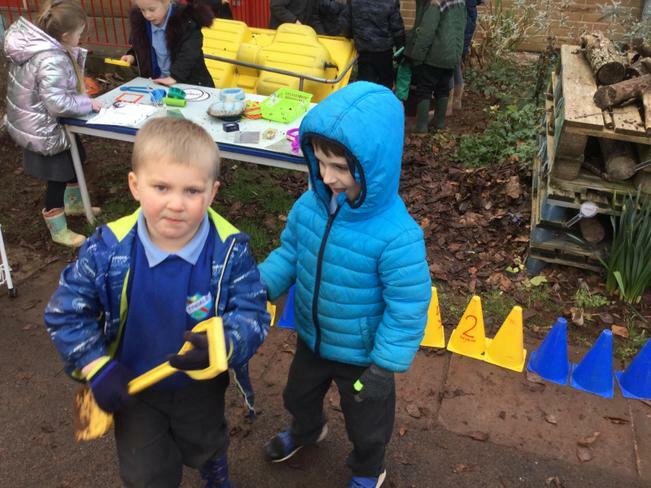 The children were keen to talk about and describe their bonfire and firework experiences. 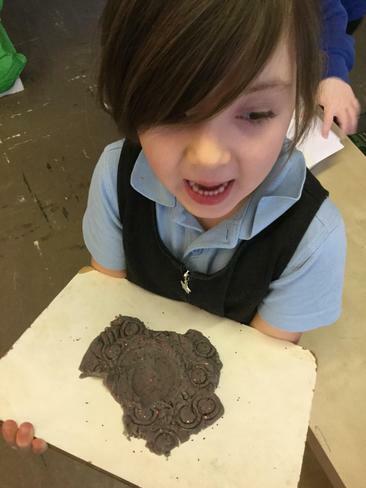 Owl Class learnt about the festival of light - ‘Diwali’ and used clay to make their own diva lamp. 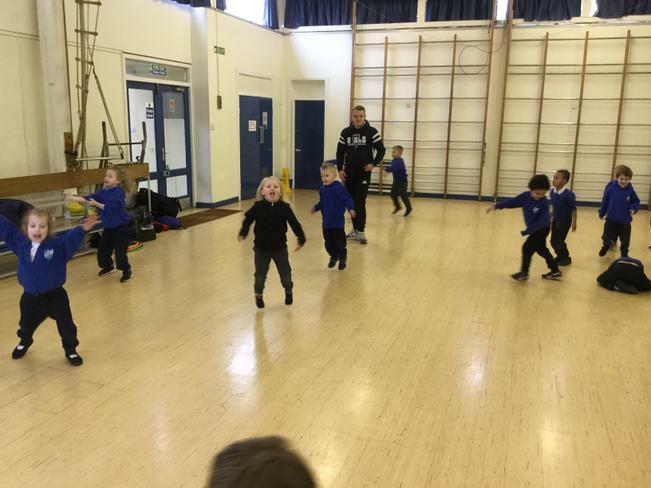 We had a visitor in from the Road Safety Team in South Gloucestershire. 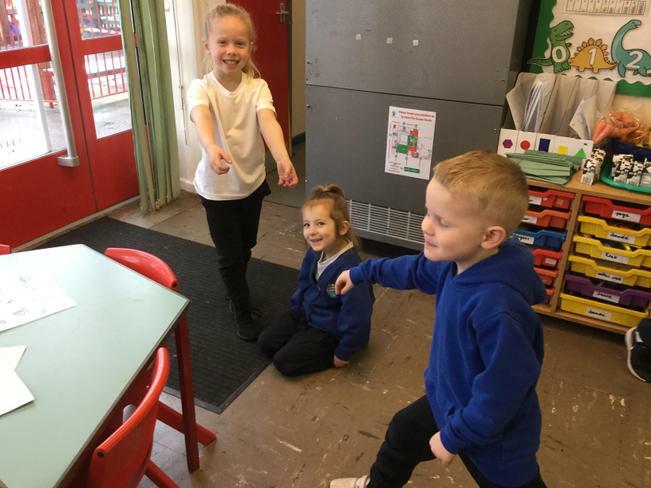 The children learnt about how to stay safe near roads and how to cross them . 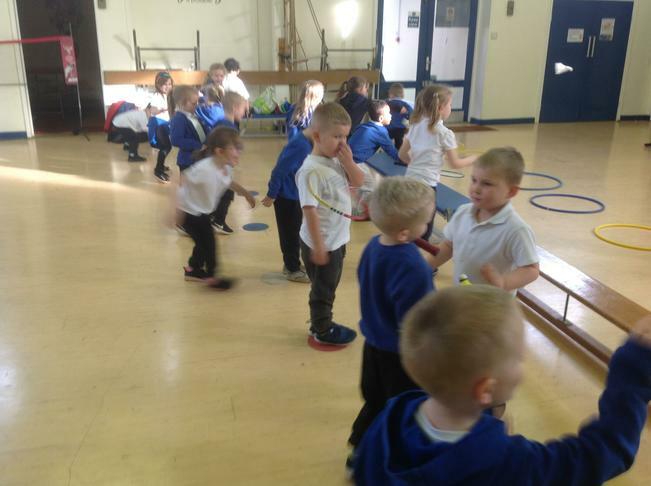 In PE this week the children experienced moving in different ways and in different directions (forwards, backwards and sideways). 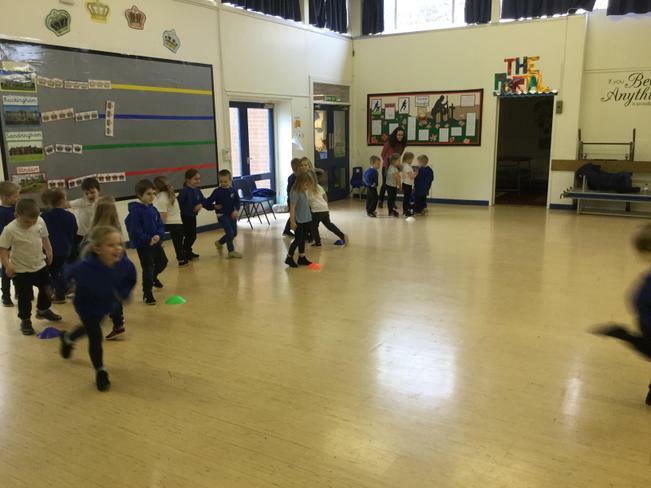 They learnt how to play two games - the ‘traffic light game’ and the ‘bean game’. 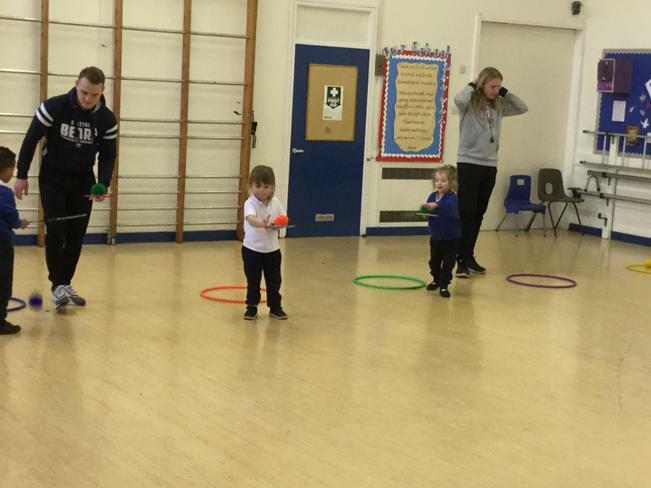 Our future PE sessions will be on Wednesday and Friday afternoons. 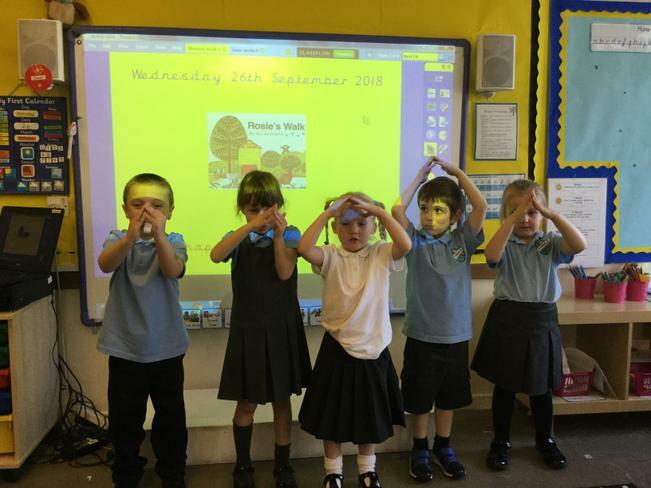 This week in phonics Owl Class have learnt the new sounds 'h, b, f and l'. 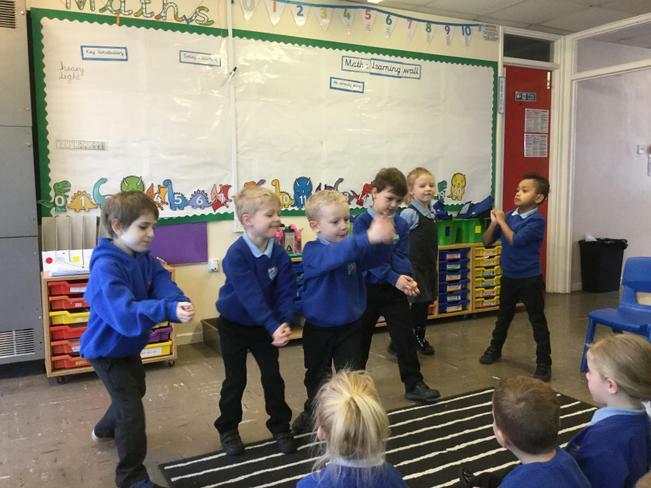 The children have been singing the Jolly Phonics songs to help them remember their new sounds. 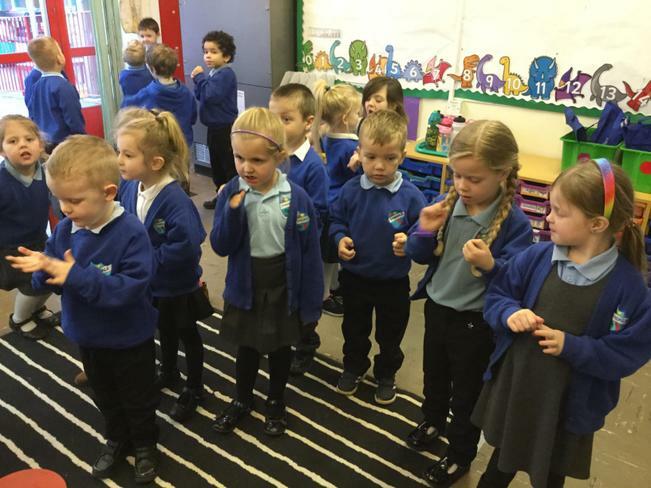 They have been practising saying the sounds and blending them to read simple words. 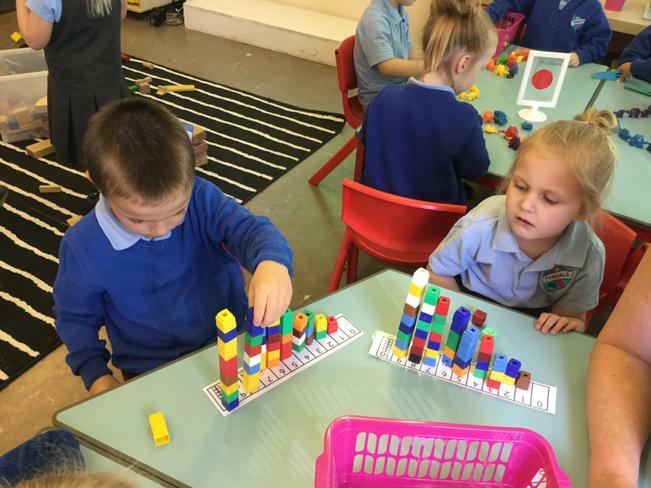 This week in Maths the children have been learning about patterns. 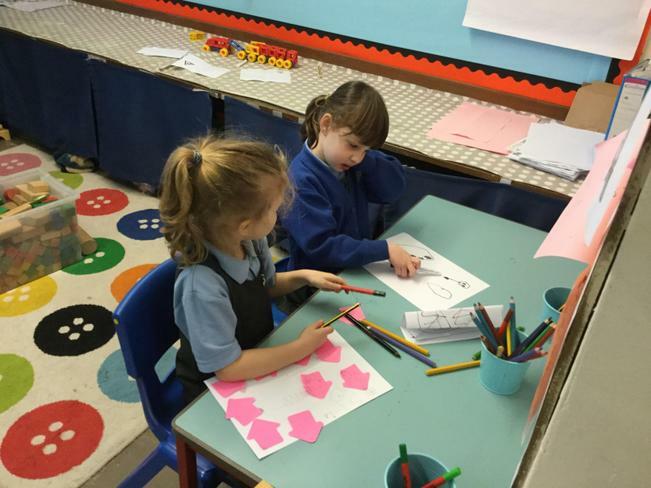 Firstly, they used their knowledge of shapes from last week to explore shape patterns. Then the children explored patterns involving shape and colour. They also looked at 2 patterns and talked about what was the same and different. 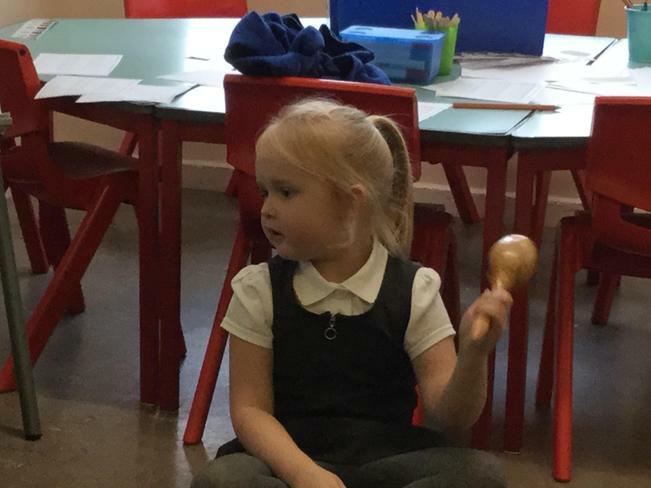 The children have learnt that sounds are all around us and identified shapes in the classroom environment. 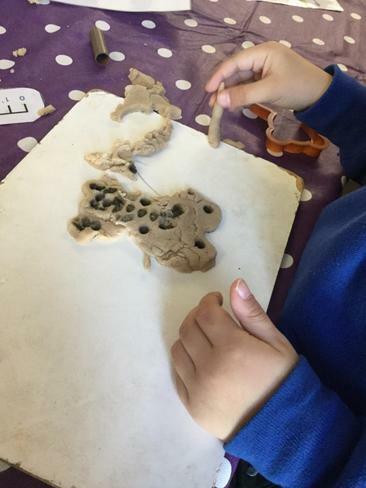 The children also explored mark making their own patterns and some children used their marks to design their own jumper pattern. 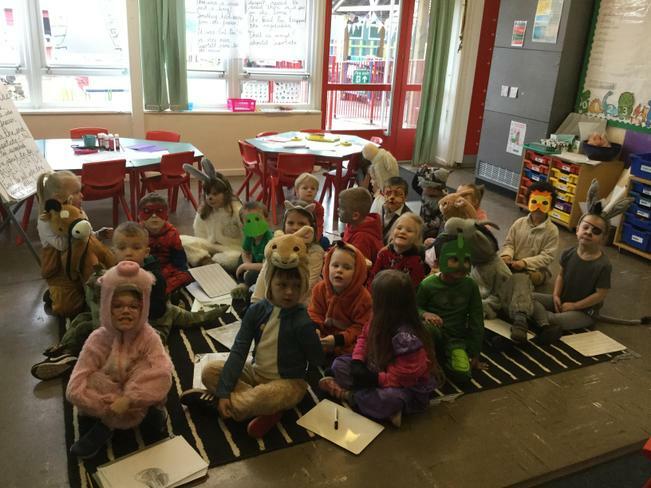 This week in English the children have explored the story of the 'Gruffalo'. As a class we wrote a character description of the 'Gruffalo' to include - 'black tongue', 'poisonous wart' and purple prickles'. 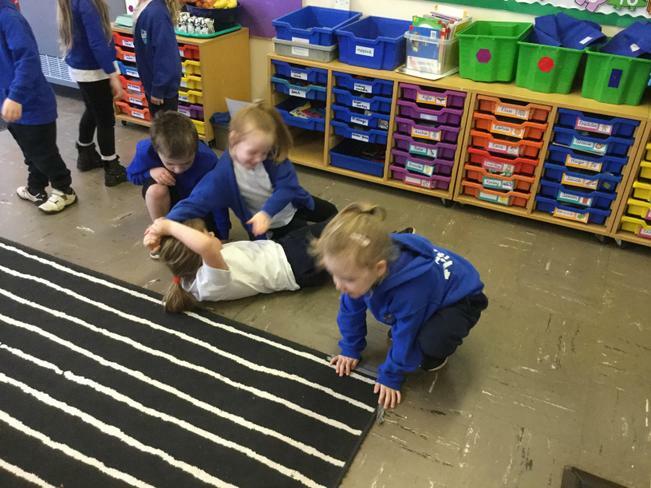 The children helped recall the events in the story to be able to create a class story map. 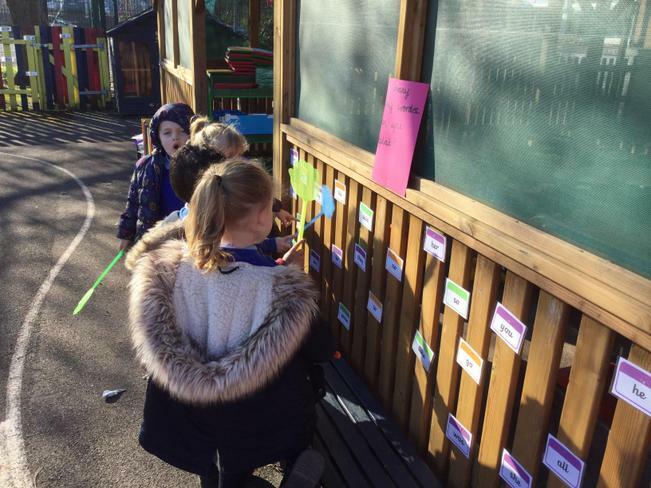 The children used their phonic knowledge to help write labels for key events on our story map. 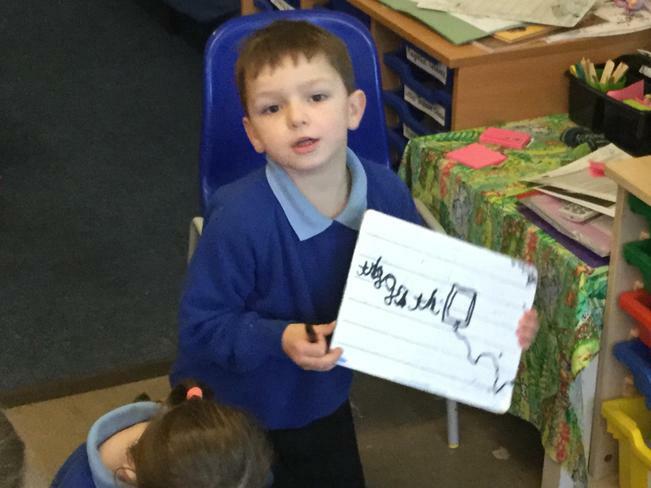 The children saw how finger spaces and full stops are used in a sentence when Mrs Milverton wrote sentences about the 'Gruffalo' on the board. 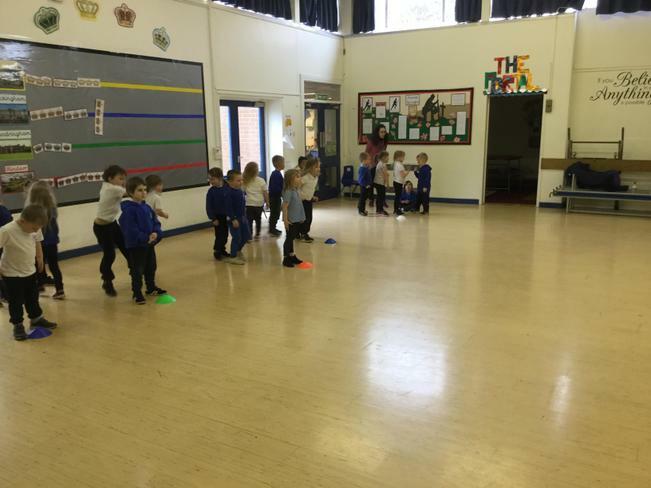 This week the children in Owl Class had their final PE lesson with the coaches. 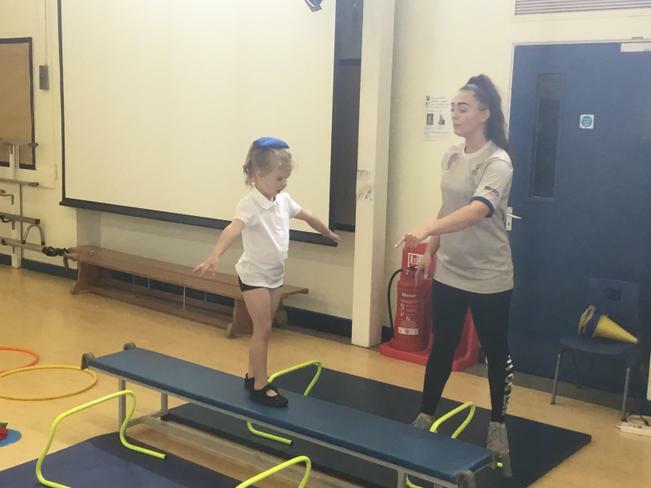 The children have progressed well in these lessons - both in confidence and in their control on the apparatus. 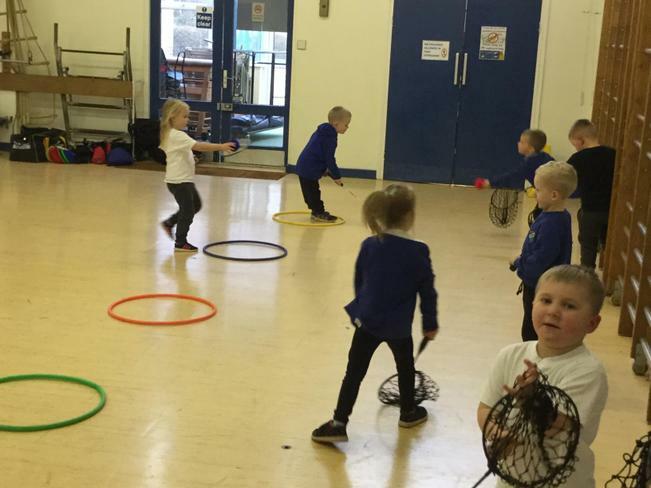 Please could you ensure your child has a named PE kit on their peg every day after half term - this ensures we can continue to do physical exercise on any day. 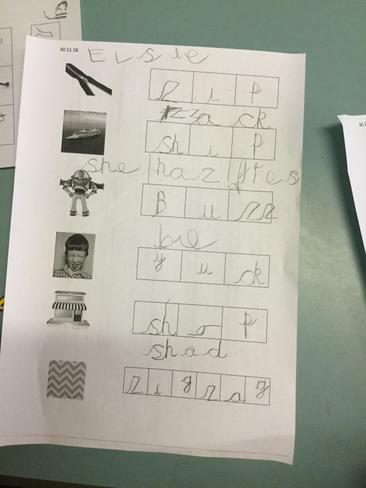 You child has bought home a letter formation sheet for both upper and lower case letters. 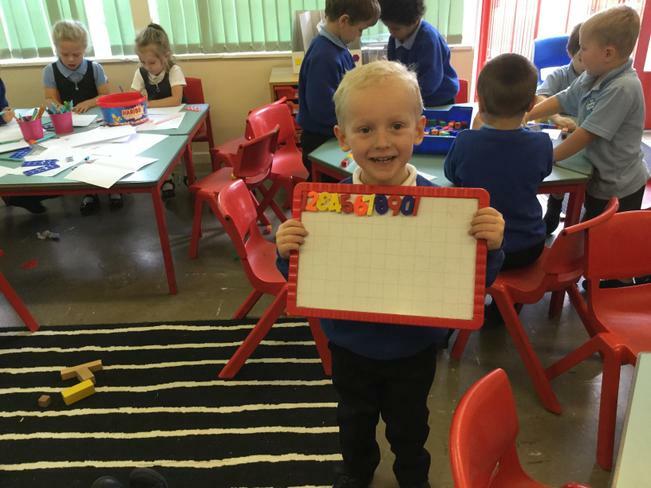 They have a sheet with their name in dots for them to practice writing their own name. 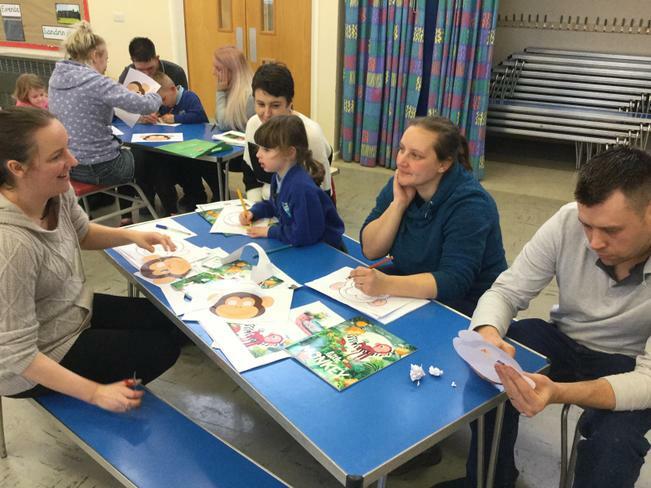 There is another activity for the children to do if they wish - reading the sentences, and matching to the correct picture. 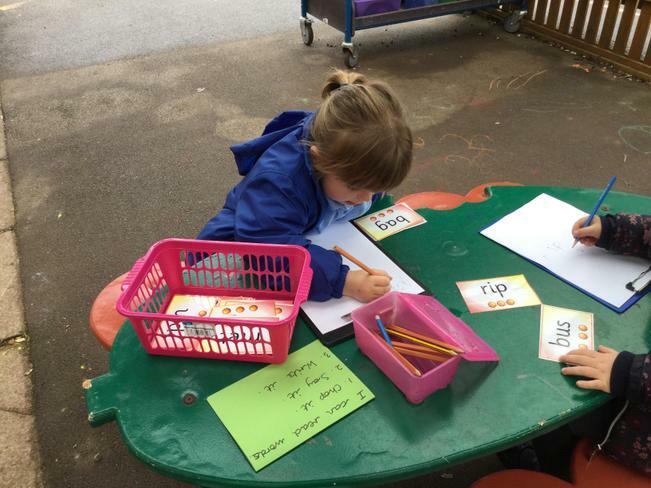 The children could also have a go at writing their own sentences. 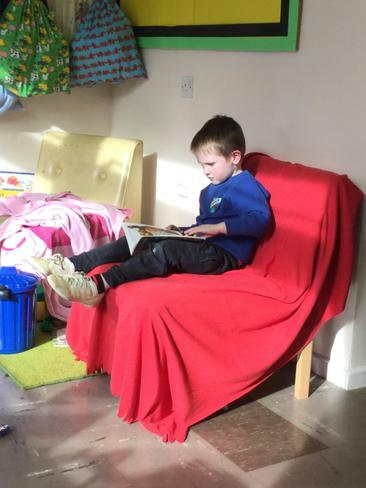 In addition the children have their reading books to share with you at home. 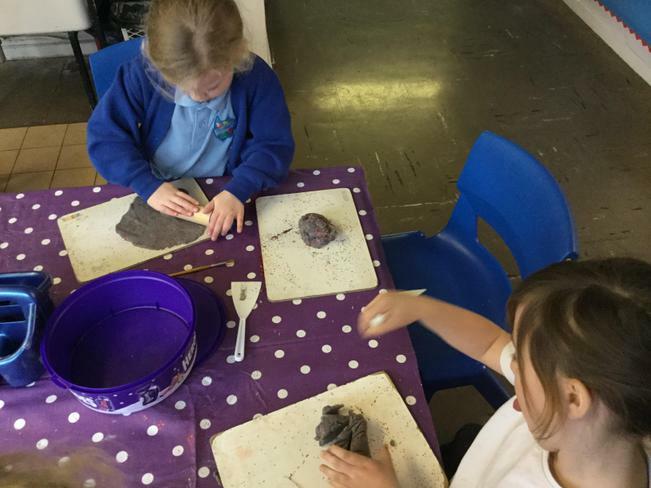 We hope you and your child have a lovely half-term, and we look forward to welcoming Owl Class back on Tuesday 6th November. 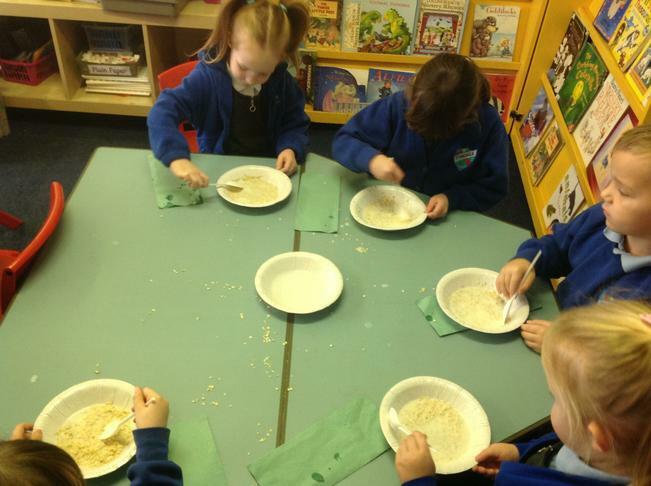 This week in phonics Owl Class have learnt four more new sounds - 'ck', 'e', 'u' and 'r'. 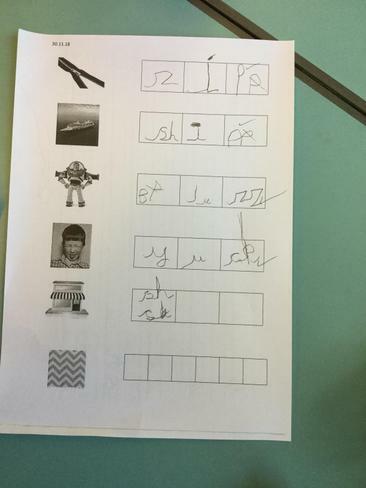 They have learnt that 'ck' is 2 letters together, but they only make one sound - this is called a 'digraph'. 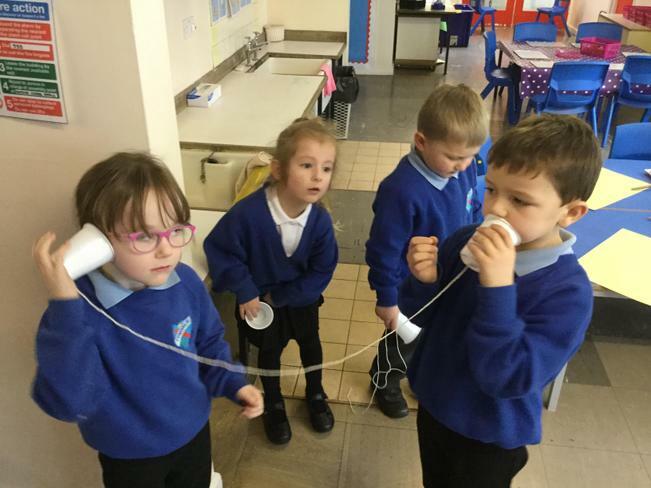 The children have also learnt that this sound is only seen/heard at the end of a word. They have also been learning the tricky word 'into'. 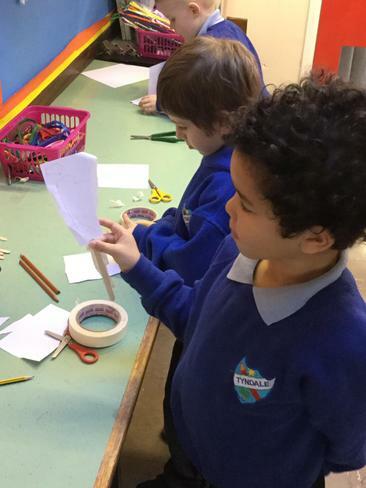 This week in Maths the children have been learning about 2D shapes - circle, square, triangle, rectangle and hexagon. 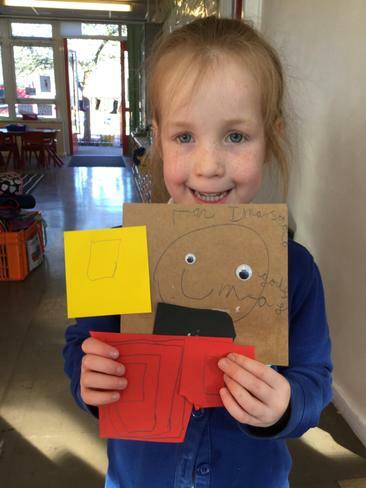 They have been learning the mathematical language to describe the shapes - sides, corners/points and face. 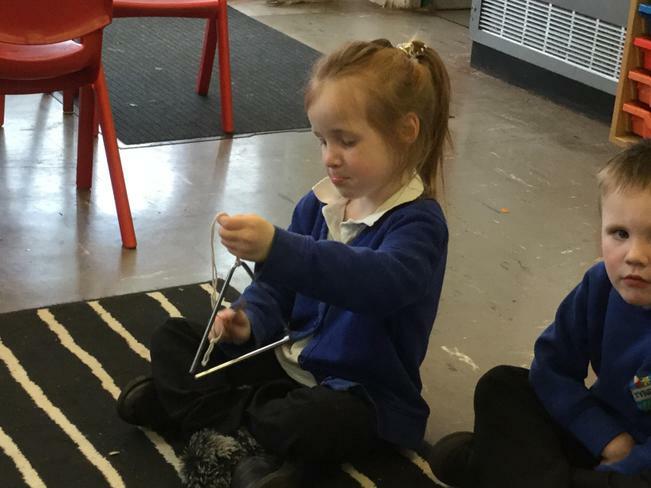 They have enjoyed describing shapes for each other and guessing what they are. 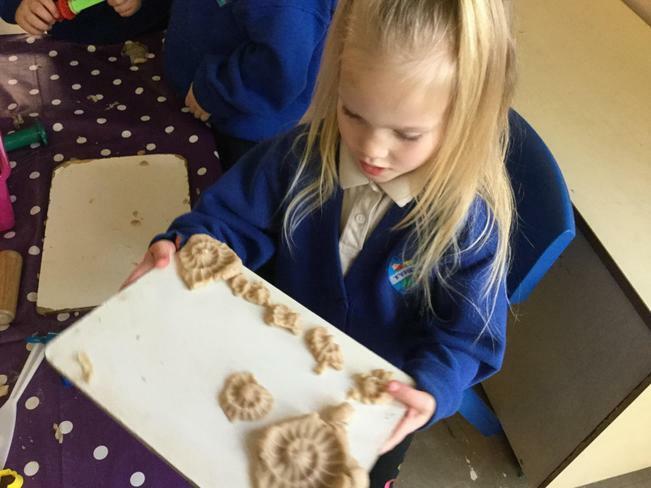 The children also used shapes to make patterns. 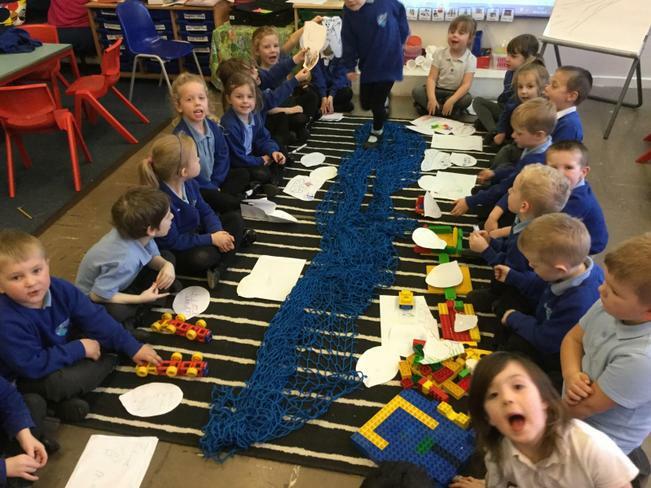 This week in English the children recalled their new story of Rosie's Walk and we used our class ideas to create a story map to help us retell the story. 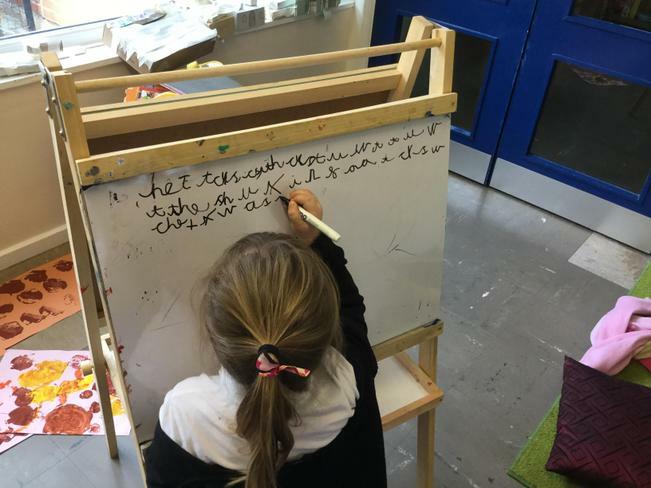 The children also learnt about what a sentence must have - capital letter at the beginning, finger spaces between the words and a full stop at the end. 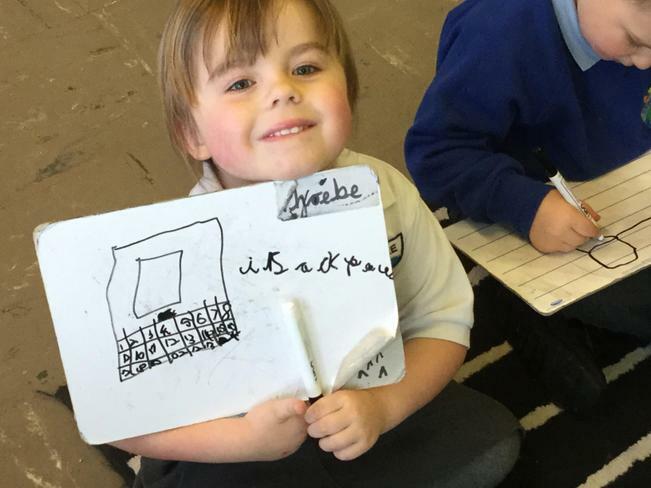 The children had a go at writing their first sentences eg. 'I am Toby. I am 5.' 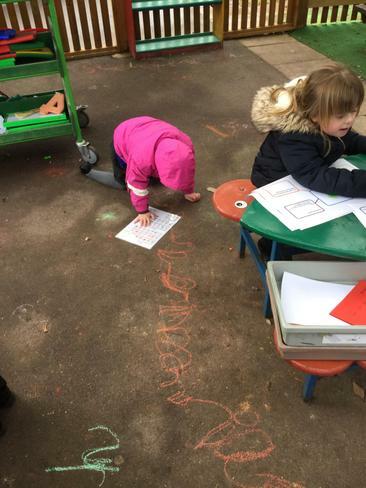 The children all tried very hard and were very pleased with their writing. 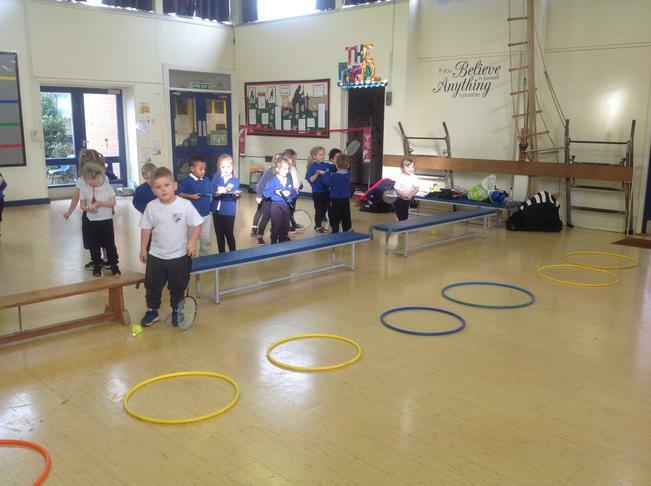 The children have been listening very carefully to their P.E. coaches on a Thursday afternoon. 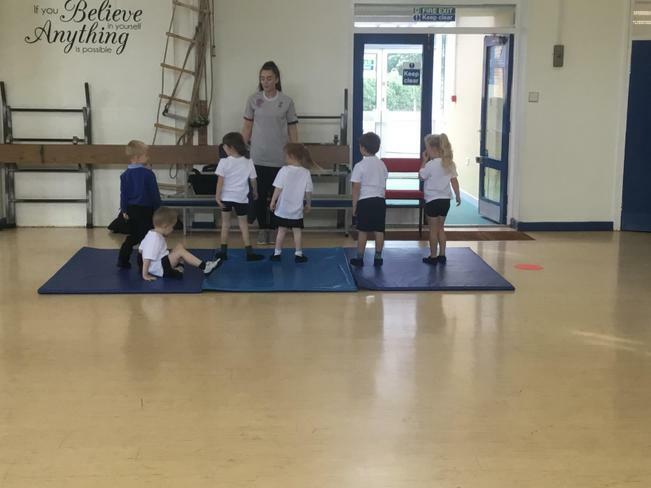 All the children have shown they can move across the apparatus safely, and have been trying very hand to land and stay on their feet when jumping. 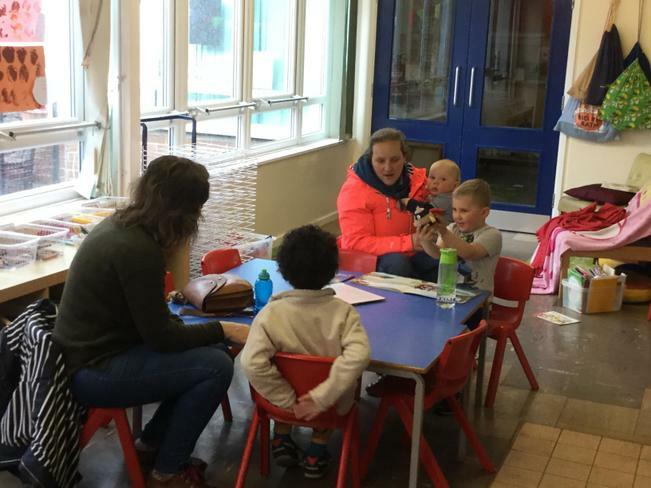 They have one more session with Sam and Lara before half-term. P.E. kits will be sent home on Thursday this week. 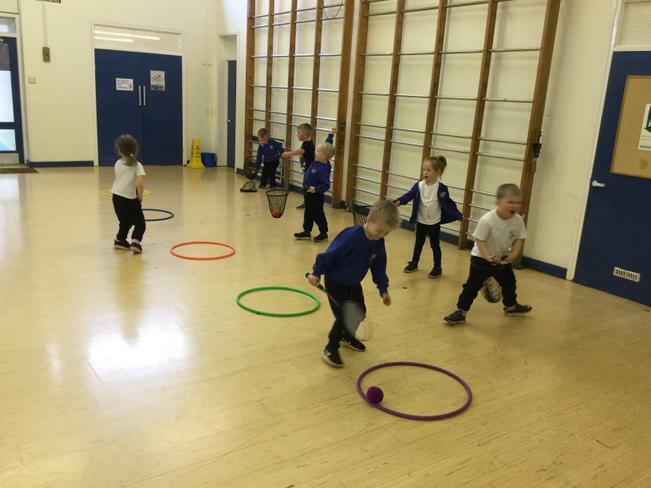 Owl Class P.E. days will be changing after half term and you will be notified of our new days next week. 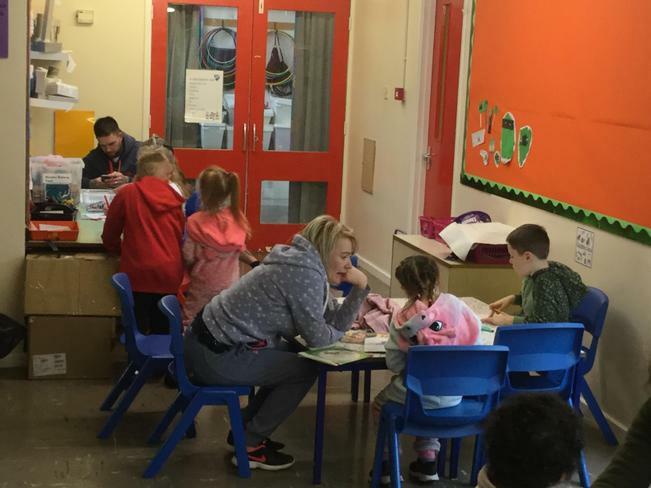 It is helpful is your child could have their kit in school every day in case there is a change to our scheduled session. 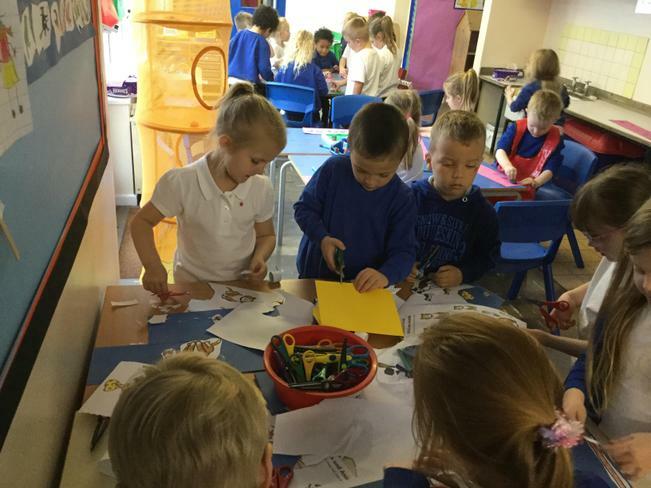 The children are getting much better this week at remembering their book bags every day. 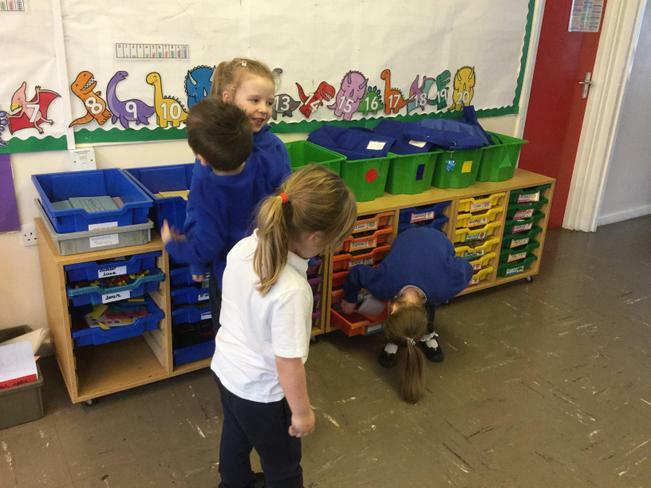 They have also been placing their book bags into the correct box in the classroom. 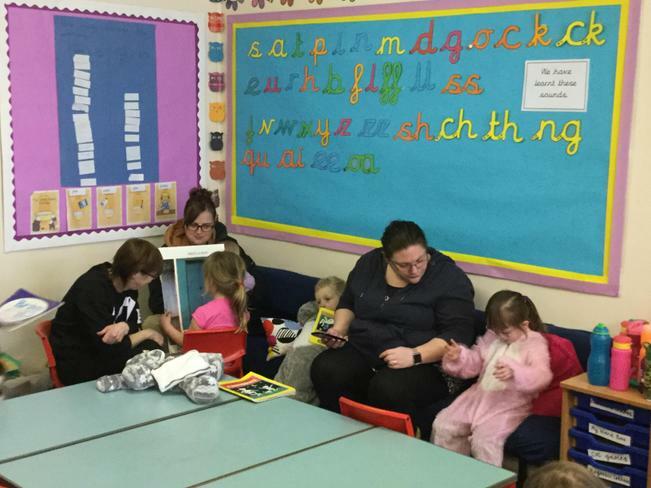 If your child doesn't have a book bag, please could you encourage them to take their book and reading record out of their back pack, and put it into the correct box. Thank you for your support. 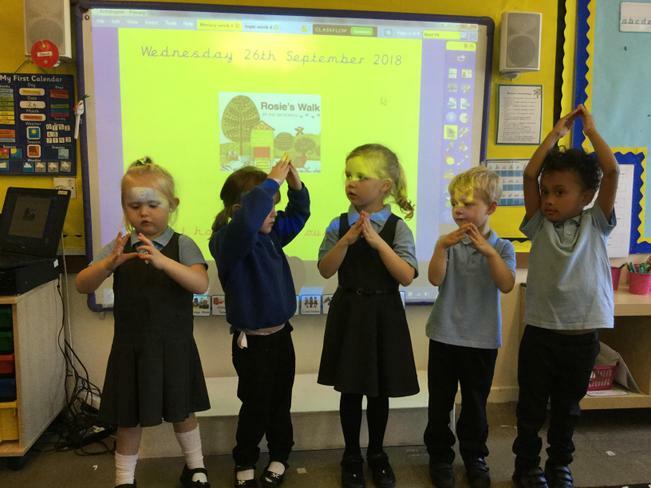 This week in Owl Class the children have learnt four more sounds - 'g', 'o', 'c' and 'k'. 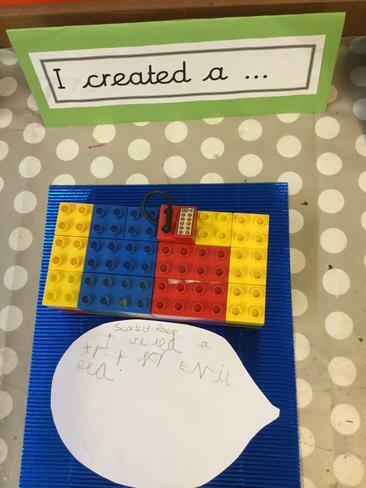 The children have been practising talking like robots, and have been segmenting and blending the sounds they can hear and see in words. For example - 'g-o-t' - 'got', 't-o-p' - 'top'. 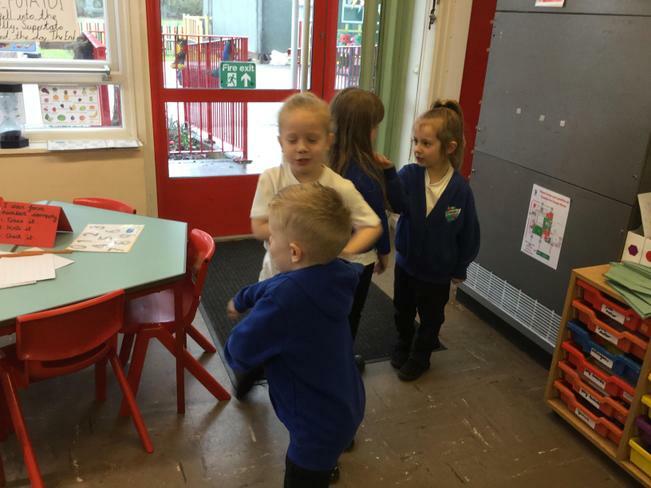 The children have also been learning two more tricky words - 'no' and 'go'. 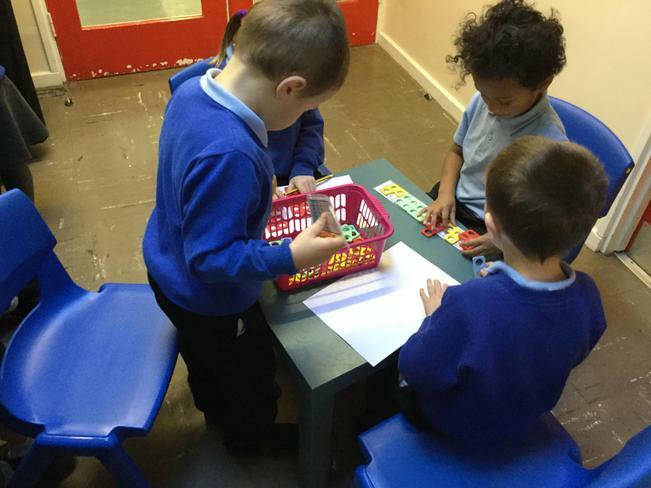 This week the children have been learning how to match numbers and quantities correctly. 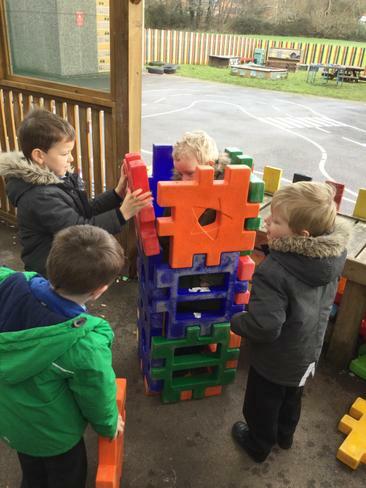 They have used bricks to build towers to match numbers, explored rolling dice and finding matching numicon pieces, and used number fans to choose a numeral and made a row of objects to match. 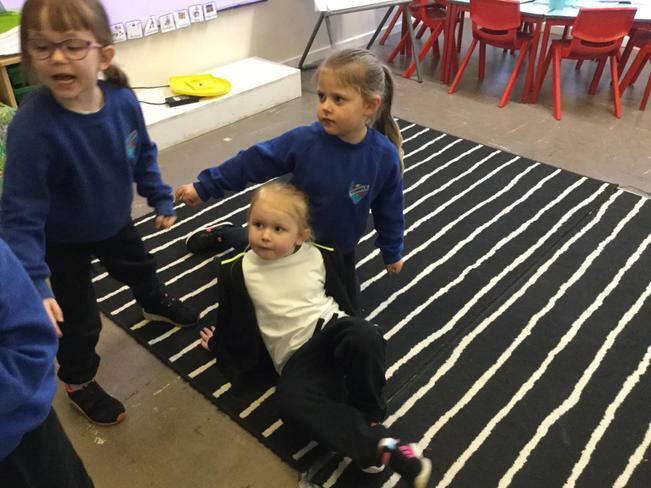 This week the children have been changing the story of 'Rosie's Walk'. 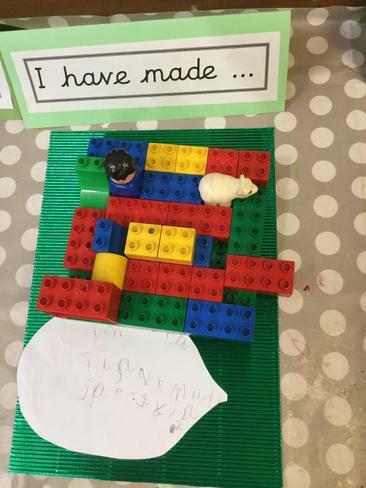 We talked about where else Rosie the hen could go for a walk. 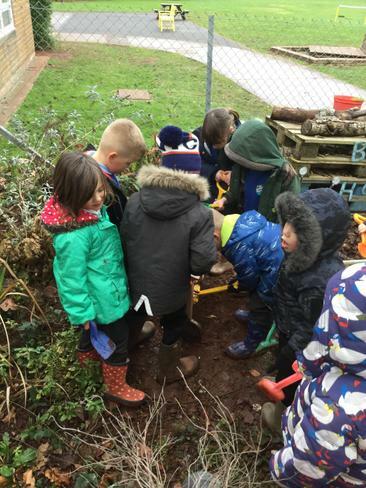 The children suggested - the woods, the park, the beach, around a castle and Tyndale Primary School. 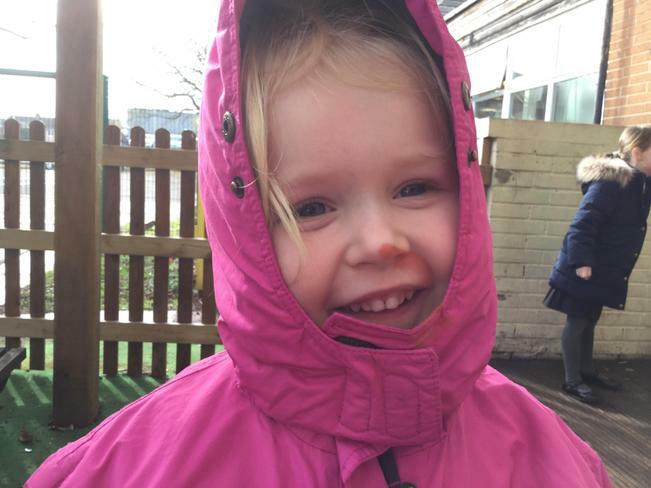 We did a class vote to decide where Rosie is going to go on her new walk - the winner was 'Tyndale Primary School'. 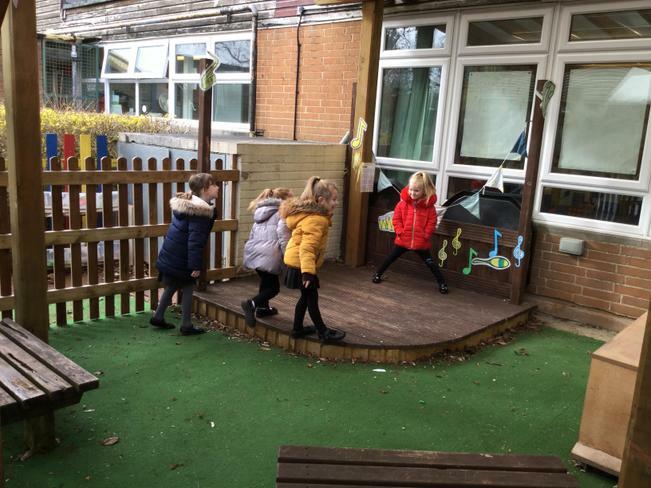 To help us think of new places to include in our story we went for a walk around our school. 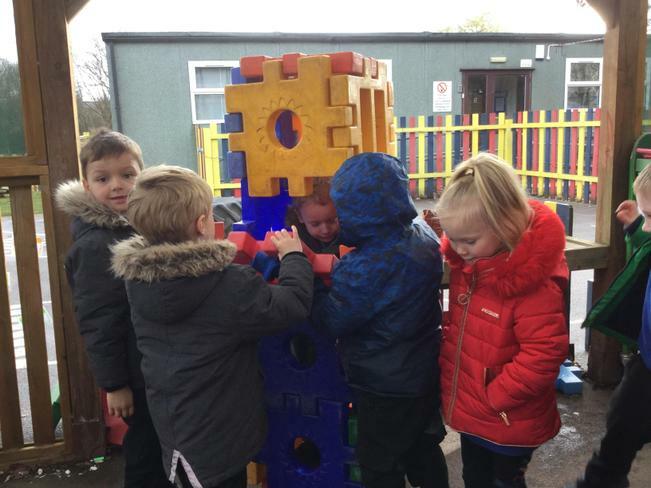 The children saw the office, the library, the field, the hall, and the playgound. 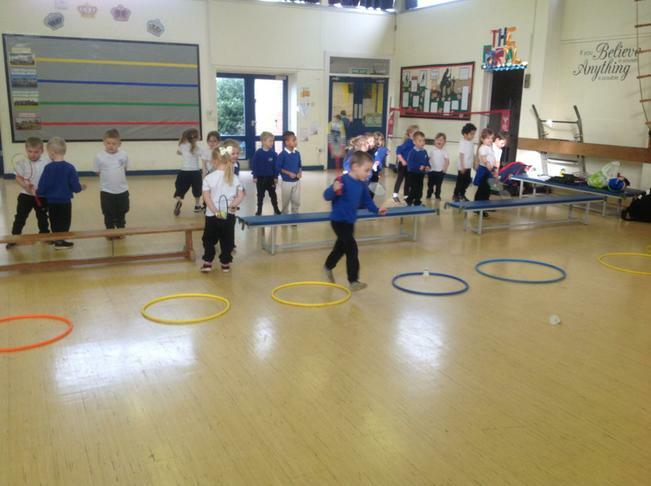 The children also thought about the positional language that could be used to describe Rosie's journey. For example - across the playground and around the field. 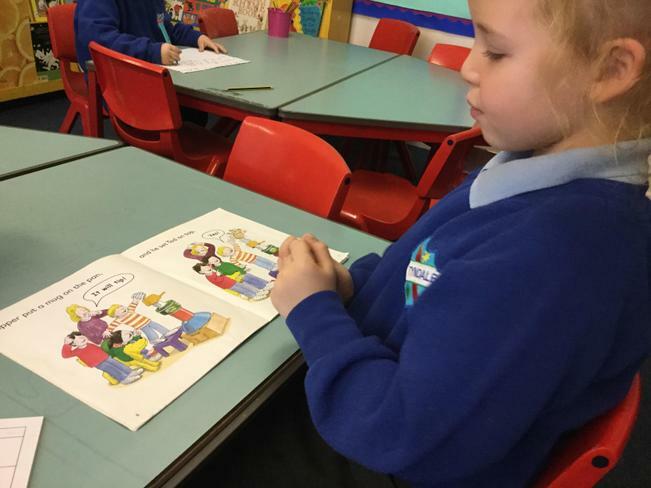 We have been reading in school this week and lots of children have remembered their reading books everyday. 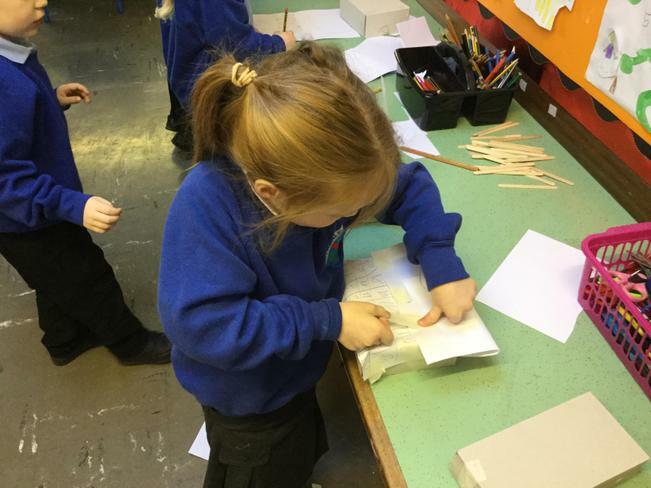 The books that were in school on Friday were changed. If your child did not have their book bag in on Friday please being in on Monday to be changed. 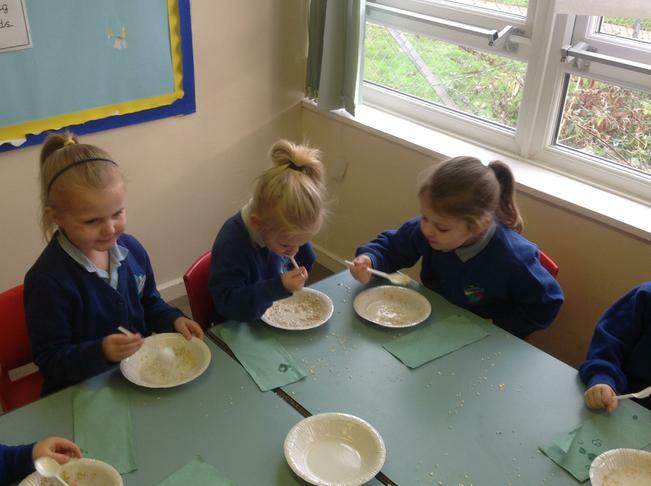 In phonics this week Owl Class have learnt 4 more sounds - 'i, n, m and d'. 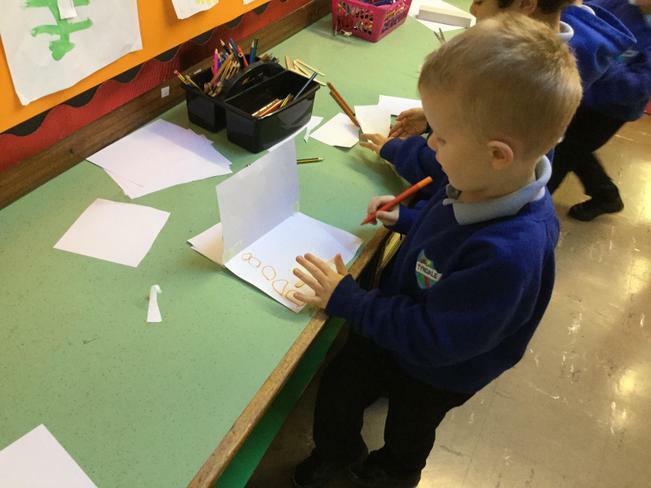 They have been learning how to form the letters correctly and identifying this sound in words. 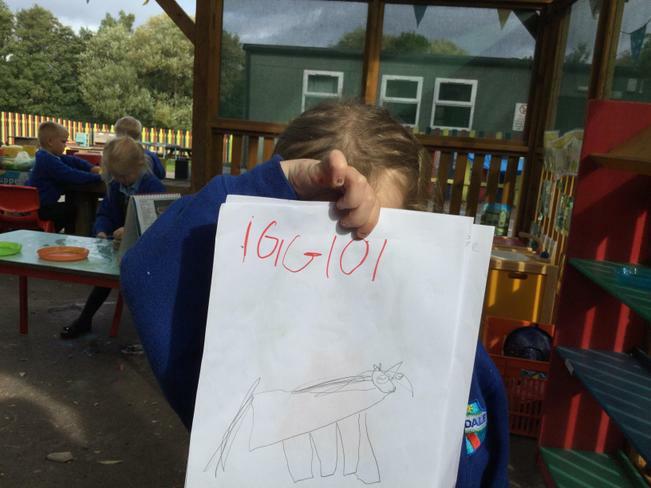 They have also learnt the tricky word 'I'. 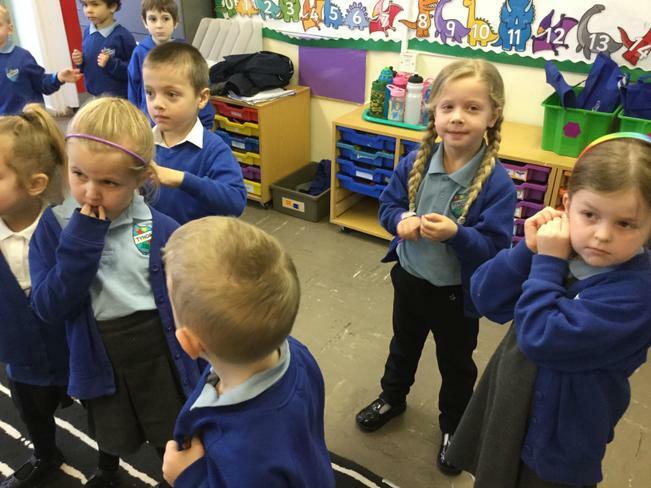 In Maths this week Owl Class have been learning how to count a set of objects accurately. 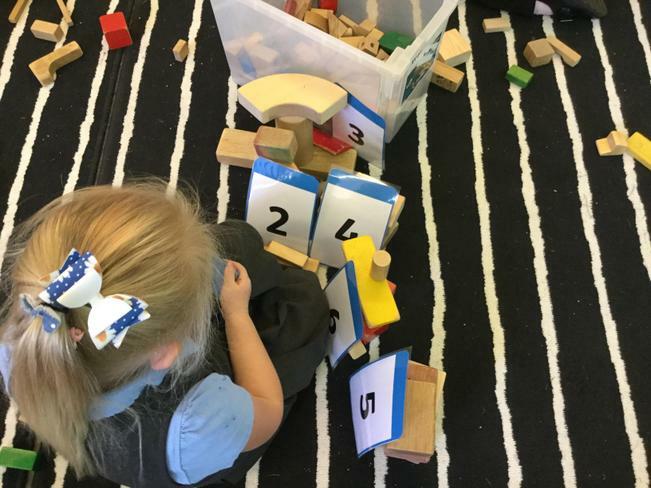 They have learnt that it helps them to line objects up before giving each object a number name. 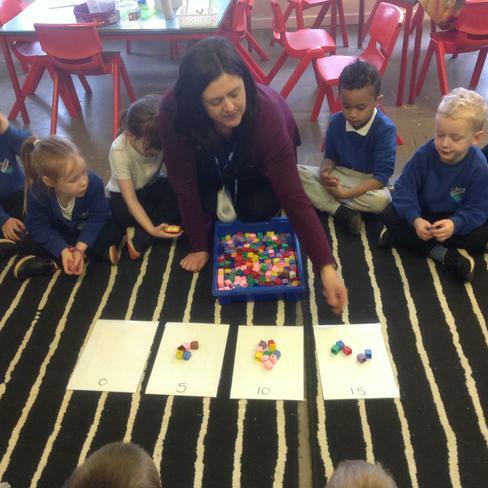 They have also been using magnetic numbers and some children have put the numbers up to 10 in order. 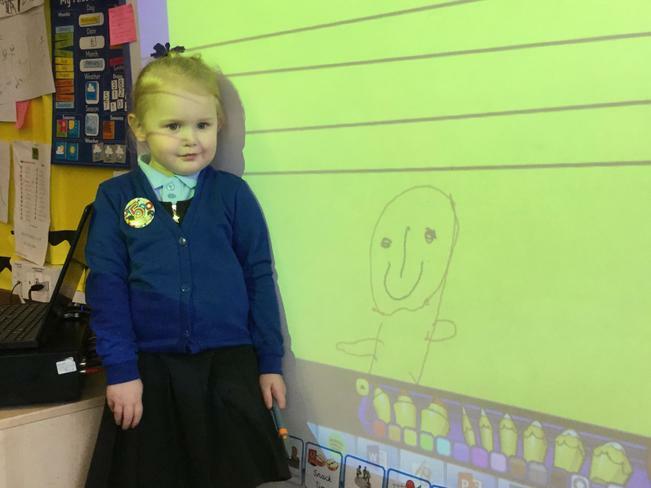 In English this week the children in Owl Class have been learning how to draw their own story maps of Rosie's Walk. 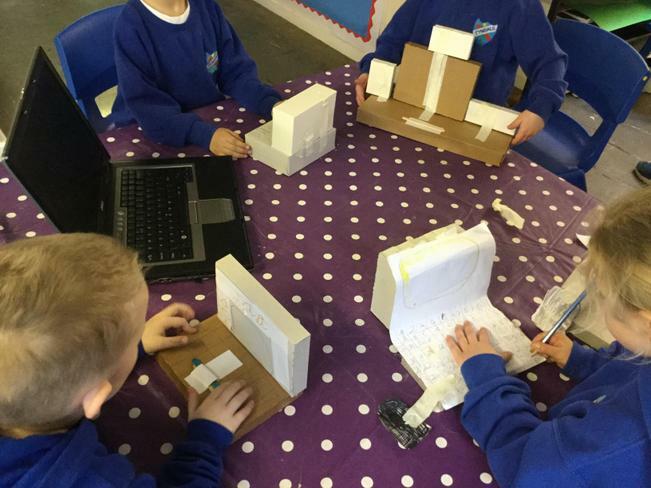 They have used these to record the main events in the story, and have retold the story independently. 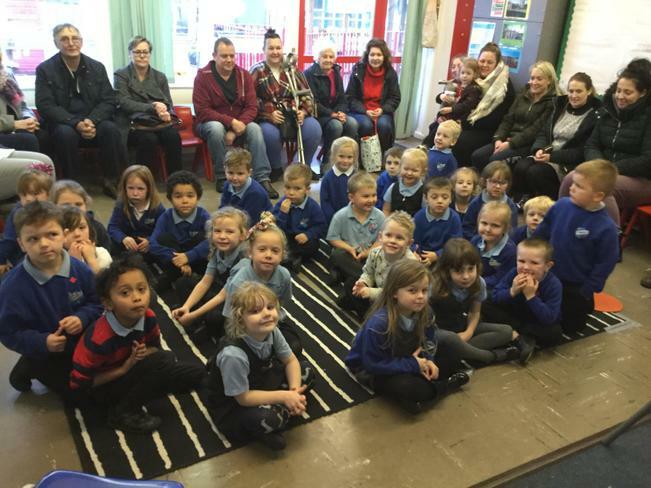 Owl Class attended their first whole school singing assembly. 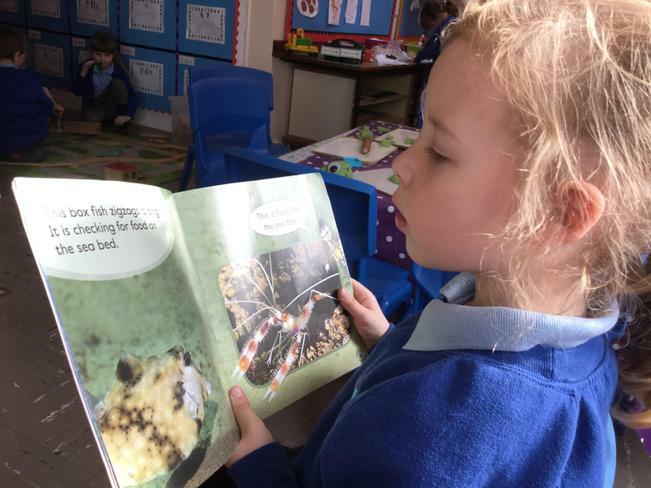 All children in Owl Class have been issued with their first reading book this week. 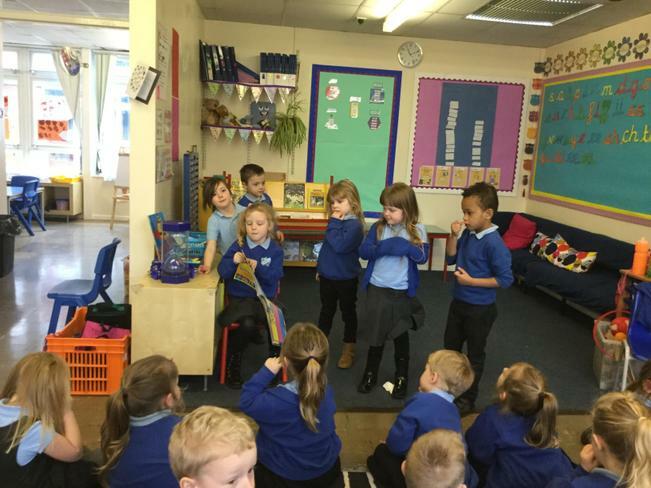 Please could reading books be kept in book bags, and be brought to school everyday. 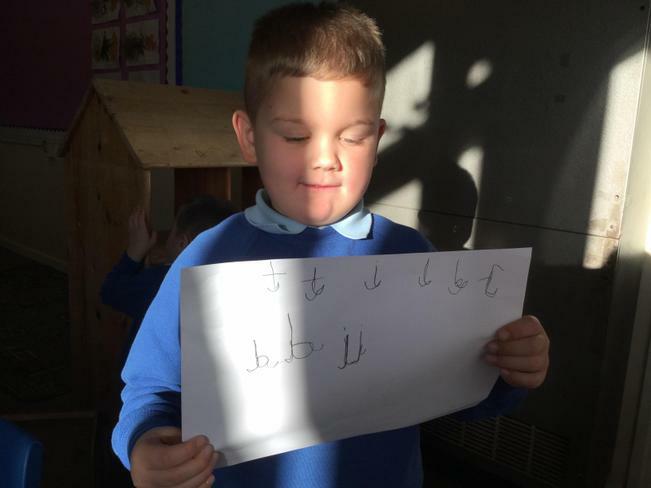 This week in phonics the children have learnt the sounds of the letters s,a,t, and p.
They have been learning to recognise, say and write these letters in pre-cursive handwriting. 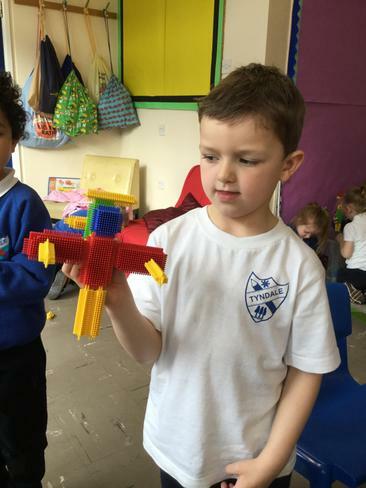 Owl Class have also been learning to talk like robots - 's-a-t' makes 'sat'. 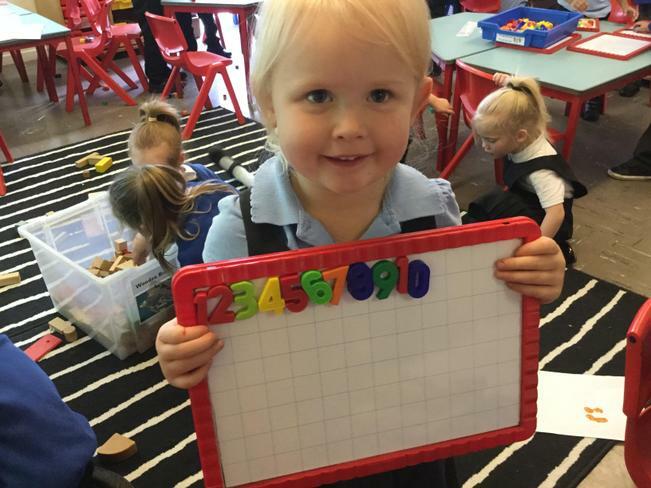 This week in Maths the children have learnt about numbers 1,2 and 3. 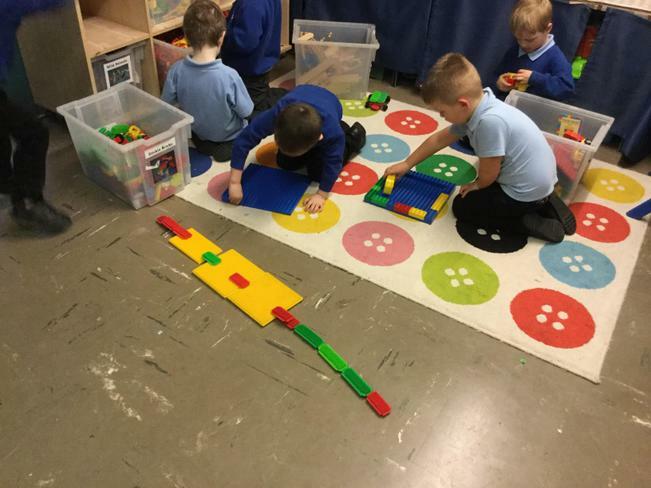 They have watched the 'Numberblocks' to help them learn about the numbers, and have been exploring Numicon on the tables to develop their counting skills. 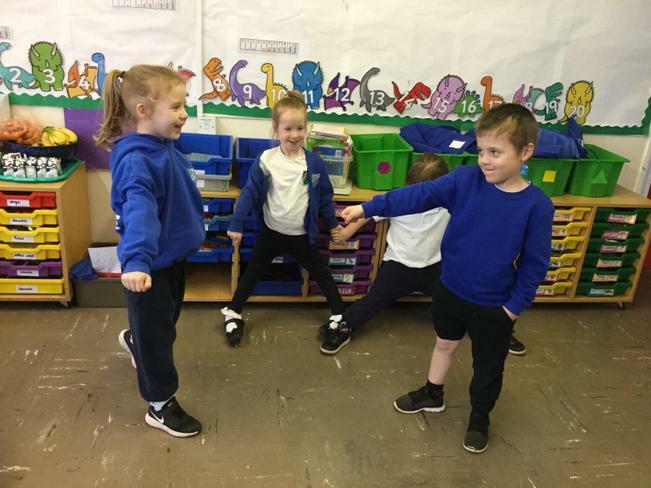 In English this week the children have been introduced to the text 'Rosie's Walk', by Pat Hutchins. 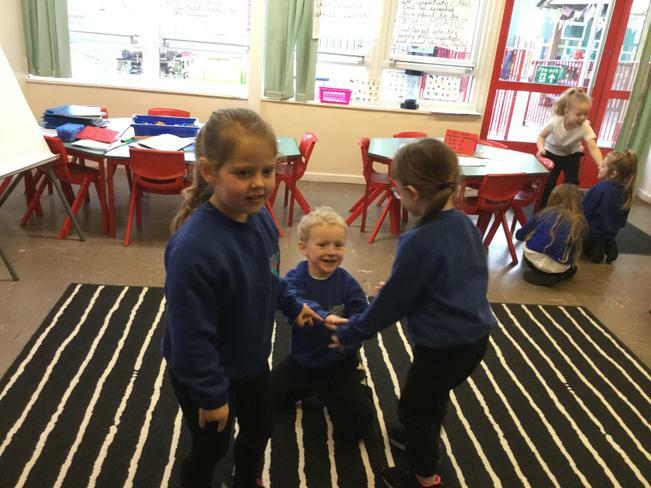 The children have listened carefully to the story, and have been learning story telling actions. They can now retell the story themselves. 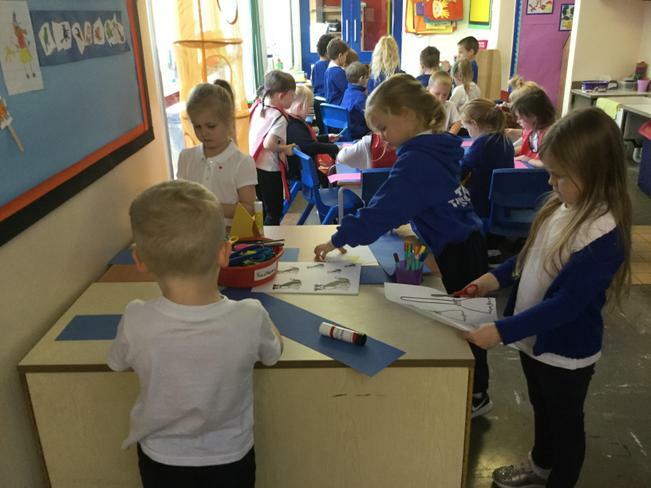 This week the children in Owl Class have been learning how to use whiteboards and pens. 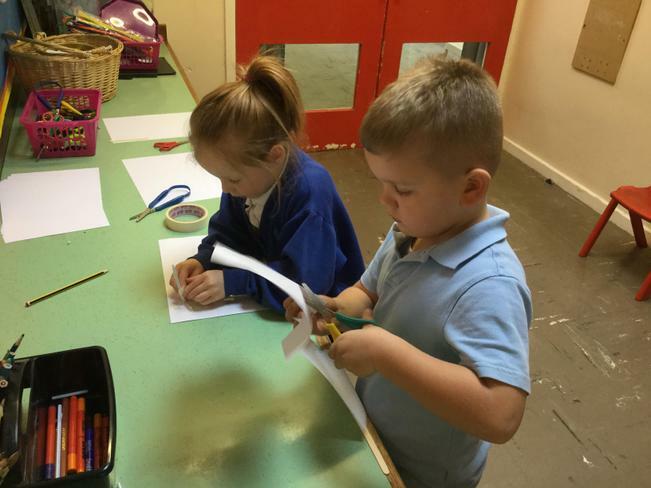 They have enjoyed exploring name writing and mark making. 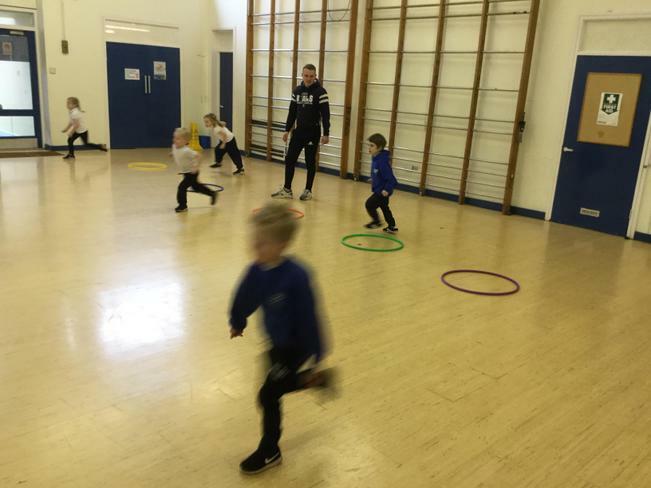 The children learnt how to move like gymnasts with our PE coaches. 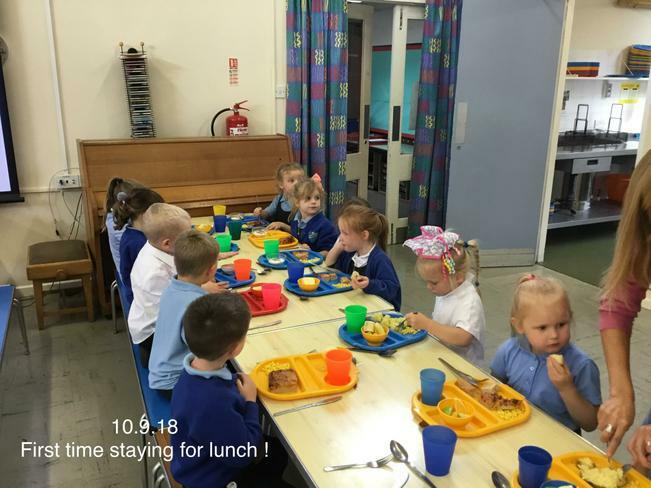 This week the children have stayed for their lunch at school. 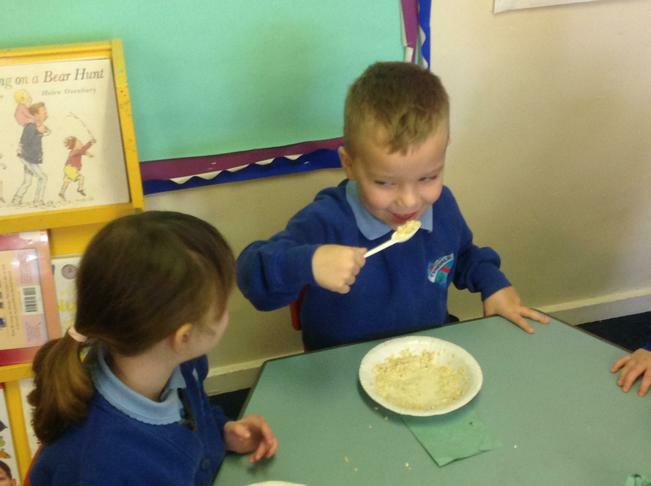 Owl Class have been showing independence at snack time! 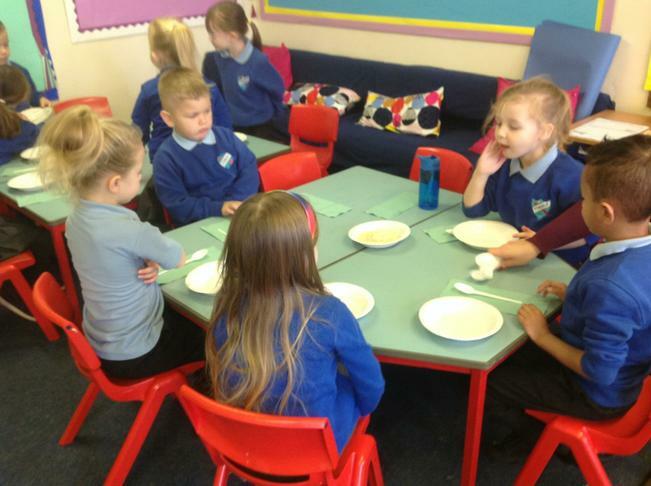 Welcome to all our new children in Owl Class. 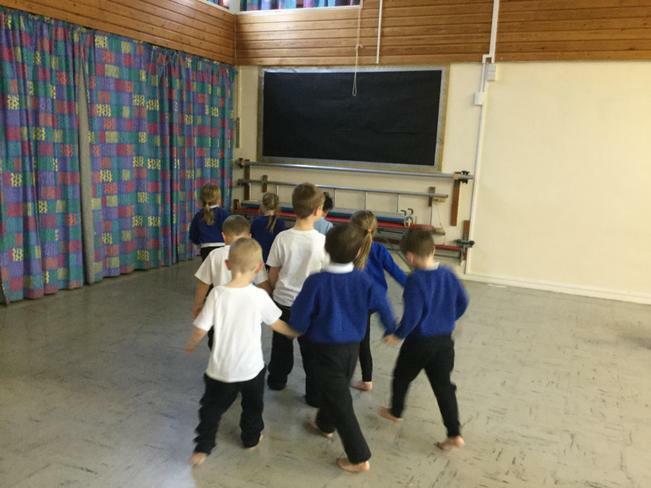 On Monday's Owl Class will be taught by Mrs Pembury and Mrs Ball. 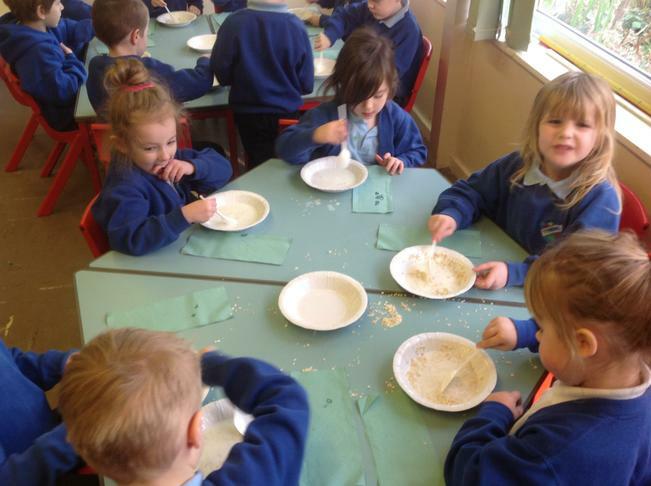 The rest of the week the children will be working with Mrs Milverton and Mrs Beazer. 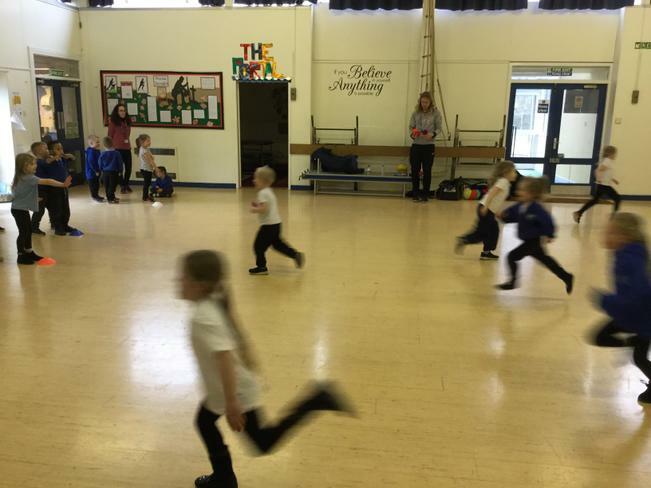 PE - will be on Mondays and Thursdays this term. 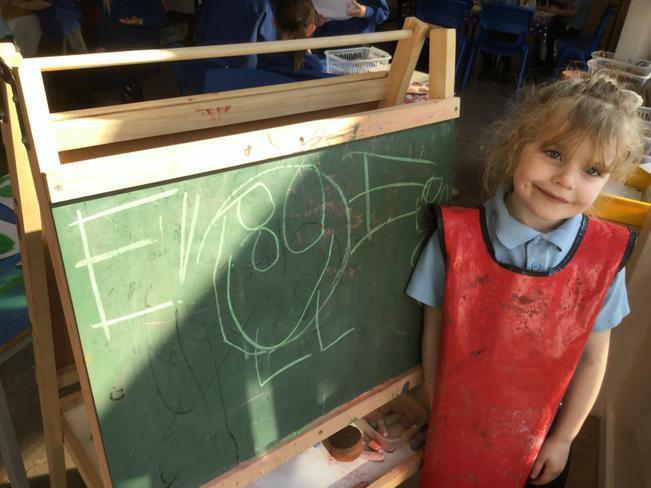 You could help us by ensuring your child has their PE kit in school, and naming every item of clothing. All children require a named water bottle so they can access a drink of water when they are thirsty. Please encourage your child to put their book bag into the correct box in the classroom. We have our own class email! If you would like to contact us, please do so with the secure form below- we will be checking it regularly. We welcome your comments and suggestions.